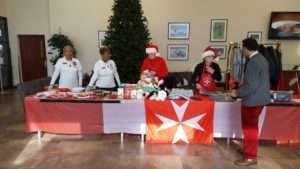 On December 22, 2017, Janice Chance Gold Star Mother Maryland Chapter and VA Volunteer joined members from the Knights of Columbus and other Veterans Service Organization (VSO) volunteers to deliver Christmas gifts to inpatients at the Baltimore Veterans Affairs (VA) Medical Center. 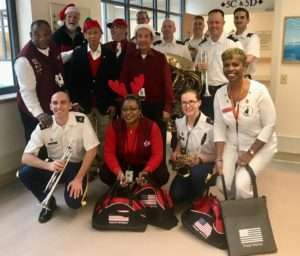 The 78th Army band from Fort Dix, NJ once again provided holiday music and duffel bags that included wonderful gifts, were being delivered on each unit. It was truly an honor to deliver Christmas gifts to some of our nation’s Heroes that probably would not be home in time for Christmas. It was a blessing to spend time talking with them, watching their faces light up, and to receive warm handshakes and hugs. These were gifts that money cannot buy. Many VSOs, which included the Gold Star Mothers Maryland Chapter, and other individuals donated money which enabled the gifts to be purchased and delivered to patients at all of the Maryland VA Healthcare Centers. We are looking forward to continuing to serve and support our Heroes and their families all year long, not just during the holiday season. We Honor and Salute them! 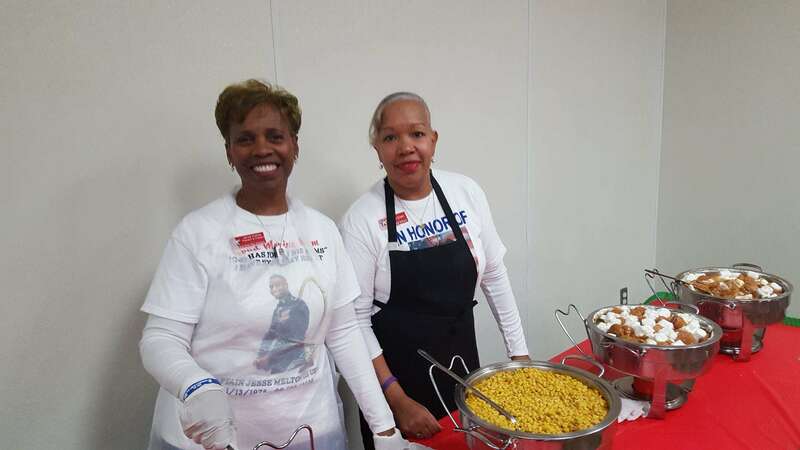 On Monday December 18, 2017, Maryland Chapter Gold Star Moms Janice Chance and Yvonne Green were more than happy to give of their time and talent to serve at the annual MCVET’s Christmas dinner. 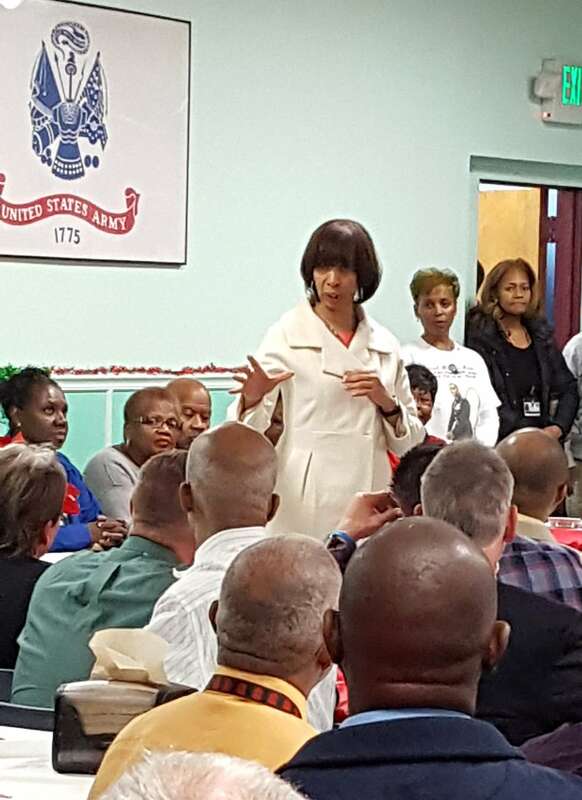 The dinner started with warm wishes and greetings from Baltimore City Mayor Catherine Pugh to the Veterans, family members and staff. 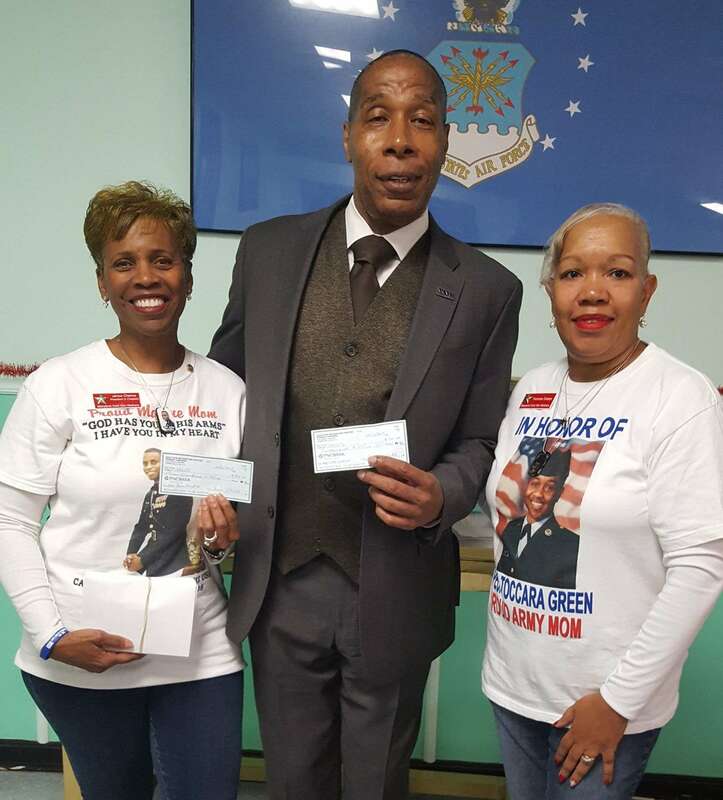 After the Mayor’s greeting, on behalf of the Gold Star Mothers Maryland Chapter, Janice and Yvonne presented Mr. Jeffrey Kendrick, MCVET CEO, with gift cards from Bath and Body Works for the female residents, a $500 check to purchase gifts for the male residents, and a $300 check to help cover the cost of food for their Annual New Year’s Eve Party. After dinner, we also joined with the residents in singing the MCVET version of the “12 days of Christmas”. 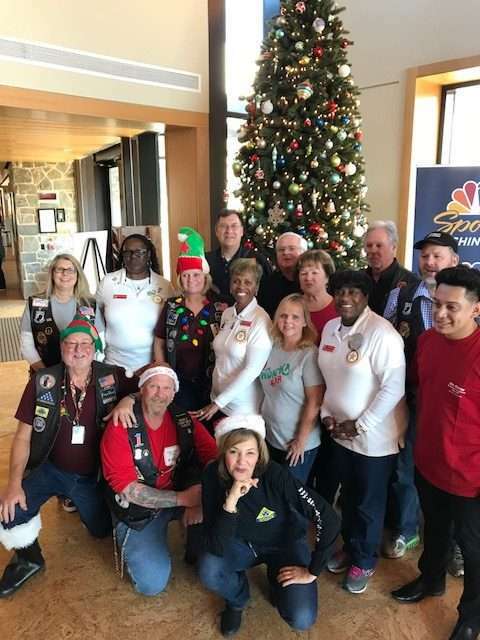 The annual MCVET event brings so much joy not only to the residents, but also to the staff, family members of the residents, and the Gold Star Moms. 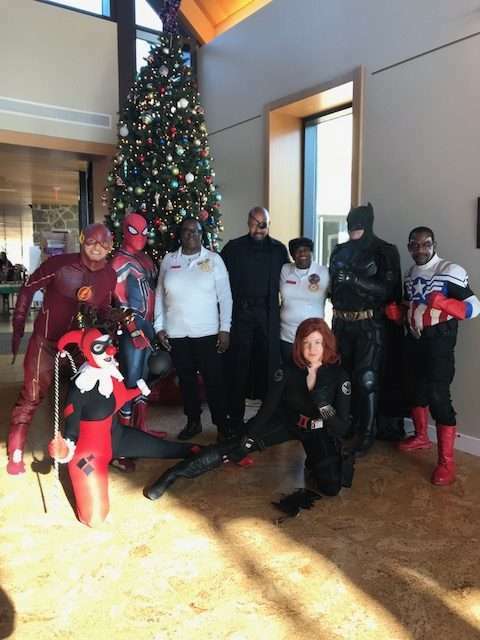 During this time of year, which is one of giving, it does a heart good to see the love poured out to our Heroes who need our support and encouragement. We are committed to supporting them as they continue to work toward their goal of completing the program that will enable them to transition back into their community as productive citizens. We Honor and Salute them. 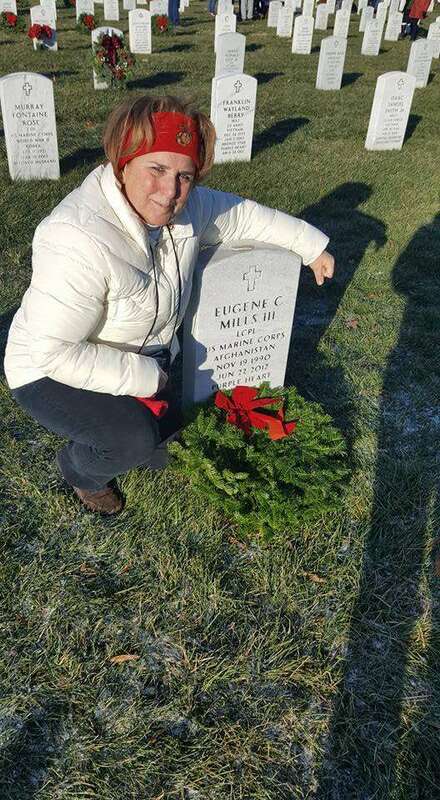 Wreaths Across America’s (WAA) annual events were held at Veterans cemeteries throughout the United States thanks to the WAA founders Morrill & Karen Worcester. 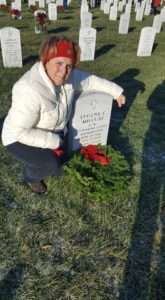 The WAA leaders, WAA team, and volunteers started their journey from Maine on December 10, 2017 and ended their journey on December 16th at Arlington National Cemetery (ANC). 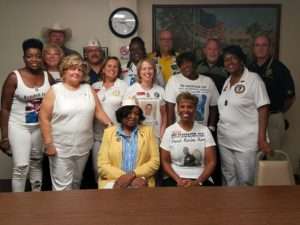 Several National American Gold Star Mothers officers, and other Gold Star family members from across America joined the WAA team on their journey. Maryland Chapter Gold Star member Janice Chance joined the WAA convoy in Grasonville, Maryland on Thursday, December 14th and she attended the Pentagon wreath laying ceremony that was held on Friday December 15th. 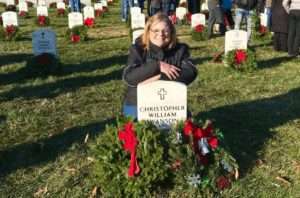 She was given the honor of hanging a wreath in memory of a Hero that was killed during the 9/11/2001 Pentagon attack. 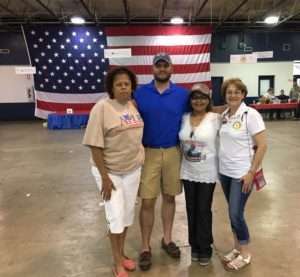 Mr. Kyle Midura, a multimedia journalist for Gray Television, D.C. Bureau interviewed the WAA founders, a few Gold Star family members, and other participants for a story to be televised in order to increase public awareness about the WAA mission. On December 16th, the WAA trucks and convoy of vehicles drove across the ANC bridge and Janice was given the privilege to ride into ANC in one of the Hannaford Company trucks filled with wreaths driven by Mr. Michael Pattee. 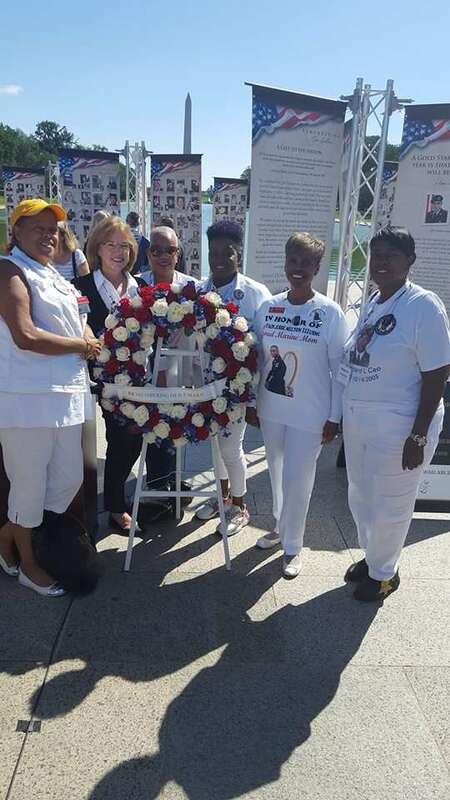 Gold Star Maryland Chapter Moms and Dads, Regina Barnhurst, Yvonne Green (Dad – Garry Green), Theresa Mills, Paula Davis and Kelly Swanson were also present at ANC to lay a wreath on the graves of their fallen Hero, participate in the ceremony, and to also assist with the laying of the wreaths on the graves of other fallen Heroes. Other Gold Star Mothers participated in wreath laying ceremonies and assisted with placing wreaths at their Heroes’ graves at their local Veterans cemeteries. 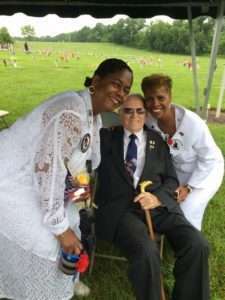 Mrs. Jeanette Middleton Sudano participated at Crownsville Cemetery and Marie Moudry participated at Dulaney Valley Memorial Cemetery’s first WAA wreath laying ceremony. Several military leaders, Active Duty Service members and Veterans also participated and visited with families. 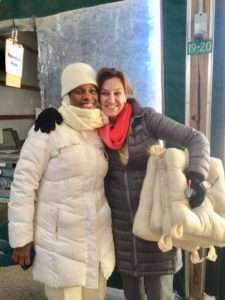 Regina Barnhurst and a few Tragedy Assistance for Survivors (TAPS) members set up a table near Section 60 to provide a complimentary cup of coffee or hot chocolate water and snacks. 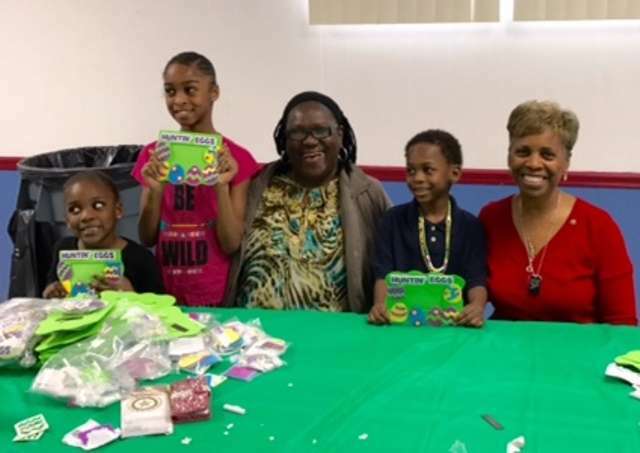 They also provided materials to invite family members to make tree ornaments with the name of their Hero and a message to hang on a tree in Section 60. 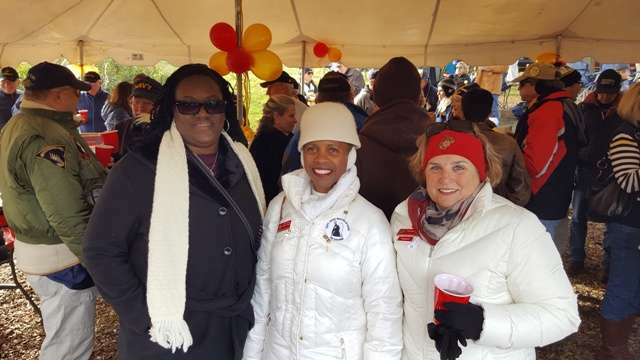 Maryland Gold Star Mothers are grateful that we were able to participate and to Honor and Remember all of the heroes that are interred at ANC and other Maryland Veterans Cemeteries. We look forward to participating again in next year’s annual WAA event. 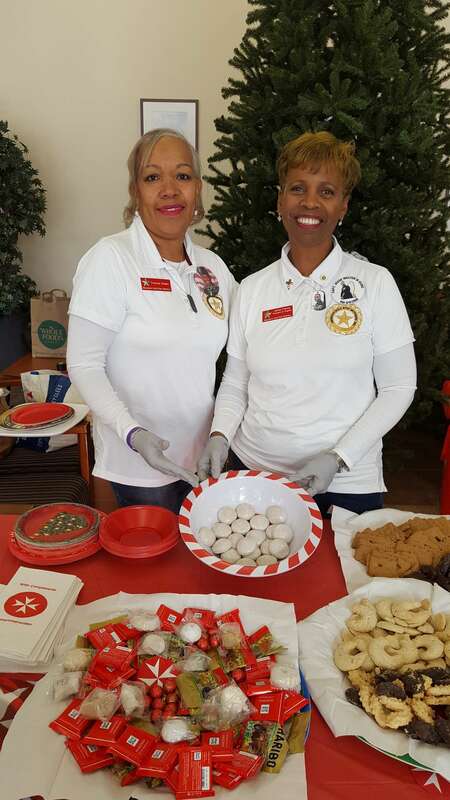 On Thursday December 14, 2017, Gold Star Moms and Dads – Janice Chance (Charlton) and Yvonne Green (Garry) of the Maryland Chapter graciously served our Wounded Warriors at the annual Johanniter’s Christmas event at Walter Reed Medical Center in Bethesda, Maryland. 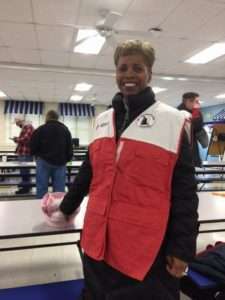 Dr. Inge Guen along with her son Mr.Peter Guen, KJ who are the hosts of the event have been a blessing to Veterans and their families for the past nine years by suppling much needed winter coats (Eddie Bauer), Nike tennis and boots, and clothing that was very much appreciated by all. 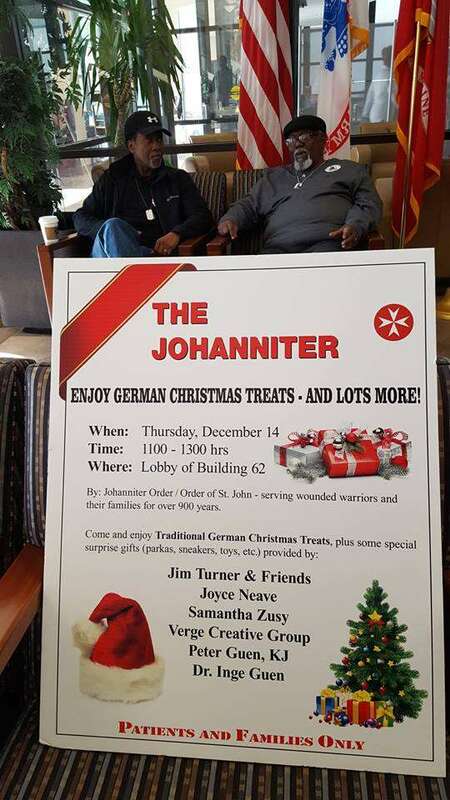 The wounded warriors and their families were then treated to authentic German pastries, cookies, cakes and candies to enjoy. 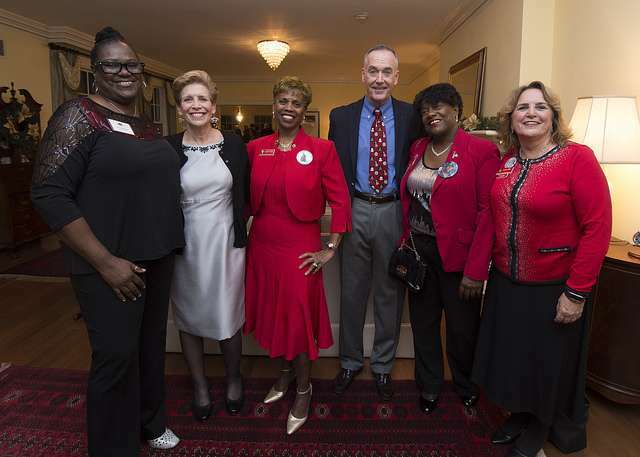 Maryland Gold Star Mothers Janice Chance, Theresa Mills, Donna Robinson and Paula Davis were invited to attend a Special Holiday Reception that was hosted by the Chairman of the Joint Chiefs of Staff, General Joseph & Mrs. Ellyn Dunford Jr. and the Vice Chairman of the Joint Chiefs of Staff, General Paul & Mrs. Ricki Selva at the Chairman’s residence. In attendance were also members of the Chairman’s staff, members of several veteran, military and survivor support service organizations. 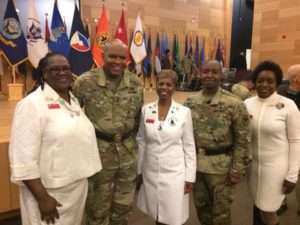 Generals Dunford and Selva both expressed their thanks to their staff and invited guests for their service, support and for attending the reception. 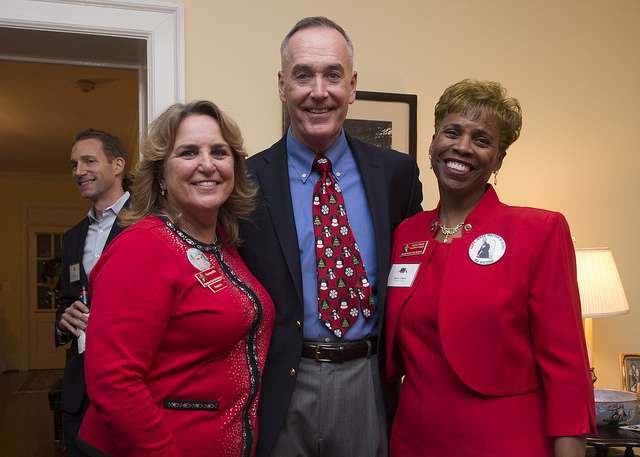 During his remarks, the Gold Star Moms were pleasantly surprised when General Dunford gave special recognition to the Maryland Gold Star Mothers and Families. It was an honor and privilege to spend time in a relaxing and intimate setting that afforded us the opportunity to spend quality time talking with Generals Dunford, Selva, their wives and the other guests. The fellowship was wonderful, the food was delicious and we were entertained by the United States Army male chorus. They sang a variety of our favorite familiar Christmas Carols. The house was beautifully decorated with festive Christmas trees that held mostly Marine Corps ornaments and replica ornaments of the base’s “Generals’ Row” that has housed former Joint Chiefs of Staff, and entertained many foreign dignitaries, celebrities and senior government officials. The house, which was built in 1908, is located on Fort Myer’s ridge, and overlooks a scenic view of the Washington Monument, Capital and our beloved Heroes that are laid to rest on the hallowed grounds of Arlington National Cemetery. It truly was a memorable evening. 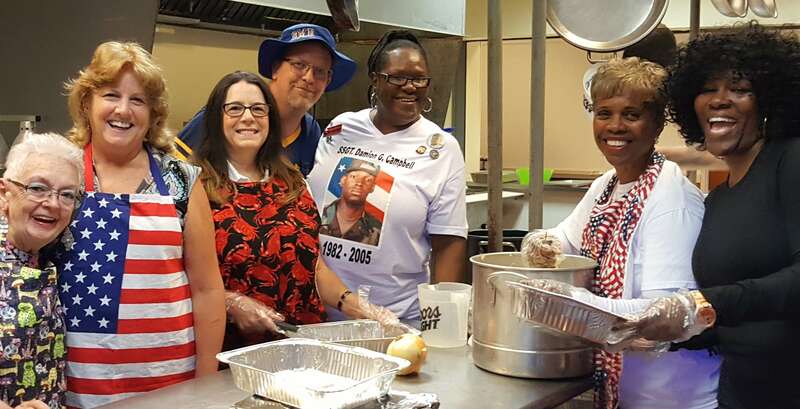 Mission Barbecue in Laurel served breakfast this morning to Gold Star Mothers, Veterans and active service members. We also supported the Toys for Tots Drive as local Marines were present to thank donors. Mothers who attended were Stephanie White, Gina Barnhurst, Theresa Mills, Janice Chance, Michelle Murphy, Donna Robinson, Lauren Seidler and Paula Davis. 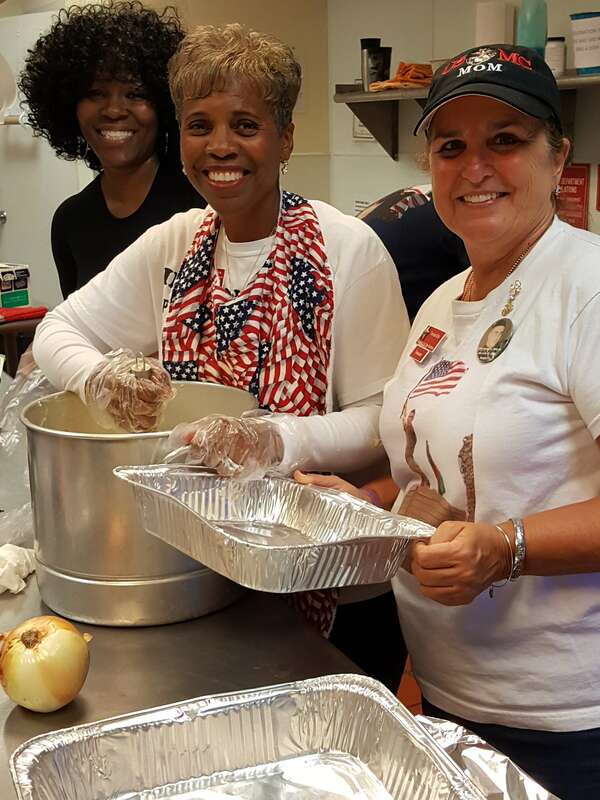 Maryland Gold Star Mothers were invited to assist with serving dinner to the residents and staff at the Maryland Center for Veterans Education and Training (MCVET) facility. 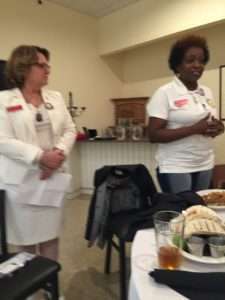 Janice Chance and Donna Robinson represented the Chapter. Prior to the meal, Mr. Jeffrey Kendricks, Executive Director recognized all of the MCVET supporters and invited them to speak. Janice was asked to speak on behalf of the Maryland Chapter. It was a Blessing not only to serve, but to also dine and spend time talking with and thanking our heroes for their selfless service. Several of them remembered us from recent past events. It was great to see the smiles on their faces and to hear their laughter. 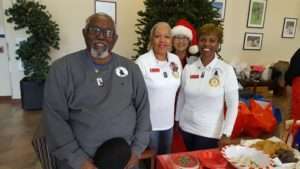 The residents and staff expressed their appreciation for the Maryland Chapter’s continued support and are looking forward to members returning to participate in their Christmas dinner next month. We look forward to continuing to serve and support our Heroes. 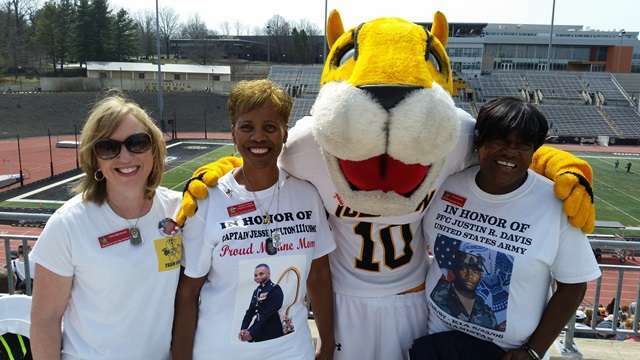 Towson University President Kim Schatzel and the Towson University Athletic Department honored seven Gold Star family members (six moms, two dads, and siblings) at Towson’s Third Annual Military Appreciation Day football game. 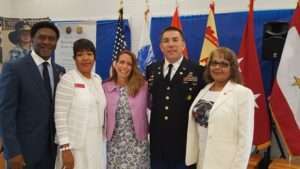 The families were hosted at a luncheon honoring CSM Wardell Turner, US Army. 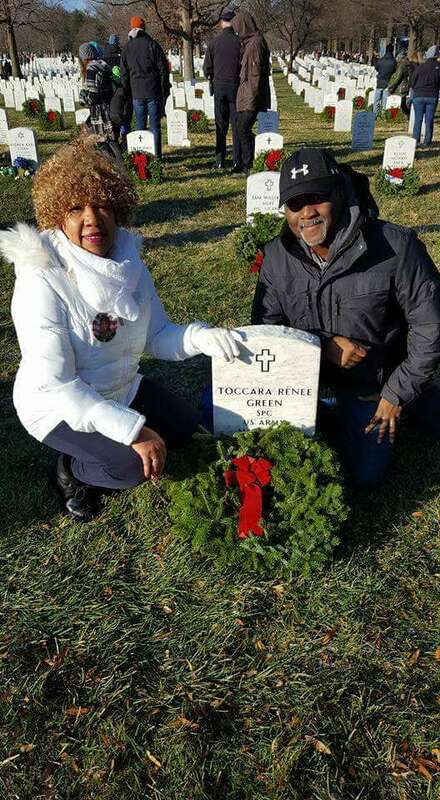 Gold Star Wife, Katherine Turner, whose husband Wardell had played football for Towson University and then was deployed to Afghanistan, where he was killed also was honored. There is a scholarship in his name. We received the VIP treatment as our ROTC cadets escorted each of us throughout our entire time at the event. Their heroes’ biographies were read, as photos appeared on the JumboTron. Chapter president Janice Chance and husband Charlton, Secretary Regina Barnhurst, and members Paula Davis, Tracy Miller, and Donna Robinson as well as Sam Sudano and children were honored. The Suited to Succeed and Maryland Veterans Education & Training Center (MCVET) held their 2017 Fall Fundraiser at the Radisson Hotel in downtown Baltimore, Maryland. Suited to Succeed is a 501 (c) nonprofit organization based in Baltimore. Their mission is to improve the economic independence of women experiencing hardship by providing professional attire, career development and life skills training, networks of support and tools to help them to become successful in life. MCVET is also a 501 (c) nonprofit corporation designed to provide homeless veterans and other veterans in need with comprehensive services that will enable them to rejoin their communities as productive citizens. 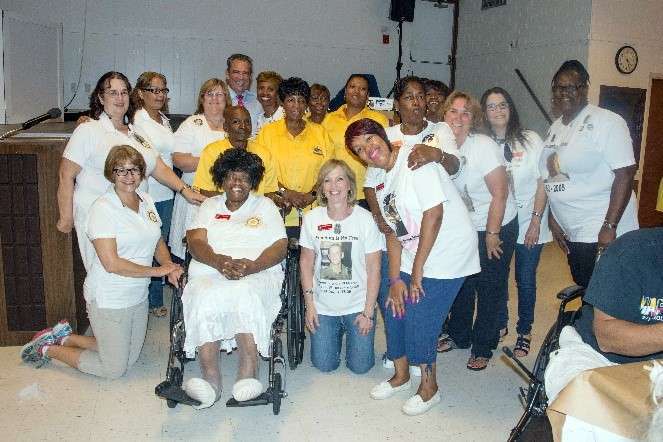 Gold Star Mothers Maryland Chapter members were invited to attend. Janice Chance represented the Maryland Chapter. 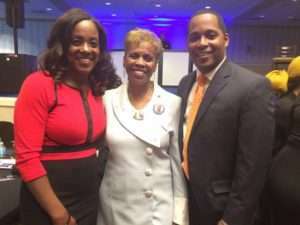 The Emcees were Kelly Swoope, evening news anchor for ABC 2 -WMAR- TV and Jonathan McCall, news anchor for WJZ-TV 13 (CBS Baltimore). Grammy nominated Jazz Vocalist Maysa Leak was the featured guest vocalist. 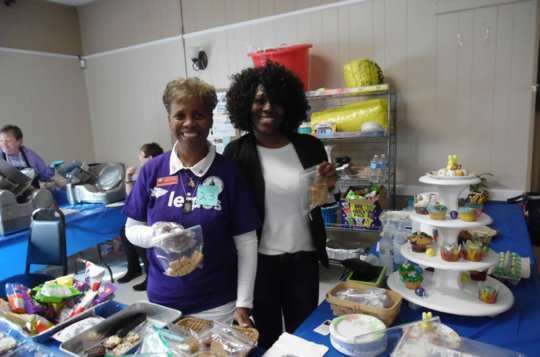 There were several specialty vendors, gourmet food, hors d’oeuvres and a variety of silent auction items. Mr. Charles Dutton, a Baltimorean and an award winning actor and director, Chris Van Hollen U.S Senator and Baltimore City Mayor Catherine Pugh were Honorary Hosts & Chairs. The event was well attended and it was truly a memorable evening. 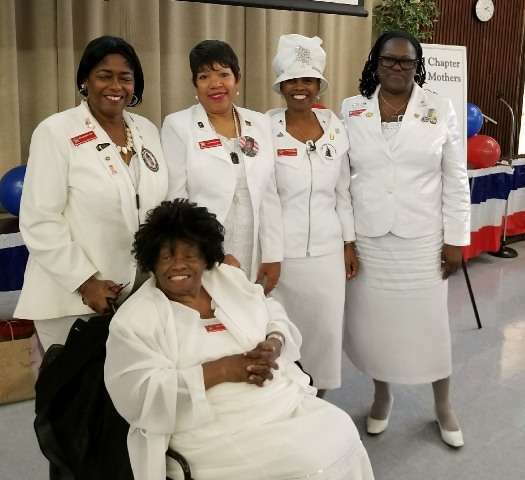 Members of the Gold Star Mothers Maryland Chapter, Inc. were invited to attend a Veterans Day Service and Luncheon at the Colonial Baptist Church (CBC) on November 12, 2017. 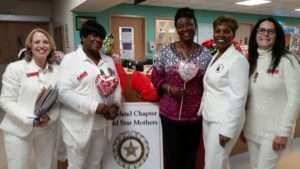 The following mothers attended: Rosemarie Ceo, Yvonne Green, Janice Chance, Edith Hines, and Donna Robinson. 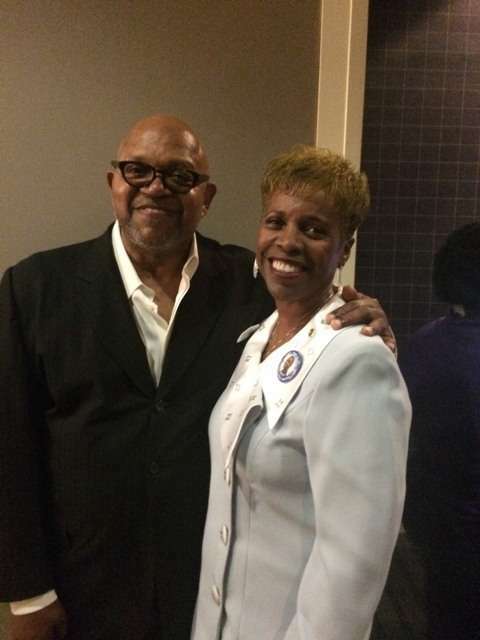 Two members of the American Legion Post 19, Solomon Campbell and Paulette Dorsey, presented the Colors. 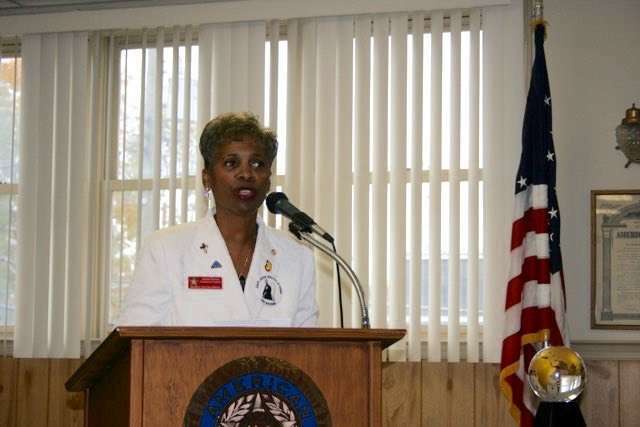 Dr. Dee Jones, Nursing Education Specialist for the Veterans Administration at the Perry Point VA sang the National Anthem and the Battle Hymn of the Republic, and a quartet of CBC male veterans sang a rendition of the Old Rugged Cross that helped to set for the tone the service. George Owings III, Maryland Secretary of Veterans Affairs gave a stirring message in support and appreciation of Veterans. He also brought greetings and read a Veterans Day Proclamation from Governor Lawrence Hogan, followed by a great inspirational message from the Pastor Dr. Robert J. Anderson, Jr. After the service, a luncheon was held in honor of the Veterans and their families. The Vietnam Veterans were recognized and presented with a 50th year of the Vietnam Veteran War special Commemorative Challenge coin by the members of the Maryland Chapter that they had especially made in honor of Vietnam Veterans. They also rendered a Mom’s hand salute. The Vietnam Veterans expressed their sincere appreciation. One of them stated that the luncheon and program was the best that he had attended and is looking forward to attending next year. 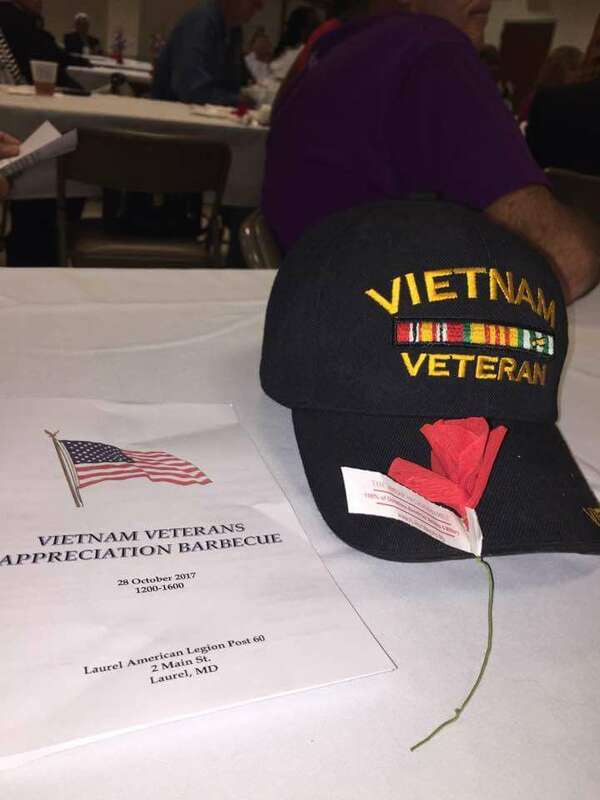 The Maryland Chapter members were also recognized during the service and the luncheon and were once again provided with the honor to meet and thank many of the Veterans and their families. Historically, Veterans Day was officially established as the 11th month, the 11th day at the 11th hour. This proclamation was made in effect six months after the ending of World War I. 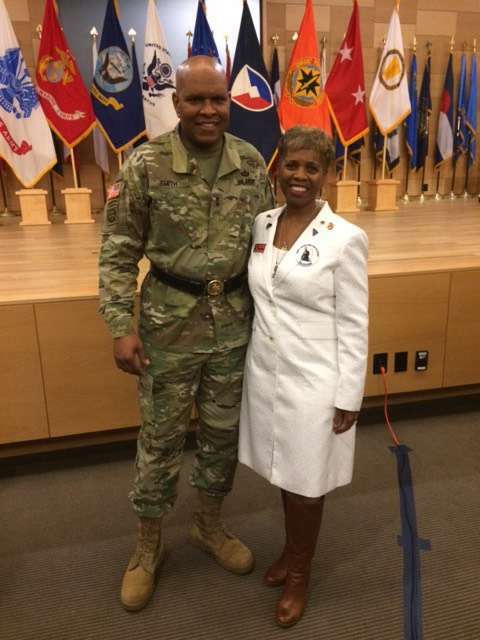 On November 8, 2017, Gold Star parents Garry and Yvonne Green were in attendance at the annual HUD Headquarters Veterans Day ceremony. 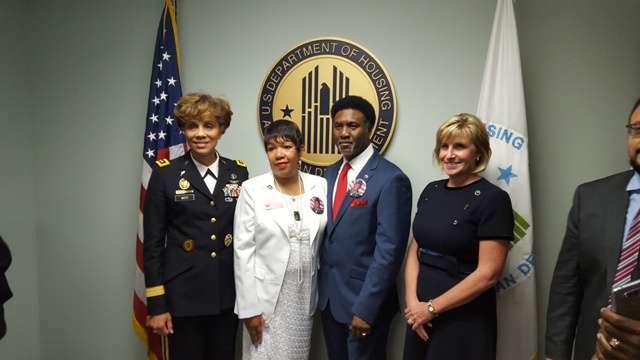 The ceremony started with the Welcome given by Deputy Secretary Pamela H. Patenaude in absence of HUD Secretary, Benjamin Carson due to the recent passing of his mother. 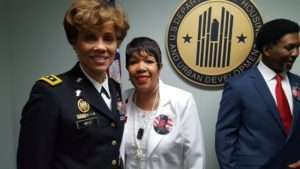 The platform was shared by Lieutenant Colonel Clydellia S. Prichard-Allen – Chief, Military Personnel Division; Army Cyber Command who also has a twin sister LTC Clydea M. Prichard-Brown – Battalion Commander 836th Transportation in Japan. They made history by being the first set of female siblings to be in battalion command at the same time. 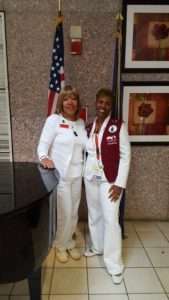 Also on the platform was Sue Fulton -Executive Director (Women in the Service Change Initiative) 1980 graduate of West Points, which was the first class to admit women and was honorably discharged at the rank of Captain. The keynote speaker of the day was Lieutenant General Nadja West, 44th U.S. Army Surgeon General and Commanding General of the U.S. Army Medical Command. 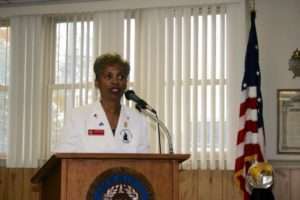 She is the first African American Army Surgeon General and was the first African American female, active duty, Major General in Army Medicine. She is also the highest ranking female to have graduated from the U.S. Military Academy. General West also shared that she was an orphan adopted by a military family and is 1 of 12 adoptees. Her message for the day was very motivating. Gold Star Mothers Maryland Chapter were invited to the United States Naval Academy’s Class of 1973 Marine Corps Birthday Celebration tailgate party and football game. 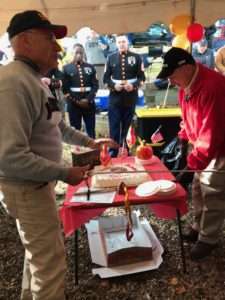 Every year, the Marines of this class sponsor the last game of the season, which normally is around the time of the Marine Corps birthday. Rob Bender, who is not only a class member, but is also a team member of the Travis Manion Foundation in Pennsylvania, invited Janice Chance, Theresa Mills and Donna Robinson to celebrate as the first piece of cake was cut and presented to Janice as the honorary guest. Three Marines from the 4th Combat Engineering Battalion Baltimore Reserve Unit assigned to the Toys for Tots project were also present to collect toys. 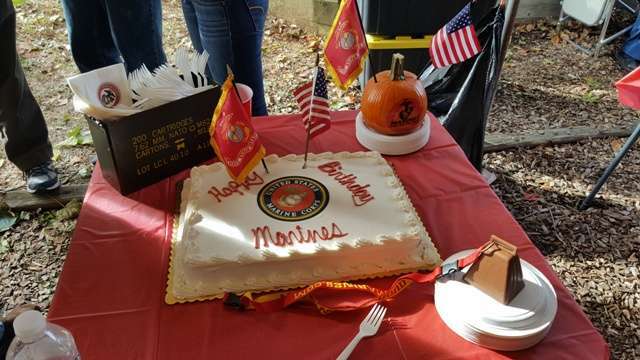 One of the Marines received honors for being the youngest marine during the cake cutting ceremony. 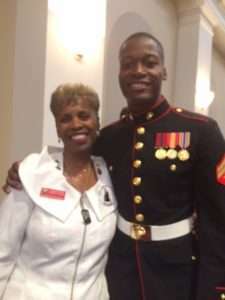 Prior to the ceremony, Janice was pleasantly surprised when she learned that her son Captain Jesse Melton III started his Marine military career at the same reserve unit in 1997. We were also thrilled that Navy beat SMU 41 to 40! It was an exciting game. 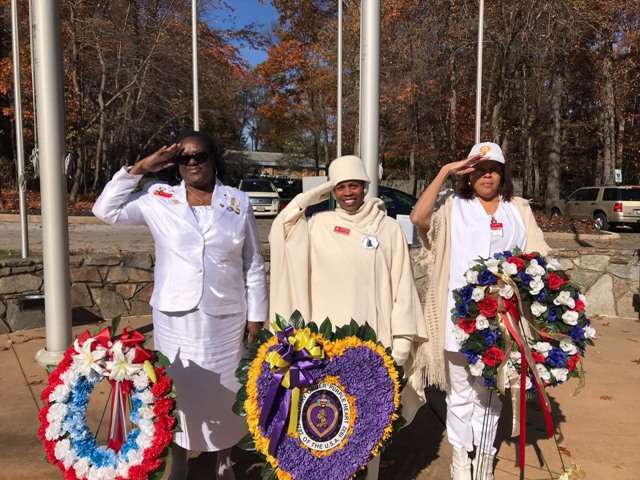 Gold Star Mothers Maryland Chapter members Joyce Goode, Donna Robinson and Janice Chance attended the Annual Garrison Forest Cemetery Veterans Day Program on November 11, 2017. The Maryland Center for Veterans Education choir sang the National Anthem in addition to several other Patriotic songs that helped to set the tone for the program. A J.R.O.T.C team from one of the local high school’s served as the Color Guard. 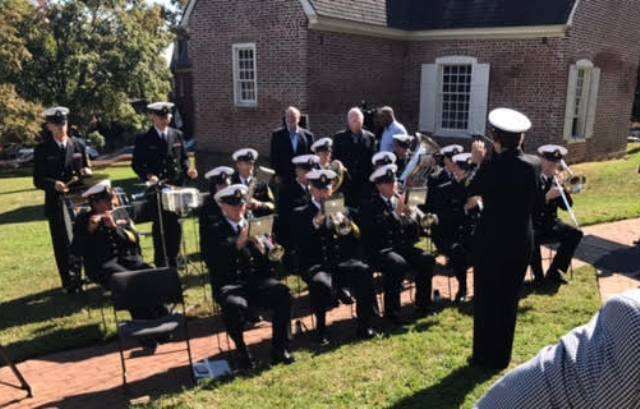 A letter was read that was written by Senator Ben Cardin expressing his thanks to the Veterans for their Service and Sacrifice, and a Veterans Day Proclamation written by Governor Lawrence Hogan was also read. The keynote speaker was Mr. William Miller, VFW Maryland State Commander USAF Veteran who gave an inspirational message. 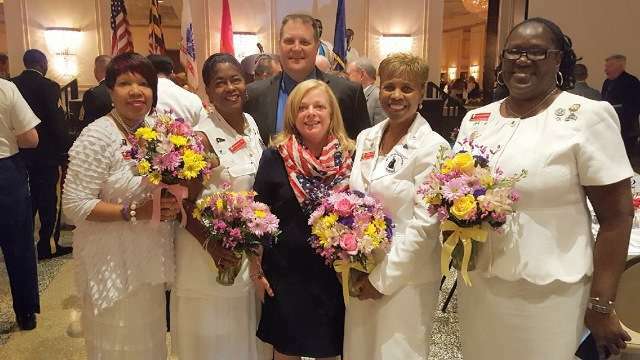 After the message, the Gold Star Mothers participated in the Wreath Laying Ceremony that was followed by a 21 gun salute by the Maryland National Guard Joint Honor Guard and the playing of TAPS by Dr. John Pursell, SMSgt USAF (Ret). As usual it was a great program that provided an opportunity for the Gold Star Mothers and other attendees to Honor and Salute our Heroes. 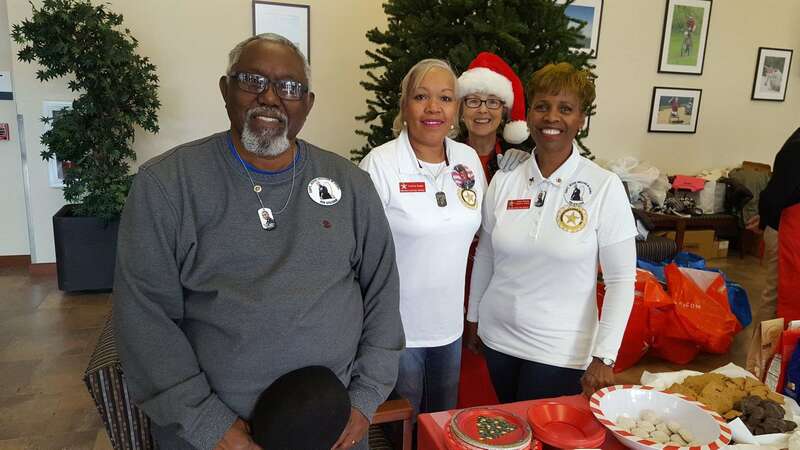 After the program the American Legion Post 122 members hosted a luncheon at their post. 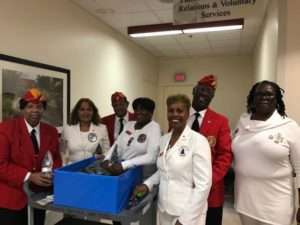 On November 10, 2017, Gold Star Mothers Maryland Chapter members Donna Robinson, Paula Davis, Elsheba Khan and Janice Chance teamed up with three members of the Marine Corps league Baltimore detachment Earl Ruff, Marian James and Ray Vaughn to visit and distribute Special hats to Marine Veteran in-patients. November 10th was the 242nd Birthday of the Marine Corps. All of the Marines expressed their thanks for our visit, the gift of a special hat with the Marine Corps Insignia, and our words of thanks. It was an honor to meet and visit with our Heroes and to thank them for their Selfless service and Sacrifice to our nation. 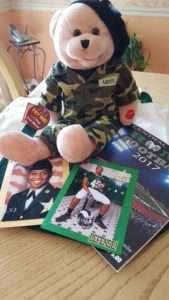 On Thursday November 9, 2017, Maryland Chapter Gold Star Moms Janice Chance and Yvonne J. Green spent the morning spreading joy to Maryland Veterans as they came to the VA Hospital in downtown Baltimore for their medical visits. 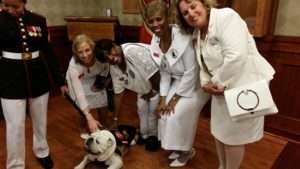 While the VA Hospital does not allow pictures due to privacy rights, all were truly happy to receive “ray of sunshine”. A Salute to Service Luncheon for Veterans and Police Officers was organized by the Business Advocates for Veterans. Business advocates for Veterans is a non-profit corporation, a network of businesses assembled for the purpose of assisting veterans to find employment and promoting the hiring of veterans. 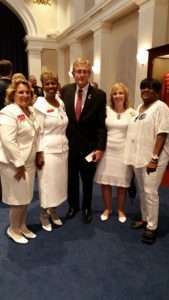 Gold Star mothers were also invited to attend the luncheon. Donna Robinson and Janice Chance represented the Gold Star Mothers Maryland Chapter, Inc. 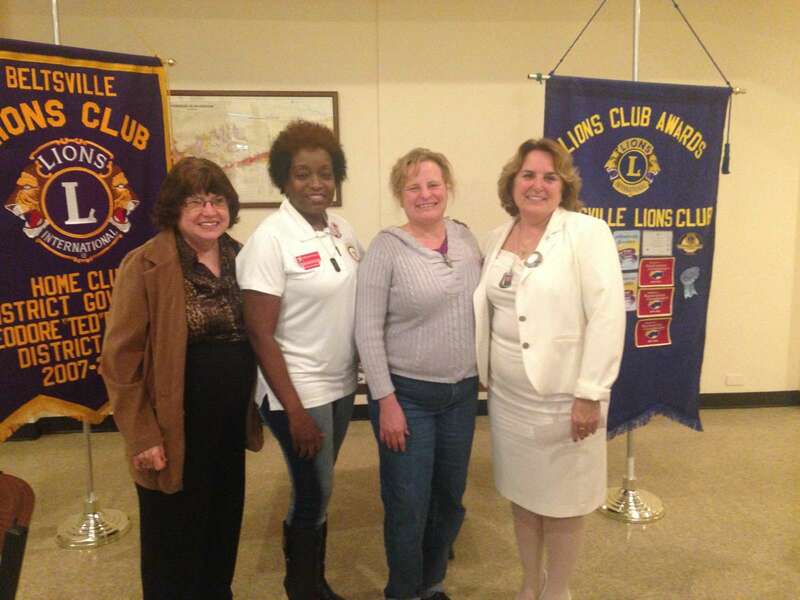 The luncheon was held at the American Legion Post 31 located in Westminster, MD. The event was supported by the members of the post and members of the women’s auxiliary who assisted with serving the food and many other duties. The event was hosted by Janney Montgomery Scott LLC. Mr. Todd Mitchell served as the chairman of the committee and master of ceremony. All of the Veterans and their families were recognized. Every veteran stood and gave their name, branch of service and years that they served. There were several WWII Veterans in attendance who received a hearty round of applause, a few Korean War Veterans, Vietnam Veterans along with many veterans from other conflicts. Many of the police officers in attendance also served in the military prior to joining the police force. Special recognition was given to the Police Officer of the Year, Michael Beaumont, Westminster City Police; Veteran of the year, Alvin Schmidt; Veteran Friendly Employer of the year, and Tri-County Roofing & Sheet Metal (Michael & Rebecca Drayer). Janice received an unexpected surprise. 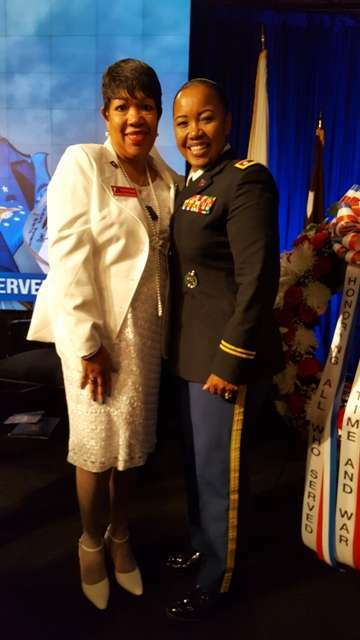 She was recognized and presented with a beautiful award with the following words printed “God’s Angel To Our Veterans” and a beautiful round coin with a star in the center surrounded by gold stars. Janice was also asked to give a few remarks. Janice was followed by the guest speaker, Mr. Sean P. Jensen, USMC Veteran and President of Polu Kai Services, LLC. He is also the author of a book entitled “Sergeant to CEO”. He overcame much adversity; surviving the foster care system, He served eight years in the Marine Corps achieving the rank of Sergeant and after his military career, Sean started a construction and environmental services company. 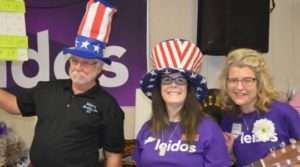 45% of his employees are veterans. He gave an inspirational message and at the end of the event autographed a copy of his book for all of the attendees. 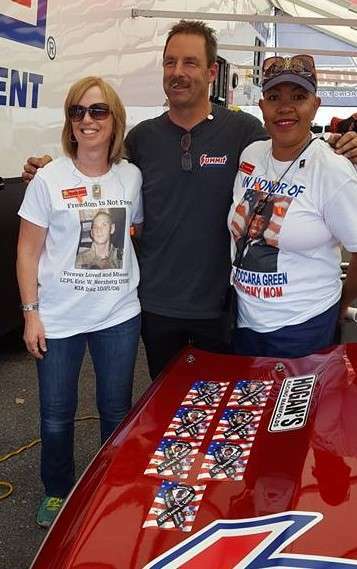 It was an honor to support our heroes and their families. Next year the committee hopes that more mothers and gold star family members will be available to attend. 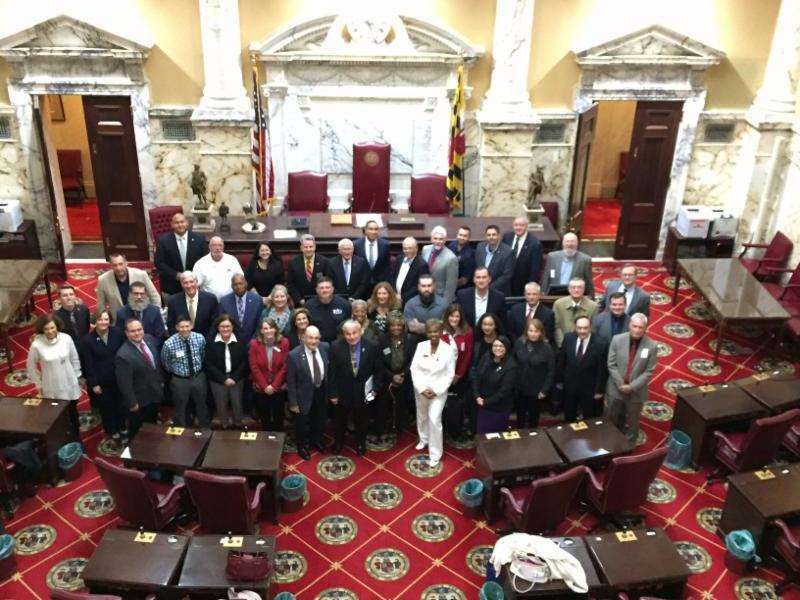 The Maryland General Assembly Veterans Caucus ( MGAVC) hosted a Veterans Summit In Annapolis in the Senate Office building. The Caucus members invited over 100 veterans service organizations representatives and veterans to participate. 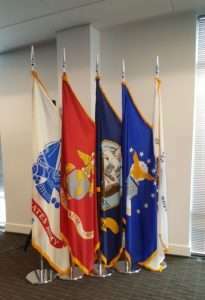 The mission of the MGAVC is to study, develop and promote legislation designed to improve the quality of life for veterans in the state of Maryland in the areas of benefits, employment , education, economics , training and health, and to assist the Maryland Department of Veterans Affairs in achieving its mission and goals , on behalf of all veterans in the State. Five work groups were formed with approximately 10 team members from the individuals that responded by the designated registration date. 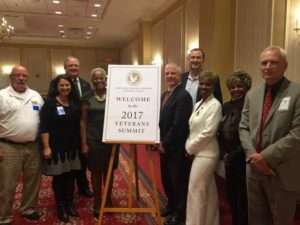 The goal of the summit was to identify the top priorities within each of the following five separate categories: Health/ Mental Health , Education, Employment & Business, Taxation and Personal Matters. Senators Steve Waugh, Will Smith and Delegate Pat Young welcomed the group and gave opening remarks. 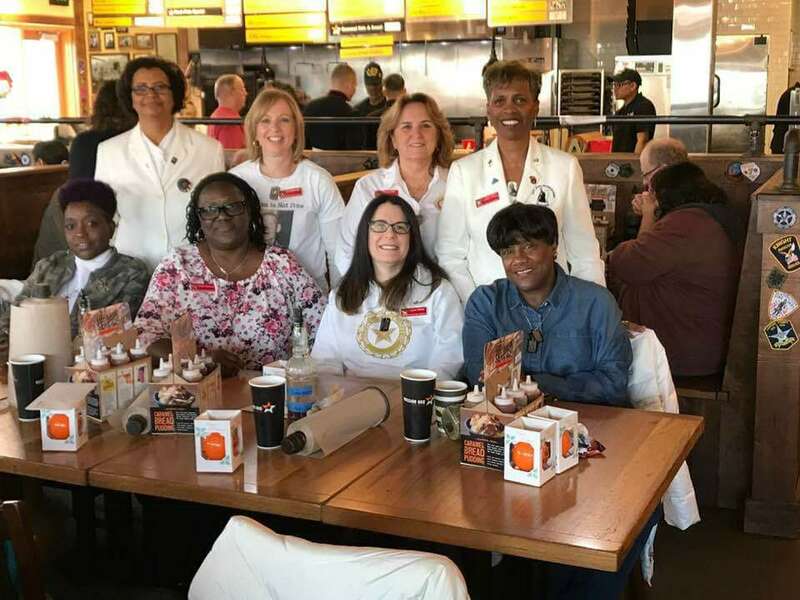 Janice Chance represented the Gold Star Mothers Maryland Chapter, Inc. After the one-day work group sessions, each group presented information related to their team’s top five priorities, explained their rationale and answered questions. After the group presentations every participant was given the opportunity to vote on issues in every category by electronic survey. The group members were informed that the product of the summit will result in a Veterans agenda that will represent the voice of the veteran community to the Maryland General Assembly, providing a menu and road map for legislation. Per the welcome literature that the team members received, the Veterans Agenda will be a bipartisan, bicameral legislative agenda, and will form the core of the Veterans Caucus mission for years to come. The Veterans Agenda will light the path to make Maryland the most Veteran Friendly state in the union. Members of the team were given a tour of the senate office building after the summit. 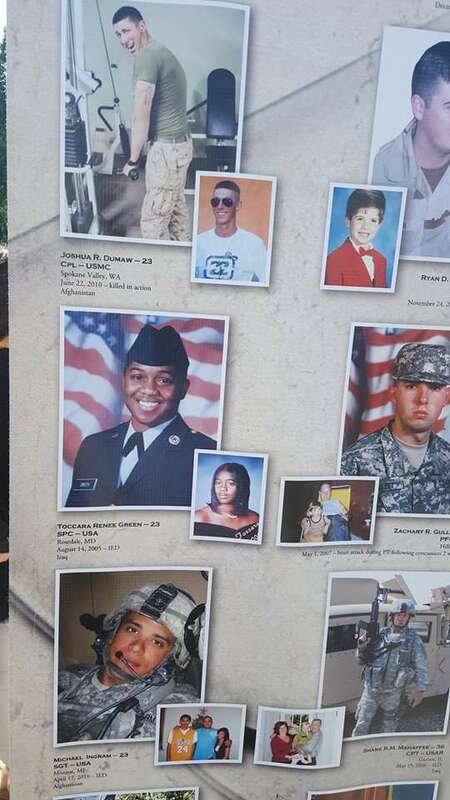 It was a Great to serve on behalf of our heroes and their families. Maryland Gold Star President/Chaplain Janice Chance, Treasurer Theresa Mills, GS Moms, Donna Robinson, Paula Davis, Gold Star Wife Raina Taylor, President of the D.C. Chapter Gold Star Wives, GS Wife Alma Grant, along with GS Sister Jenine Melton attended the NewDay USA Veteran Appreciation Event on Friday, November 3rd. This was a special invitation that took place at the NewDay USA Corporate Headquarters located in Fulton, Maryland. NewDay USA CEO, Rob Posner delivered remarks along with Admiral Lynch and Master of Ceremonies, Sgt. Major Army Tilley. Also in attendance was Jan Scuggs who founded the Vietnam Veterans Memorial Fund which built the Vietnam Veterans Memorial in Washington, DC. 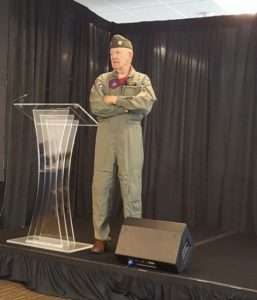 CMSAF Finch introduced our Keynote speaker; Capt. J. Charles Plumb. Capt. Plumb’s autobiography, I’M NO HERO is a detailed riveting story of Capt. Plumb’s imprisonment as an American POW in Vietnam. It is a revealing story of hope, validating the strength of the human spirit. A book of remembrance was unveiled by Ken Bright and moment of silence. The names of Maryland’s Fallen Military members will be located on a podium with an engraved sign. NewDay USA keeps a Fallen Heroes/POW table set in a prominent place in their office. On all Hallows Eve, October 31, 2017, Maryland Chapter Gold Star Moms Janice Chance, Donna Robinson and Yvonne Green gave a wonderful treat to Gold Star Mom Edith and her husband Robert Canapp, who reside at the Forest Hills Assisted Living Center in Harford County, Maryland. Edith respectfully, “91” and her husband respectfully, “92” have been married for 75 years and are the proud parents of nine beautiful children. 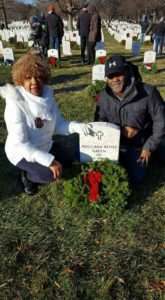 Their son Corporal Gary Canapp U. S Army was killed in action while serving during the Vietnam War on May 5, 1968. The Canapp’s were surprised by the visit but there was more to come than just a friendly visit. 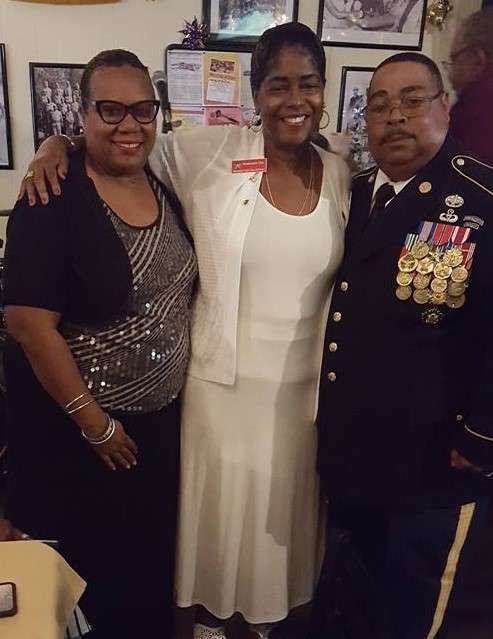 Janice and Donna had attended a Vietnam Veterans Appreciation luncheon at American Legion Post #60 in Laurel, Maryland the previous Saturday where Corporal Canapp was honored with a certificate and special challenge coins, which were given to his parents by Janice and Donna. 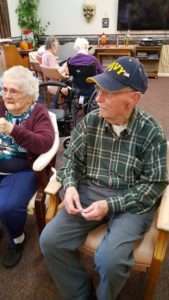 Edith and Robert were very appreciative of the honor on behalf of their son and the center stopped their Halloween party as they turned the t.v. off to listen to the presentation being made. At the end of the visit, the Canapp’s gave the motehrs a tour of their humble abode where they enjoyed some selfie time. 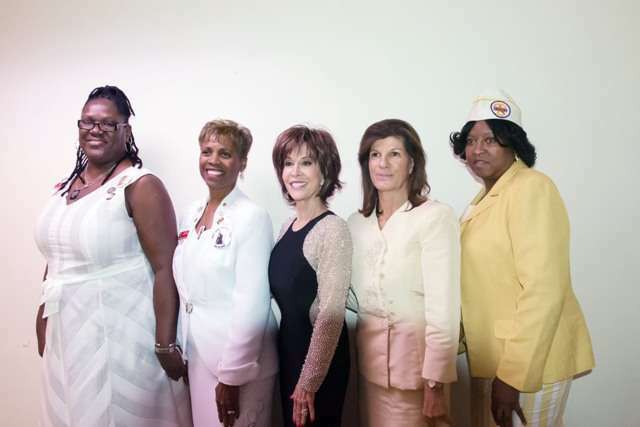 Maryland Chapter Gold Star Mothers Janice Chance, Theresa Mills, Donna Robinson, Stephanie White, and Vietnam Gold Star Mothers Edith Canapp and Delores Snyder were invited to participate in honoring local Vietnam Veterans at the American Legion Post 60 on October 28, 2017, which was sponsored by the Daughters of the American Revolution and the American Legion Women’s Auxiliary. Special recognition was given to our Vietnam moms and their sons, CP4 Roger Claiborne Snyder US Army, KIA 7 Feb 1967 and Corporal Gary Edward Canapp U.S Army KIA 8 June 1968. Unfortunately, Edith could not attend due to illness. 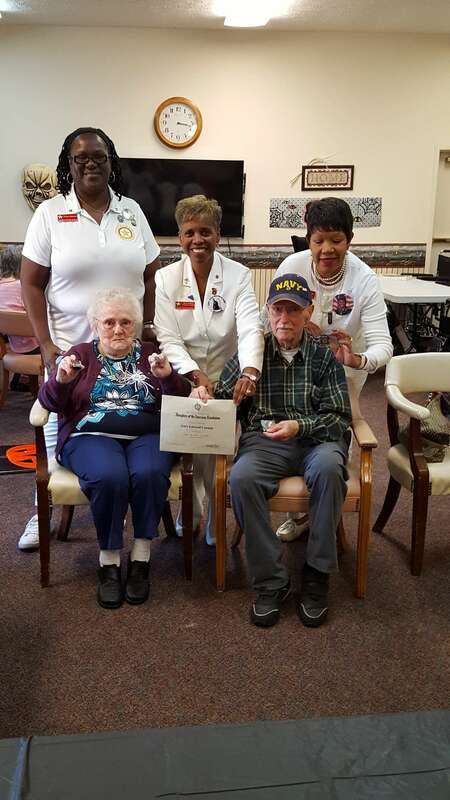 They also received a special certificate in honor of their loved one and two special pins. Ms. Anselma Obremski who is the National Chair for Education of the American Legion Auxiliary, welcomed over 30 attendees, including those who served in the Vietnam War. Guest speaker Laurel Mayor Craig Moe commended the Legion for their continued service and dedication to the military and local communities. The Moms were also proud and honored to hand out our commemorative Vietnam Veteran’s gold coin to those Veterans who were recognized at the ceremony. 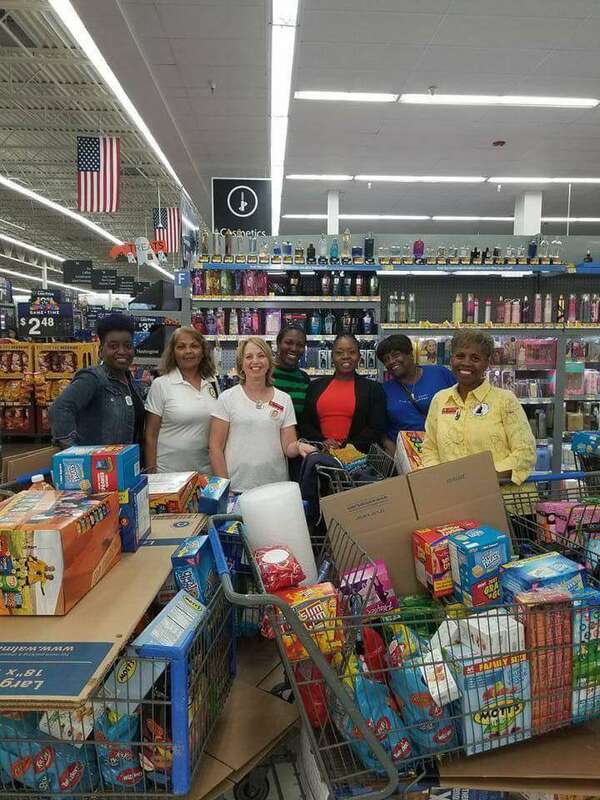 Maryland Gold Star Mothers Gina Barnhurst, Paula Davis, Sheba Khan, Janice Chance, Michelle Murphy and Gold Star cousins Peatoria Perdue and Lieutenant Tameka Collins met at Walmart in Laurel, Maryland to purchase goodies to be mailed to six deployed units. 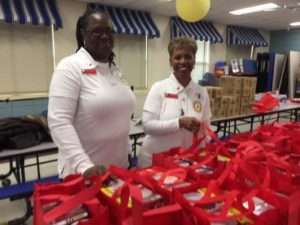 After collecting over four full carts, the Moms, Peatoria and Tameka Collins went to the American Legion Post 60 to package all the goodies to be mailed. 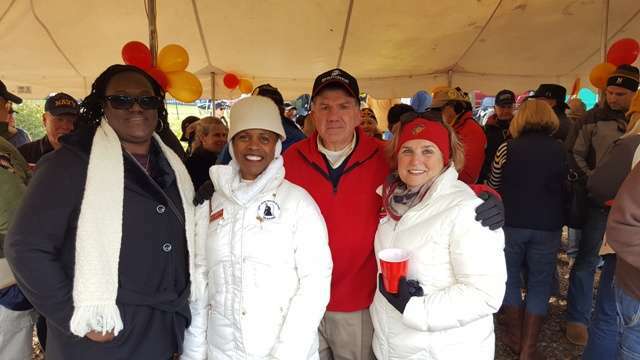 Maryland Chapter Gold Star Mom and Dad – Garry and Yvonne Green attended the USMC Gold Star and Navy Gold Star Event on Saturday October 21st. 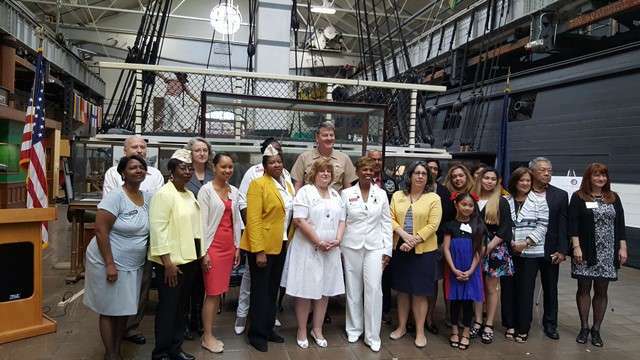 This was a special invitation that took place at the National Museum of the Marine Corps located in Triangle, Virginia and was hosted by Rachel Doran who is the NDW Installation Navy Gold Star Coordinator. 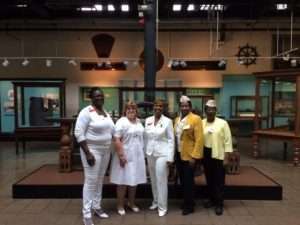 Coordinator Tammy McFadden and the Greens, who are pictured, enjoyed a private tour of the museum with its rich history pertaining to military life. The museum also has exhibits of equipment that soldiers use to train with. 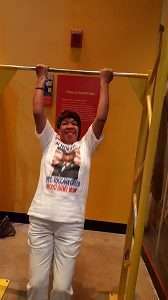 During the tour, Yvonne gave a try at “chin-ups” which is located at the physical conditioning exhibit. 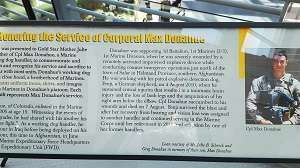 The museum also had some very special exhibits that includes Honoring our Fallen Heroes – One notable exhibit highlights the service and sacrifice of Corporal Max Donahue and his dog Fenji. The Museum is a must see for the whole family. Maryland Governor Larry Hogan invited members of the Gold Star Mothers Maryland Chapter to attend the National Medal of Honor Flag Raising Ceremony that was held on the beautiful lawn of the State House. 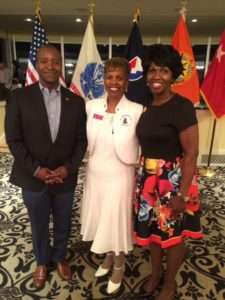 The ceremony was held prior to the National Medal of Honor Convention which will be held in Annapolis next September 2018. 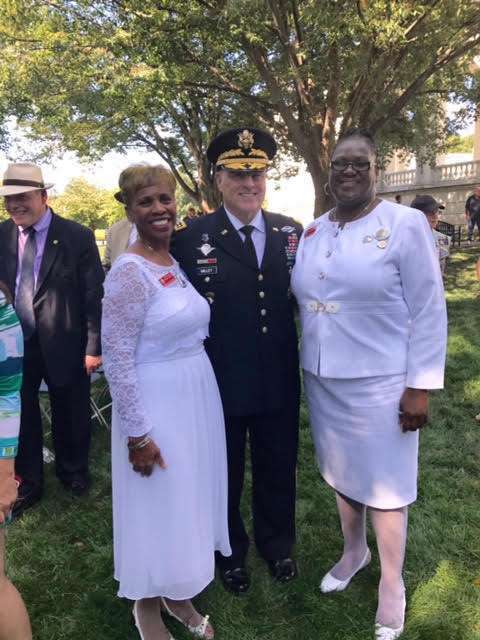 Donna Robinson and Janice Chance represented the Maryland Chapter and Mr. Robert “Bob” Monahan, Co-Chair of the 2018 Medal of Honor convention, served as the Master of Ceremony. Prior to his message, he spoke about the tragedy that occurred in Las Vegas and called for a moment of silence. Mr. Monahan recognized and honored the two Medal of Honor recipients that were in attendance – 1st LT Brian Thacker, U.S. Army and Col Harvey “Barney” Barnum Jr, (Ret). He also shared exciting information about the upcoming Medal of Honor convention. There were several elected officials and other distinguished guests in attendance. 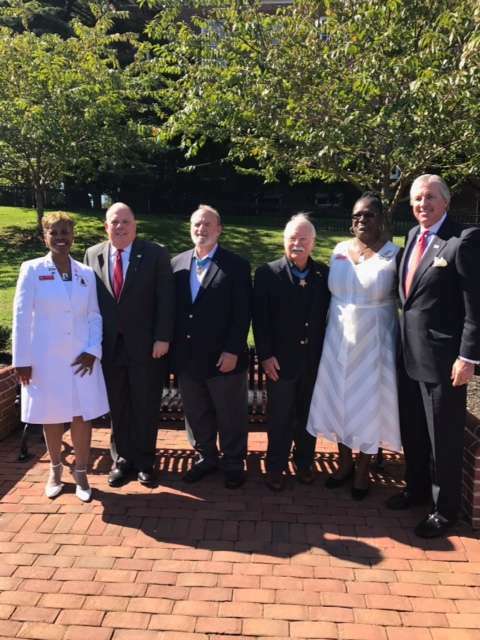 Governor Hogan was the keynote speaker and he gave a heartwarming message; Honoring and Saluting the Medal of Honor Recipients. The Medal of Honor was created during the American Civil War and is the highest military decoration presented by the United States government to a member of its armed forces. The recipient must have distinguished themselves at the risk of their own life above and beyond the call of duty in action against an enemy of the United States. Governor Hogan spoke about the upcoming convention and is very excited that the convention will be held in our Maryland State Capitol. He also thanked all of the groups and individuals that participated in and who were in attendance, in addition to thanking all of our Nation’s active duty service members, Veterans and Gold Star families. Other guest speakers included Senator Brock and Col Barnum. Senator Brock honored and saluted the Medal of Honor Recipients during his message and pledged his continued support. Col Barnum gave a truly inspirational and motivational message. Music during the ceremony was provided by the Naval Academy’s Ceremonial Band. The color guard team was from the Maryland National Guard, and the pledge of allegiance was led by the Annapolis High School’s Navy JROTC Cadets. It was a memorable ceremony. We are thrilled to receive an invitation from Mr. Monahan to participate in the convention next year and as always, we look forward to supporting our Heroes. The American Gold Star Mothers held their 81st Commemorative Ceremony and program on September 24, 2017 at Arlington National Cemetery in Arlington, Virginia. Gold Star Mothers Sunday was recognized with a wreath laying at the Tomb of the Unknown Soldier and a Commemoration Service reception. 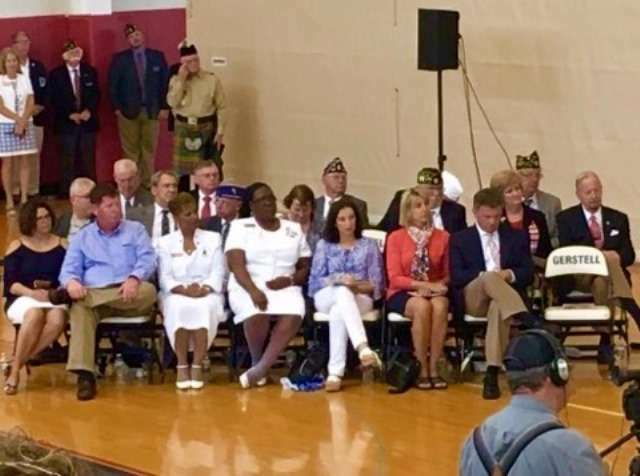 The service was well attended by Gold Star Mothers, fathers, wives, other Gold Star Family members, representatives from several Veteran Services organizations and Veterans. Also in attendance were Mrs. Mark Miller, MG Patrick Murphy, LTG Gwen & Dr. Bingham, Mrs. Daniel O’ Donohue, and other distinguished military service members. 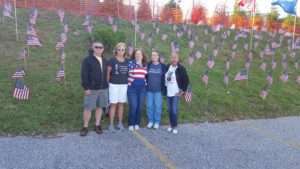 The wife of Fallen Hero MG Harold Greene U. S. Army who was killed on 8/4/2014 by an Afghan police officer also joined us. 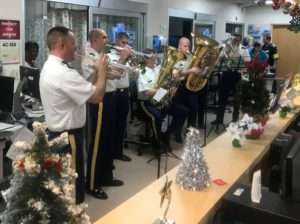 Music for the service was provided by the U.S. Army Brass Quintet. The keynote speaker was LTG Daniel O’ Donahue USMC, but we were also blessed to have General Mark A. Milley, 39th Chief of Staff of the Army, speak during the service. 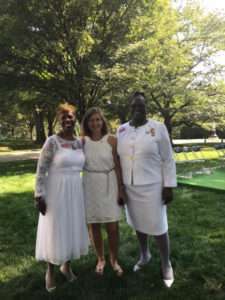 Following the service, a reception was held at the Women in Military Service for America Memorial (WIMSA). After the reception there was a special performance by the 3rd U.S. Infantry Regiment “The Old Guard” Fife & Drum and Drill Team. It was an outstanding performance. 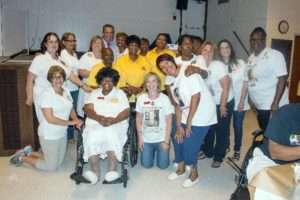 It truly was a great way to end our Special Weekend of Gold Star Mothers Commemoration events. 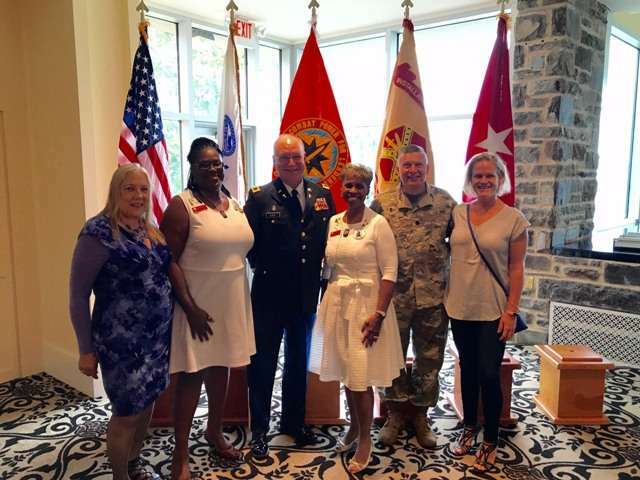 Pictured l/r: Michael King, Gold Star Dad Garry Green, Gold Star Mom Donna Robinson, Gold Star Mom Sheba Khan, Gen. Randy Taylor (Base Commander), Gold Star Mom and President Janice Chance, Gold Star Mom Yvonne J. 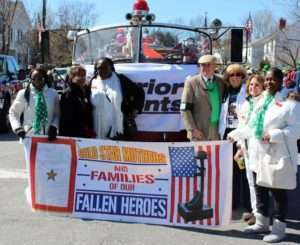 Green, Mr. Lucas, Ms. Lynn Phillips (wife of Colonel Robert Phillips), Colonel Robert Phillips, and Gold Star Dad Charlton Chance. Not pictured Mr. Mike Farlow. 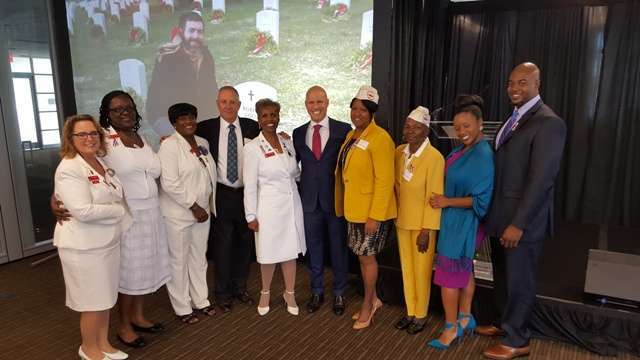 On Gold Star Mothers and Families Day, the Maryland Chapter was recognized at the annual breakfast held by the Survivor Outreach Services Coordinator Mike Farlow along with LTC Michael King (Garrison Chaplain). After the Welcome and prayer, Mr. Farlow introduced the Gold Star Families present to which he also added his own special remarks for each family. Captain Michael Kayle, Garrison Resource Manager, then read the Presidential Proclamation for Gold Star Mother’s Day. 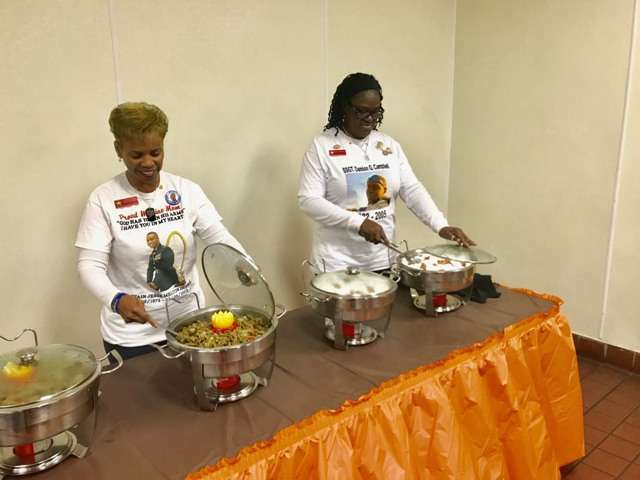 The Chapel volunteers began to serve the families a breakfast which consisted of sausage, eggs, fried potatoes, shrimp and grits, fruit cups etc…. The breakfast concluded with remarks from Colonel Robert Phillips, Mr. Farlow, Janice Chance (Maryland Chapter President/ Chaplain who shared about the Gold Star Mother’s mission of serving our Veterans, active duty and their families. Special music was provided by Ms. Renesha Robinson (Lead Logistics Management Specialist). Closing comments and benediction were given by Chaplain Michael King. 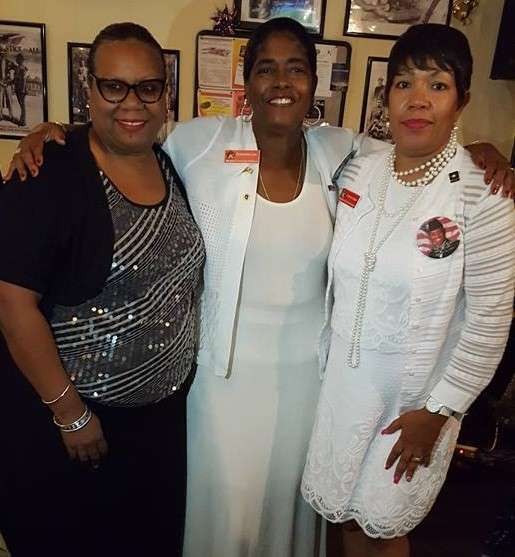 Gold Star Mother’s Sunday, September 24, 2017, was a day of Love, Food, Fun and Celebration for Maryland Gold Star Chapter and Parliamentarian Rosemarie Ceo. 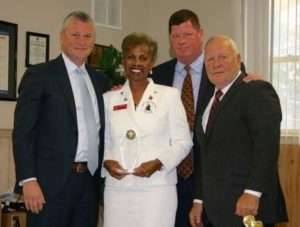 Ms. Ceo who has been a member at the American Legion Post #19 since 2010 was celebrated in grand style. 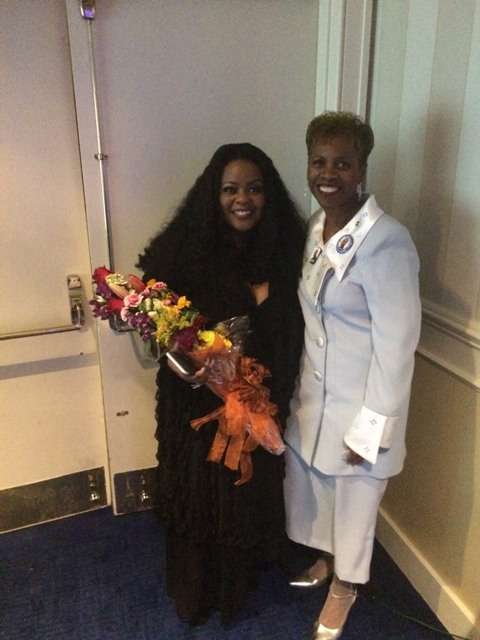 Legion President, Yvonne B. Oliver officiated as Rosemarie was presented with gifts and flowers. Ms. Ceo was also honored by Post member Willie Christian Jr., who had served with her son. 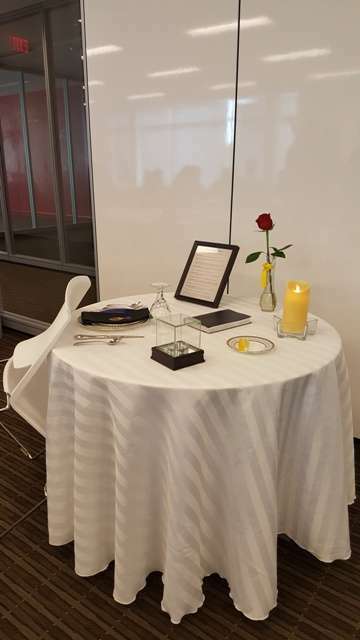 Guests of the honoree enjoyed a lovely dinner prepared by the Post while enjoying the soulful sounds of a local jazz band which serenaded Ms. Ceo. 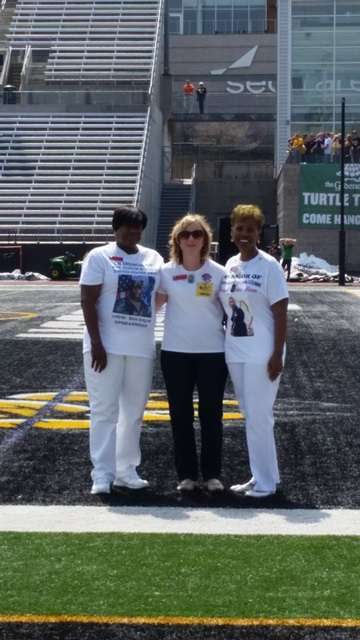 Also in attendance were Maryland Gold Star Mom Yvonne J. Green and Gold Star Dad Garry Green, who was not pictured due to photography duties. 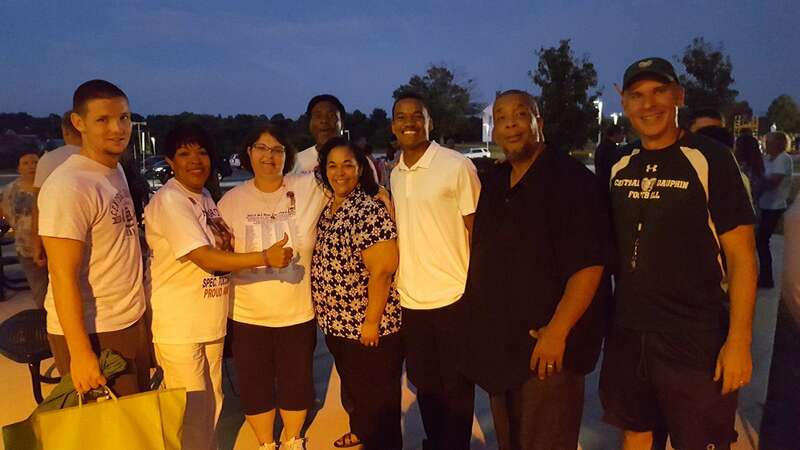 The event was enjoyed by Rosemarie’s children, in-laws, cousins and a host of friends as well as Post members. 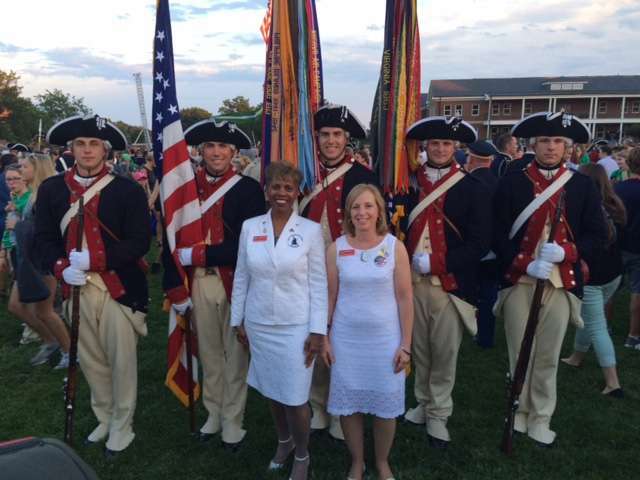 Rosemarie Ceo also serves with the Color Guard. 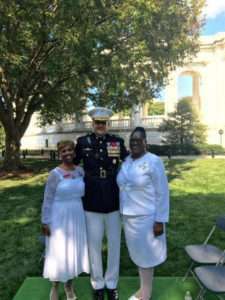 On September 23, 2017, Maryland Chapter Gold Star Moms Janice Chance, Donna Robinson and Yvonne J. 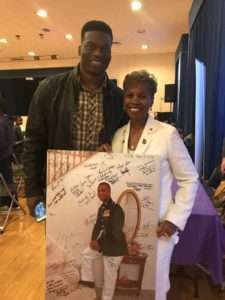 Green along with D.C. Gold Star wife, Raina Taylor, attended the 13th Annual Fisher House Gala at Water’s Edge Events Center in Belcamp, Maryland. The fundraiser raises funds to build homes near major military and VA medical centers nationwide. For the past 27 years, the Fisher House has provided housing for military and veteran’s families to stay at no cost while a loved one is receiving critical care. The Gala had a “specialty theme” this year instead of their Black tie attire. 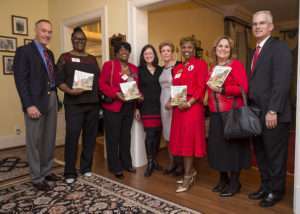 Guests were asked to don themselves in their best southern chic, boots and bling, spurs and pearls and denim and lace. Guests also pleasantly feasted on a seafood bar which consisted of East Coast and Chesapeake Bay oysters, jumbo shrimp cocktail and blue crab claws as well as many local delicacies, including Maryland crab soup and Chef Manny’s Mac n Cheese. Dessert consisted of apple crisp with ice cream. The Moms are pictured with Ms. Gillian Gonzalez (Peer to Peer Fundraising) who accepted a check which was presented to Fisher House. 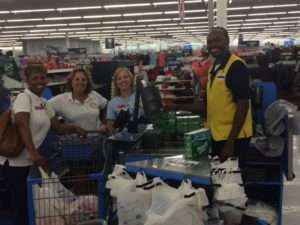 The money raised will be used towards building a house in Perry Point, Maryland. 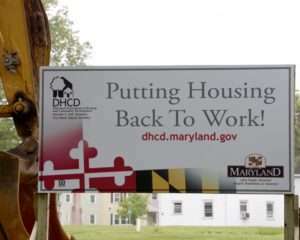 To date, over 305,000 families have been served since 1990 and an estimated $360 million in out of pocket costs for lodging and transportation have been avoided for the military and veteran’s families. 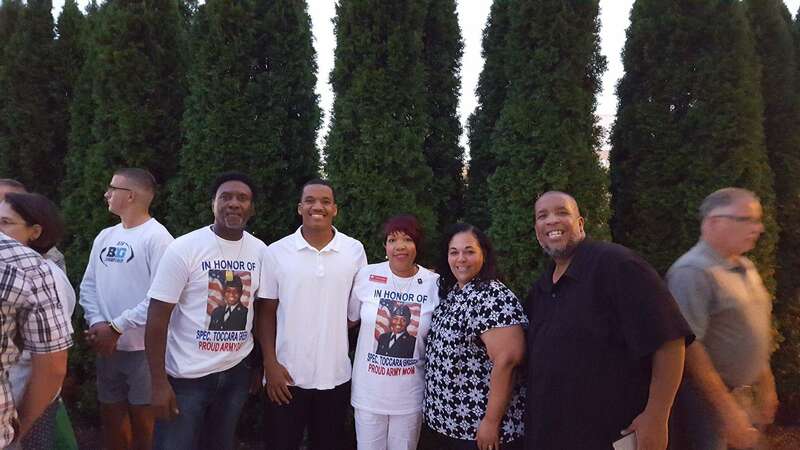 Gold Star Mother’s Day weekend got off to a BANG with Maryland Gold Star Mom and Dad – Yvonne and Garry Green. They attended the 3rd Annual Central Dauphin High School Gold Star Mother Football Game in Harrisburg, Pennsylvania. 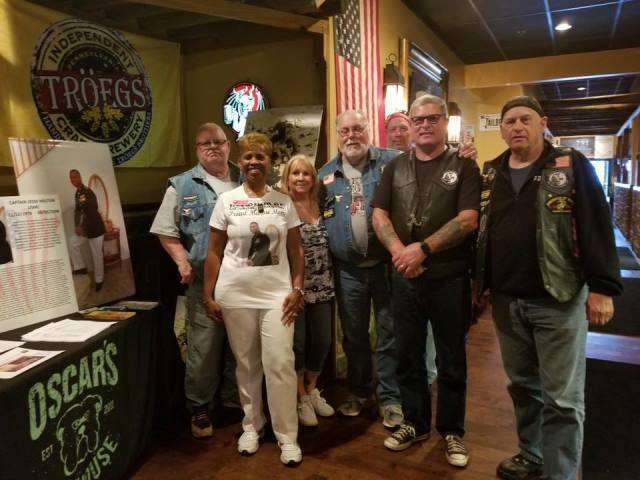 This event is hosted by Gold Star Mom and Dad, Suzanne and Paul Sheaffer and was kicked off with a Meet and Greet dinner on Thursday. 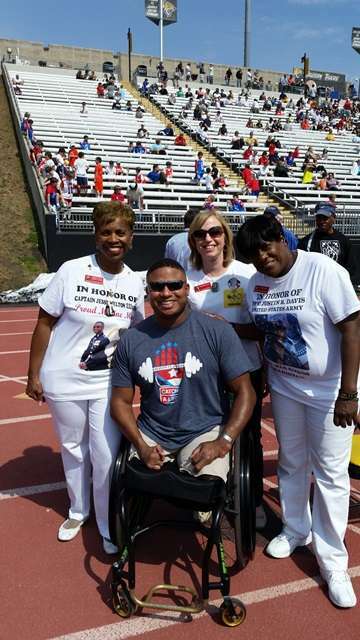 Families of Fallen Heroes get to meet the players who will play in honor of their loved ones. After the dinner, the players and their family, along with the Heroes family, exchange pleasantries and gifts while getting to know each other. 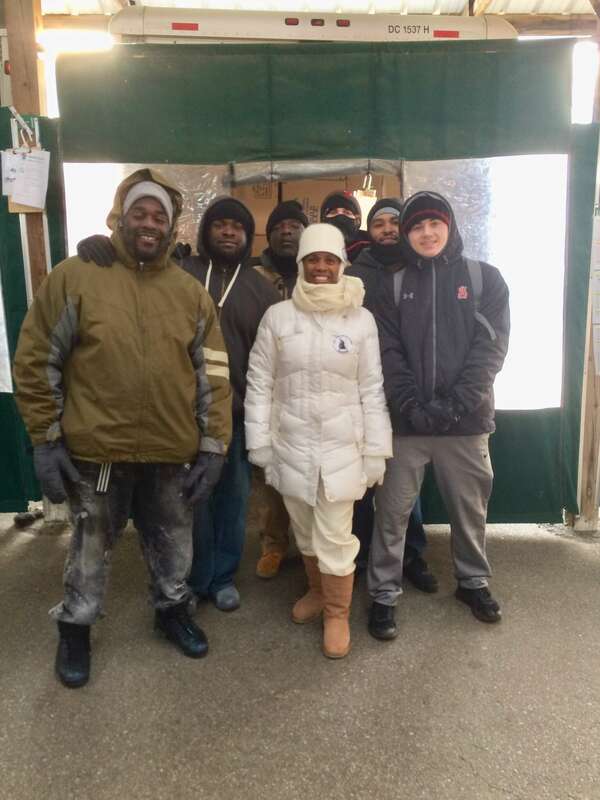 On Friday, the football game was played but the Greens were unable to attend due to another engagement in Reading, PA; however, the Rams beat their opponent 68-14. Goooo Rams! The Greens were pleasantly surprised that their player’s name is also Green (Michael) who is linebacker #45. 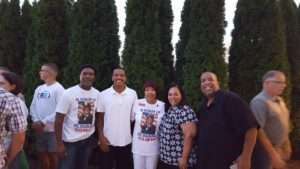 Yvonne and Garry Green would like to salute the parents, Michael and Andrea Green, for raising such a fine young man. 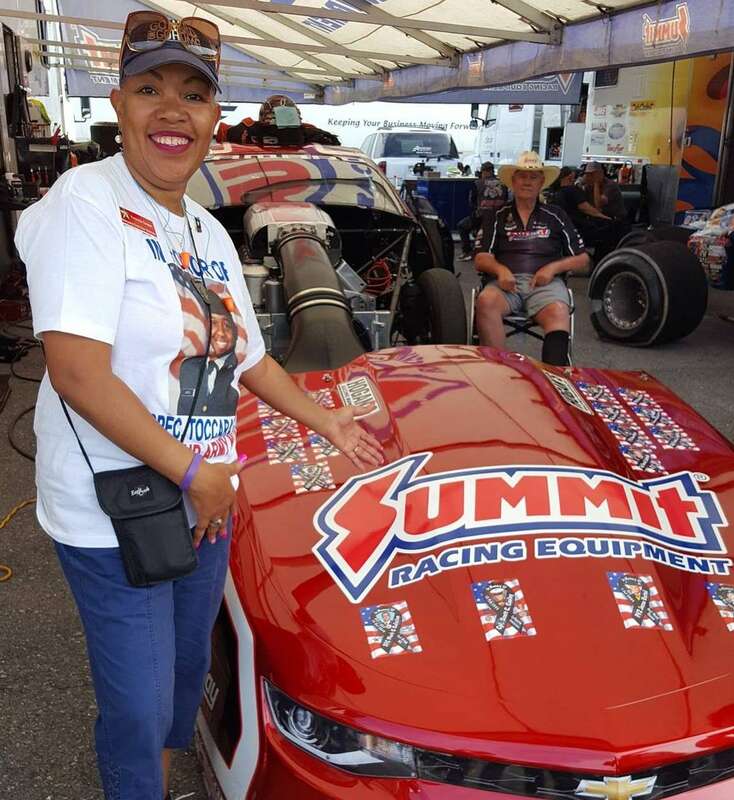 On Friday, September 22nd, Gold Star Mother’s Day weekend, the Maryland Chapter mothers were invited to the Maple Grove Raceway in Reading, Pennsylvania for the NHRA Semi-final Eliminations. Hot Rods for Heroes founder Ron Greenwood, sponsored the local chapter for a day of exhilarating fun and suspense. 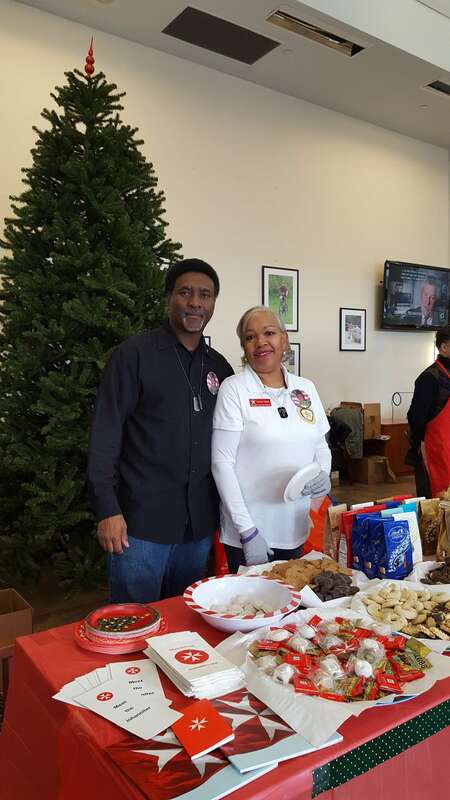 Gold Star Dads and Gold Star siblings also enjoyed the festivities along with Gold Star Wife, D.C. Chapter President, Raina Taylor. 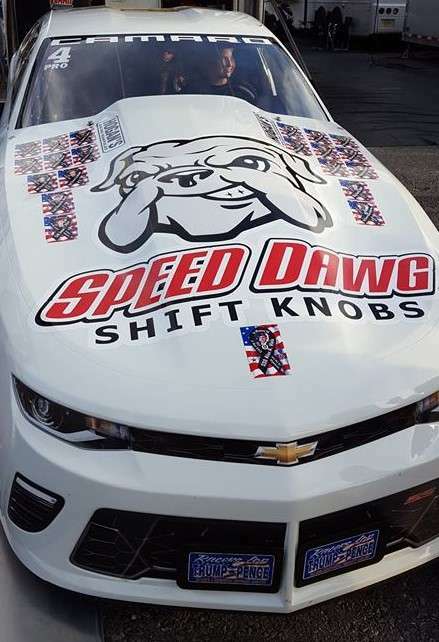 The families were privy to hang out and meet and greet the drivers including Jason Line, Greg Anderson and Bo Butner with decals representing their fallen heroes. 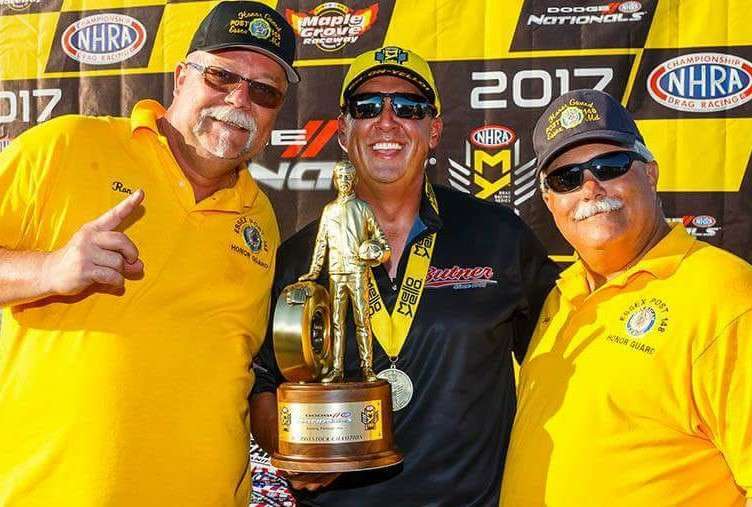 Sunday’s winner was Bo Butner! 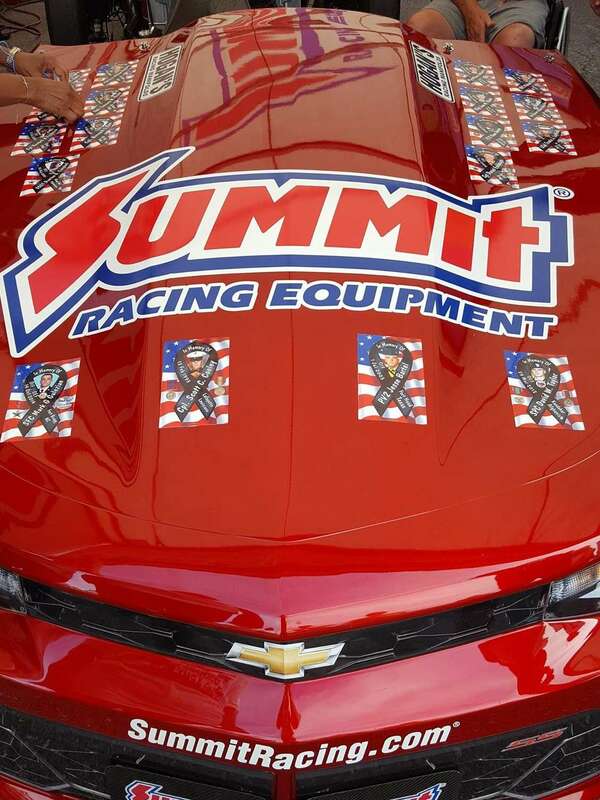 It was truly a day of remembrance for all who participated and they look forward to next year’s races. 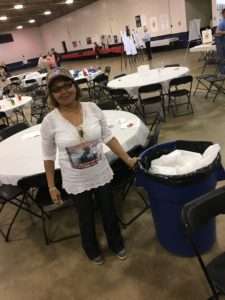 Over 250 people attended our annual crab feast and bull roast at American Legion Post 60 in Laurel, Maryland. 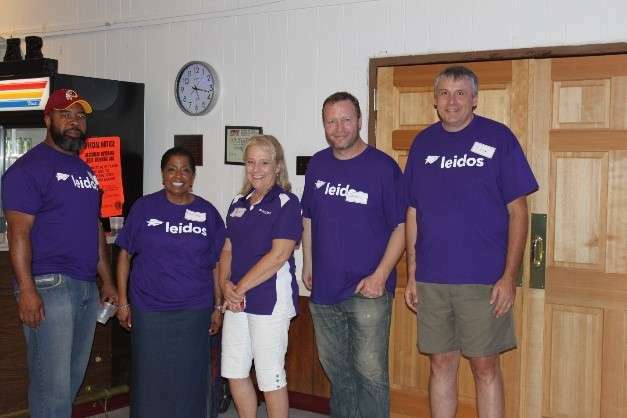 We also had a great group of people from Leidos who volunteered their time to help serve food as well as coordinate silent auction and the 50/50 raffle. There were many service organizations as well as family and friends who helped raise over $9,000 which will be used to help support our active duty Veterans and their families. 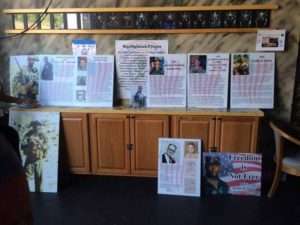 The highlight of the afternoon was the slide show presentation, which was compiled by Ronald Coleman that displayed pictures of our fallen children and the events that we have supported in the past year. We also enjoyed music provided by DJ Char Lee and a special thank you to Commander Lee Luby and her team at the American Legion Post 60 who provided the hall, the projector and bartenders for this event. 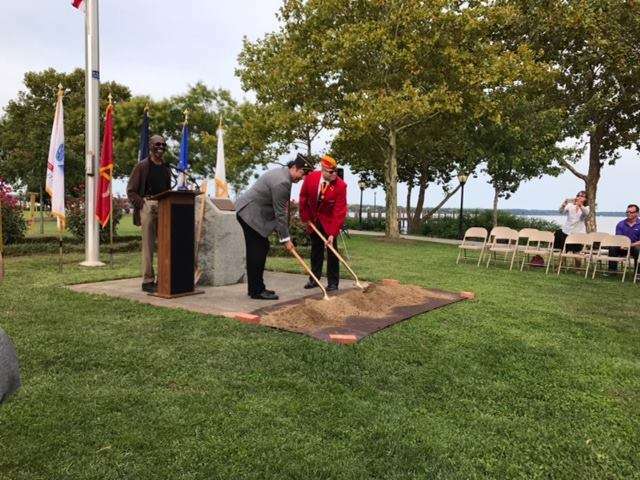 A Gold Star Families Memorial Monument Ground Breaking Ceremony was organized by the Havre de Grace Project Committee and held on September 11, 2017 at the Concord Point Park in Havre de Grace, Maryland. Mr. Craig Reeling and Mr. Johnny Boker served as the Gold Star Families Memorial Monument project leads. 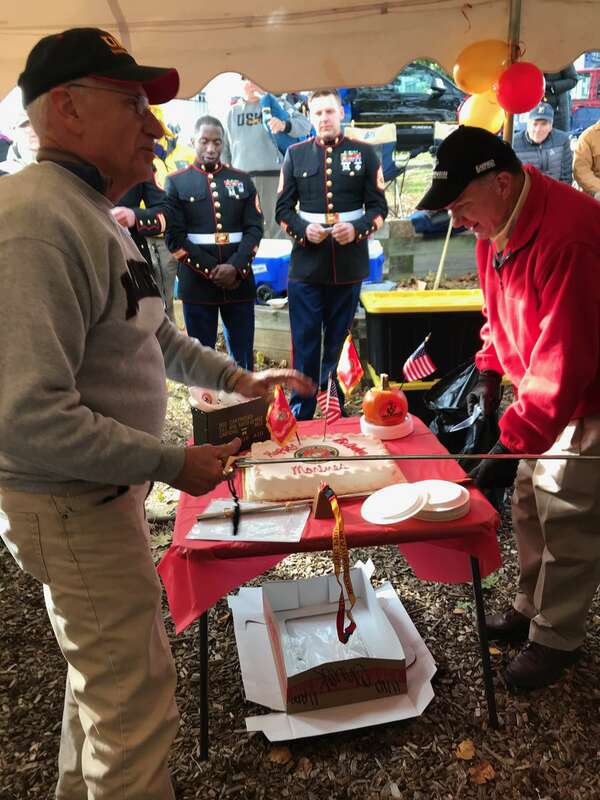 Mr. Johnny Boker is the Hartford County Commission Chairman (Veteran) and Craig Reeling serves as the Commandant of the Marine Corp League Detachment 1198. It was a very heart-warming ceremony. In attendance were several distinguished guest that spoke during the ceremony. 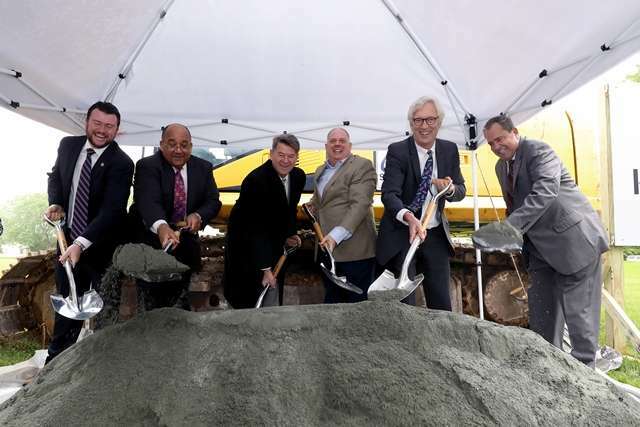 Mr. William T. Martin, the Mayor of Havre de Grace; Mr. Barry Glassman, Harford County Executive; Mr. Curtis Beulah, Harford County Councilman – District F; Mr. David Craig, Former Mayor, County Executive, Senator, Delegate and now Executive Director of the Maryland World War I Centennial Commission; Mr. Dan Haddix Representative from the Hershel Williams Medal of Honor Foundation and several other distinguished guests spoke during the ceremony. 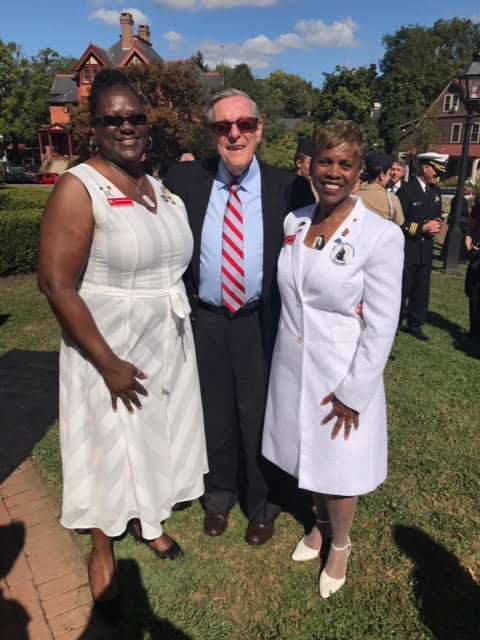 Janice Chance spoke on behalf of the Gold Star Mothers Maryland Chapter, Inc. Also in attendance were Gold Star moms Donna Robinson, Martina Berger, Gloria Carothers, Gold Star Sibling Mary Gerity, several other Gold Star family members, Veterans, and community supporters. 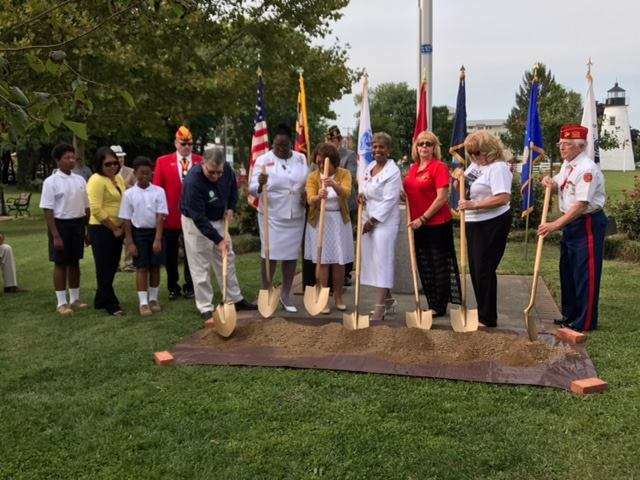 The Havre de Grace Gold Star Families Memorial Monument will be the third Maryland memorial dedicated to the families of Maryland’s Fallen Heroes. Mr. Johnny Boker shared the following at the beginning of the ceremony. 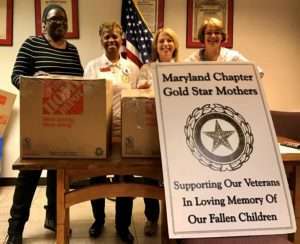 On Friday, September 8, 2017, Maryland Chapter Gold Star Moms Michelle Murphy and Yvonne J. Green attended the annual “91” event called The Path of Honor hosted by Chuck Ritz, Founder of the Hope and Peace Foundation in Northeast Baltimore County (Putty Hill at Joppa Road. 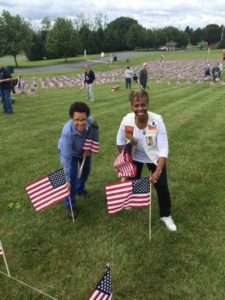 The event consisted of laying a flag for everyone killed during the 911 attacks (2,977). Also 141 flags were laid on a hill in honor of the Maryland military service members who made the ultimate sacrifice. 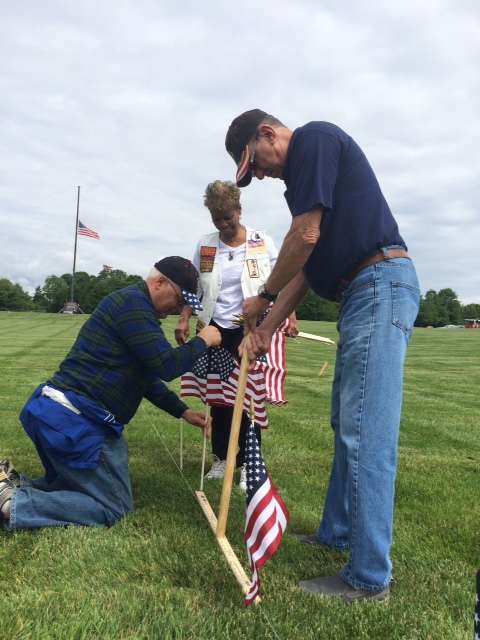 It is truly an Honor to see but even more rewarding to participate in the flag laying process. 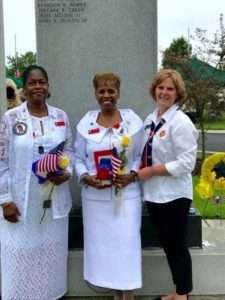 On Thursday September 7th, 2017 (911 Weekend), Maryland Gold Star Mothers Janice Chance, President/Chaplain; Michelle Murphy, 1st Vice President; Yvonne J. 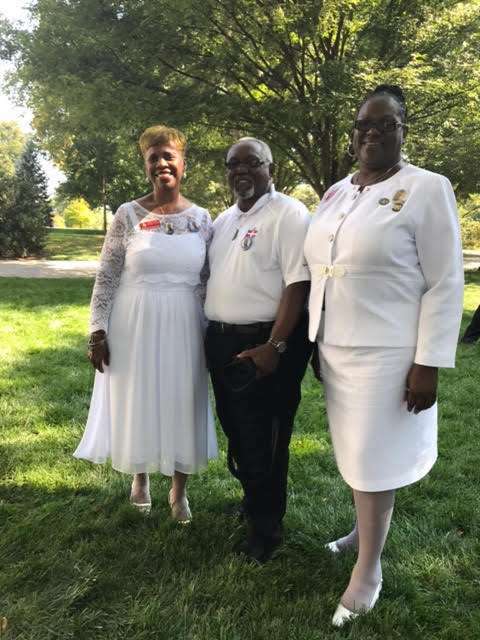 Green, Sgt at Arms; Rosemarie Ceo, Parliamentarian and Joy Goode attended the National Unveiling, Lincoln Memorial ceremony titled: Remembering Our Fallen. 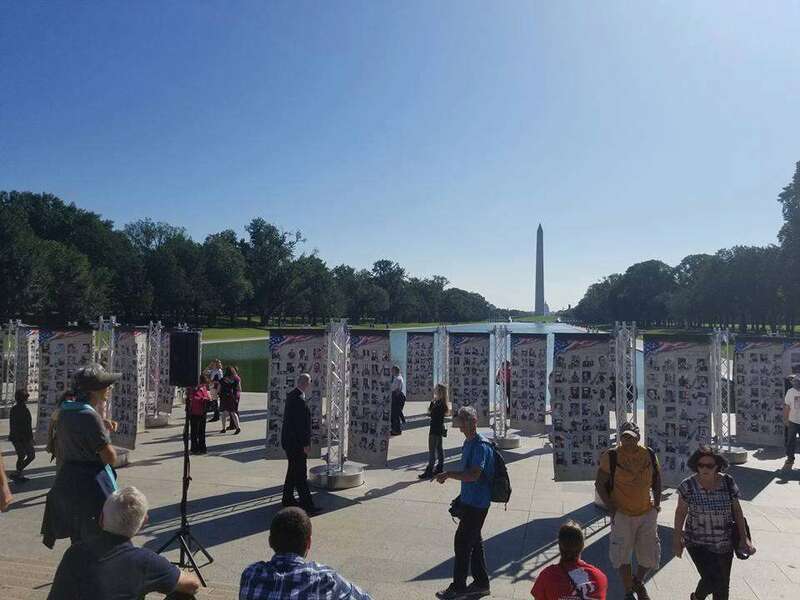 The event started with a 45 minute ceremony, a roll call of all families in attendance and ended with the actual viewing of all HEROES whose photos were sent in for the exhibit by their loved ones. 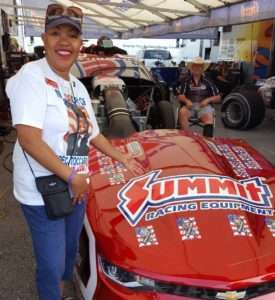 The exhibit is the “brainchild” of Evonne and Bill Williams, which will be a rolling exhibit traveling throughout the United States and communities. 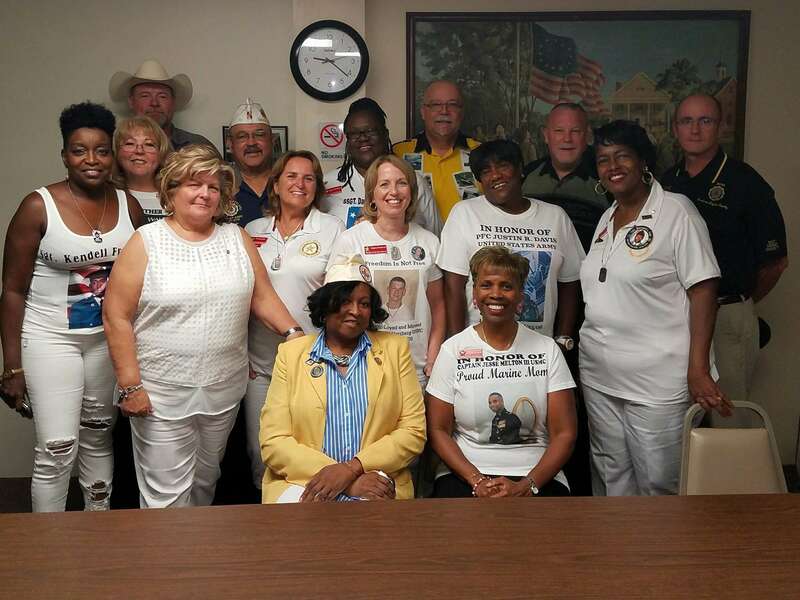 Also in attendance were Gold Star Dads: Garry M.Green (MD) and George Winslow (Hoover, AL). The Naval Academy hosted Tulane at the Navy Marine Corps Stadium in Annapolis, Maryland on Saturday, September 9th. This was the Academy’s first home game. 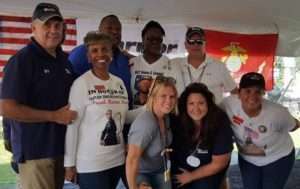 Prior to the football game, Warrior Events provided food and beverages at their annual tailgate fundraiser for the troops. 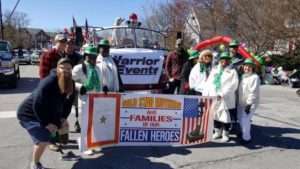 With the help and support of the community, Warrior Events hosts monthly events to support wounded warriors and their families. 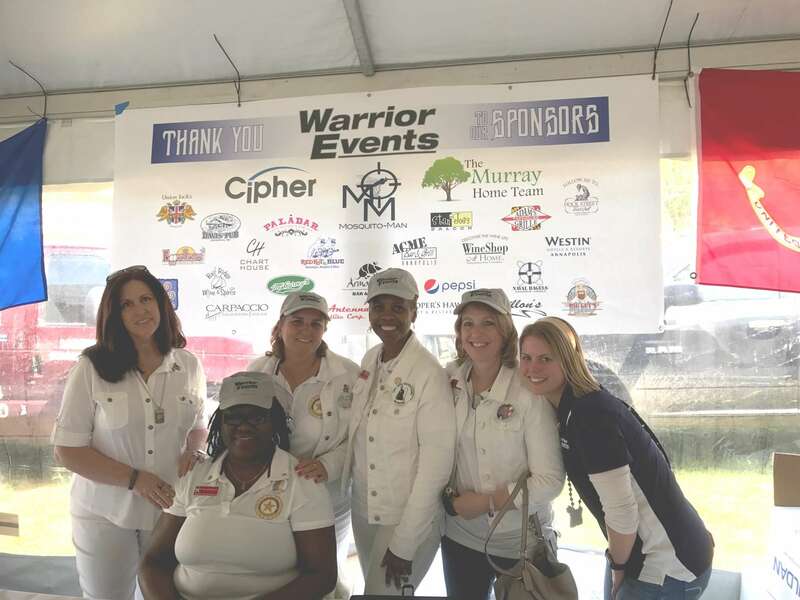 Their mission is to provide opportunities for interaction, enjoyment, and camaraderie for our warriors and to raise awareness and appreciation among the public. John O’Leary, Bob Saunders and Leonora Garvey invited the Maryland Gold Star Mothers to this event as they have in the past. 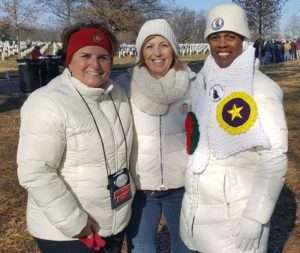 Janice Chance, Donna Robinson and Theresa Mills arrived during the traditional parade of midshipmen who walk from the Academy and march onto the field prior to kick off. We are happy to report that Navy won 23-21! The American Legion Post 60 invited the Maryland Gold Star Mothers to their annual luncheon that hosted over 100 Veterans and staff of the Maryland Center for Veterans Education and Training (MCVET) facility. MCVET helps veterans with homelessness and substance abuse get back on their feet to a more productive and fulfilling life style. 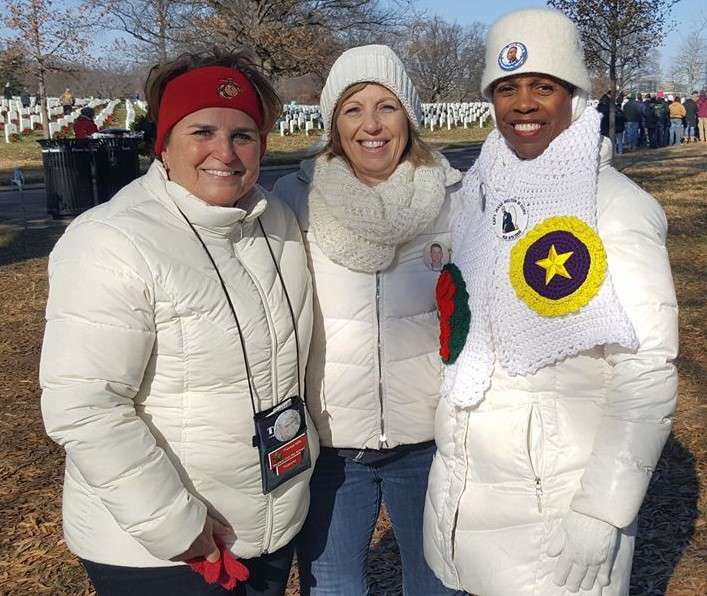 Lauren Seidler, Janice Chance, Donna Robinson and Theresa Mills had a fun time serving our Veterans and greeting them in the flag line as they arrived. One service member told us with tears of joy that “This is one of the happiest days that I have had in a long time!” Veterans were also encouraged to participate in Bingo and an outdoor softball game. Prizes for the Bingo game were donated by the American Legion and trays of food from Mission BBQ were supplied by the Gold Star Mothers Maryland Chapter. This will be the fourth year that we have participated in this event and we look forward to serving next year. 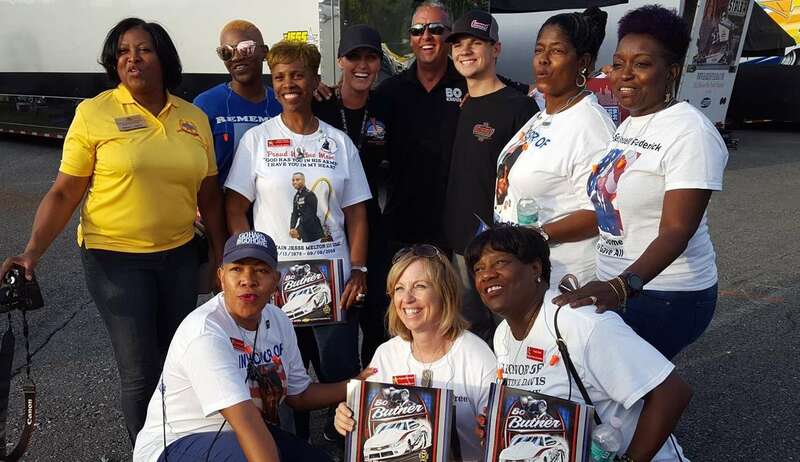 Hot Rods for Heroes was “Honored” to host the Maryland Gold Star Mothers, Gold Star Wives and Family members on Saturday August 26th at their home, American Legion Post 148 Essex Md. It was a very memorable evening for all in attendance . 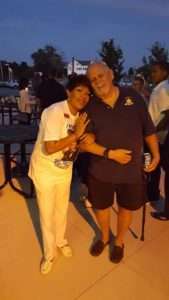 Thank you to Ron Greenwood for hosting and honoring our fallen heroes. 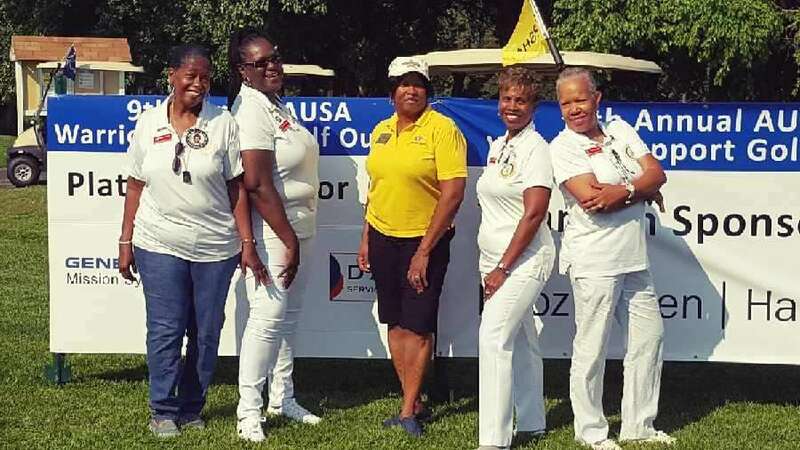 On Thursday August 17th, the Gold Star Mothers Maryland Chapter were invited, for the second time, to the Association of the United States Army’s (AUSA) annual golf tournament held at Ruggles Golf Tournament located at Aberdeen Proving Grounds. 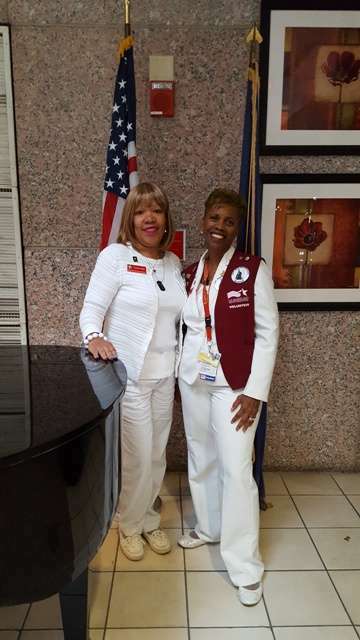 The event started at 6:30 a.m. when Maryland Gold Star President/Chaplain Janice Chance, Sergeant at Arms Yvonne J. 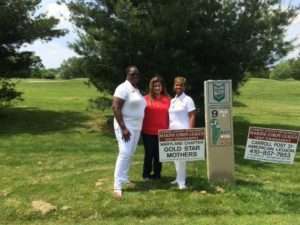 Green, Parliamentarian Rosemarie Ceo and GS Mom Donna Robinson, along with Gold Star Wife Raina Taylor, President of the D.C. Chapter Gold Star Wives, arrived for duty. The Moms and Mrs. Taylor were at attention to receive the golfers at 7:00 a.m. registration so they could tee off at 8:00 a.m. It was yet another successful tournament for AUSA. On August 14, 2017, the Aberdeen Proving Ground Army Base Chaplain Corps (Aberdeen, MD) held their annual National Prayer Luncheon at the Top of the Bay Restaurant. COL William Sean Lee, Joint Force Headquarters Chaplain, Maryland National Guard was the guest Speaker. 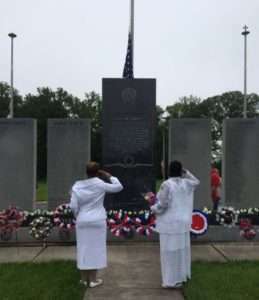 Music was provided by the Rhema Praise Group and several Chaplain’s prayed during the program for the following: Prayer for Our Nation, Armed Forces, Command and the Community. The new Garrison Commander MG Randy Taylor CECOM and Installation gave the opening remarks. 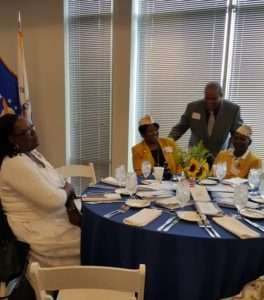 The luncheon was well attended by the APG family and citizens from the community. 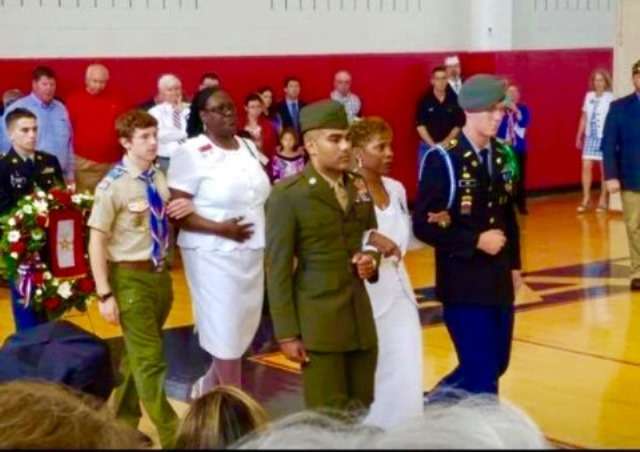 Gold Star family members were invited as their special guests. 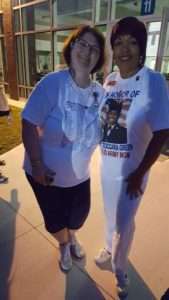 Donna Robinson and Janice Chance represented the Maryland Chapter and several Gold Star wives were also in attendance. The food was delicious, the fellowship was wonderful, the music was great, and the message was inspiring. 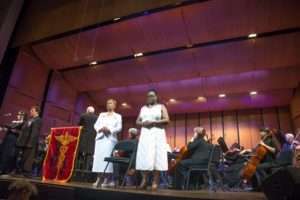 The Medical Musical Group Chorale and Symphony Orchestra organization held their annual Concert on August 13, 2017. The concert leadership team invited as their special guests, Veterans, active duty service members, Gold Star mothers and their families. The concert’s title theme was “Music You Cannot Refuse”. The concert was held in commemoration of the 72nd Anniversary of the end of WWII. 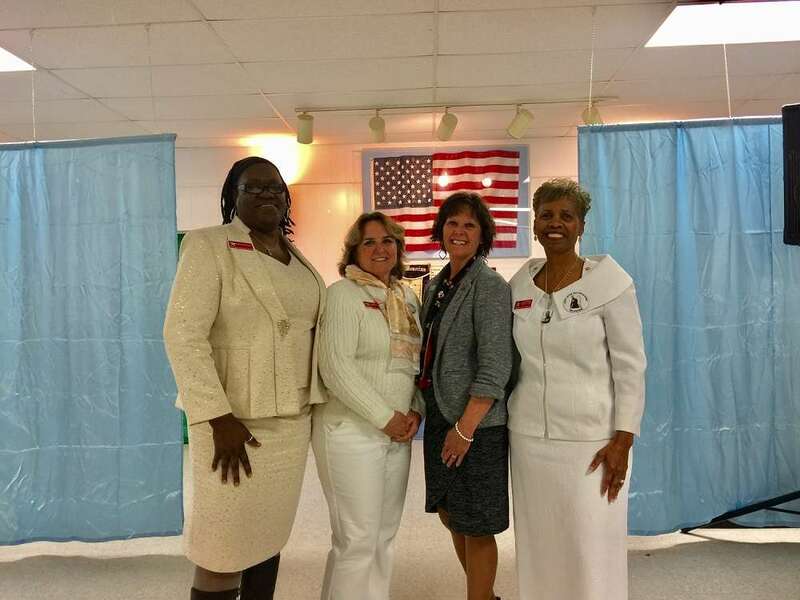 Donna Robinson and Janice Chance represented the Gold Star Mothers Maryland Chapter and Raina Taylor and Regina McCoy represented the Gold Star Wives Capitol View Chapter. The Veterans and Active Duty Service Members received a special salute. 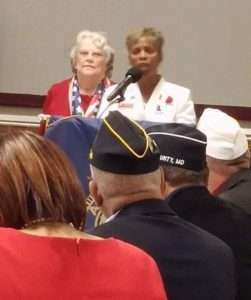 During the singing and playing of the Veterans Hymn, Donna and Janice participated in the “vacant chair dramatization.” Several of the guest speakers, and other attendees shared how deeply touched they were as they watched the dramatization. It served as a strong visual reminder that freedom is not free and that there is a family member connected to every fallen hero. 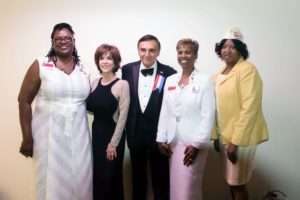 During the second half of the concert there were thematic segments of integrated dramatic readings and music performed by several distinguished guests including Tony Lo Bianco, Hiliary Fordwich, Darryl Haley and Deana Martin. Mrs. Deana Martin sang two of the popular songs that are often requested by military audiences. Some musical arrangements included songs from the popular movie, “The Godfather”. The audience was surprised when D’ Alyse, Lo Bianco, Deana Martin, Dr. Marc Shepanek and a member of the chorus did the Waltz to one of the God Father songs. The concert was directed by “Doctor Maestro”, Victor Wahby, M.D. The concert was well attended and the Gold Star Family mothers and wives had the honor to meet and thank several of our Heroes, orchestra and choir members. 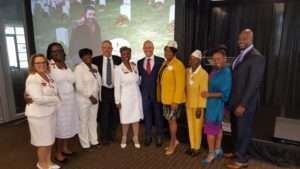 They also met and took pictures with distinguished guests. It was an honor to be among so many heroes, to hear such beautiful inspiring music and dramatic readings. The Warrior Event organization leaders, Mr. John O’ Leary and Mr. Bob Saunders, invited the Gold Star Mothers Maryland Chapter members to volunteer at their tailgating event prior to the very first Nitro Circus event to be performed in Annapolis. The following moms assisted with the set up and the serving of the food and a few other duties as required: Regina Barnhurst, Janice Chance, Elsheba Khan, Donna Robinson, Joyce Goode, two of her family members and Johnnie Pearson, a Blue Star mom. The tailgating social was held on the front lawn of the Navy Marine Stadium near the main entrance. The moms and families were also invited to attend the nitro circus after the tailgating social. The social was well attended and the attendees raved about the delicious food that was donated by several local businesses. 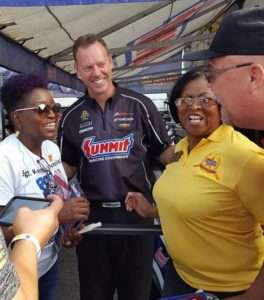 Travis Pastrana, the main Nitro Circus performer and other members of his team, took time to mingle with the guests, especially with the wounded warriors and their families. They autographed pictures and also took pictures with the wounded warriors and other guests. Travis also took time to greet and take a group photo with the Gold Star mothers and the Warrior Event leaders and staff. There was much excitement and celebrating because Travis who is a resident of Annapolis was performing for the first time in the place where he grew up. Even though there was a brief rain shower prior to the circus, Travis and his team were able to perform as scheduled. It was a day that many will not forget. The Maryland chapter members considered it an honor to serve and are looking forward to volunteering at future events. 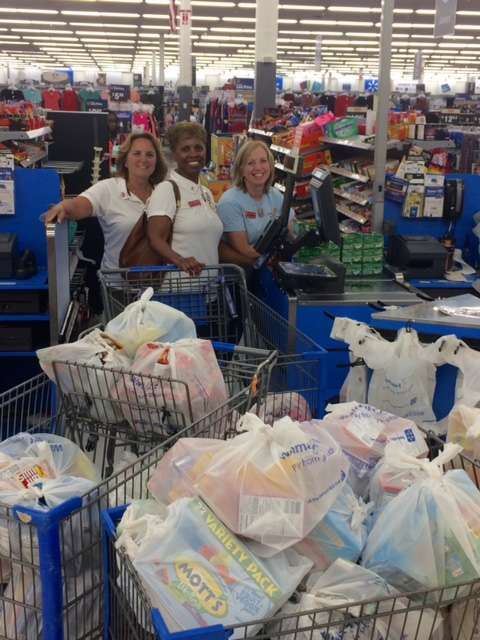 Janice Chance, Gina Barnhurst, and Theresa Mills went shopping for two deployed units of Heroes on Wednesday. They collected toiletries, candies and other goodies for our service members. 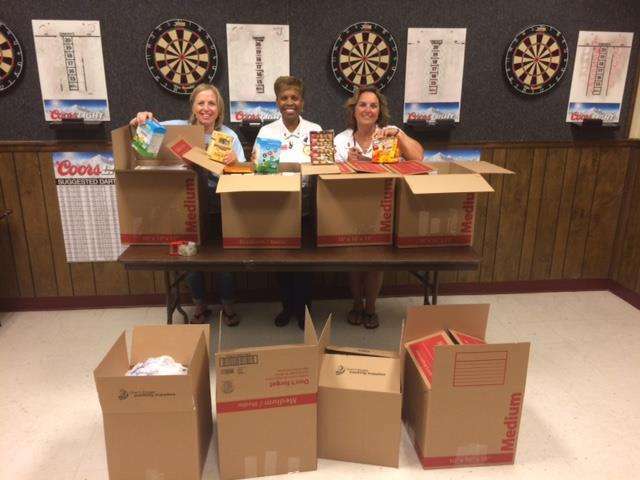 Many thanks to the American Legion Post 60 in Laurel for providing the space to package the goodies and special assistance in loading the boxes in our cars. This year, we have supported eight deployed units by sending care packages expressing our love and gratitude for their courage and sacrifice in serving our country. 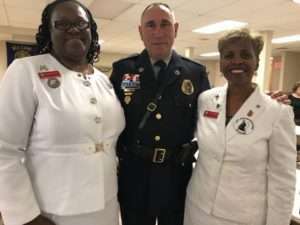 Mr . Peter Guen, Knight of Justice for the Johanniter Order, invited members of the Gold Star Mothers Maryland Chapter, Inc. to assist with serving at the Johanniter Order and the Order of the Malta’s 10th Annual Pre Independence Day dinner. It is sponsored for the wounded warriors, active duty service members, their families and staff. 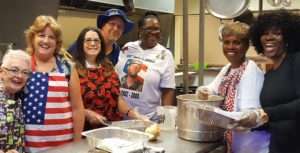 The dinner was served in the Warrior Cafe in Building 62 on Wednesday June 25, 2017. 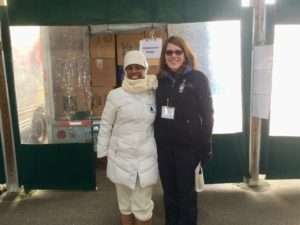 Lauren Seidler, Donna Robinson and Janice Chance assisted with the set up and serving. It was well attended and many of the attendees expressed their appreciation for the service, food, music, and fellowship. 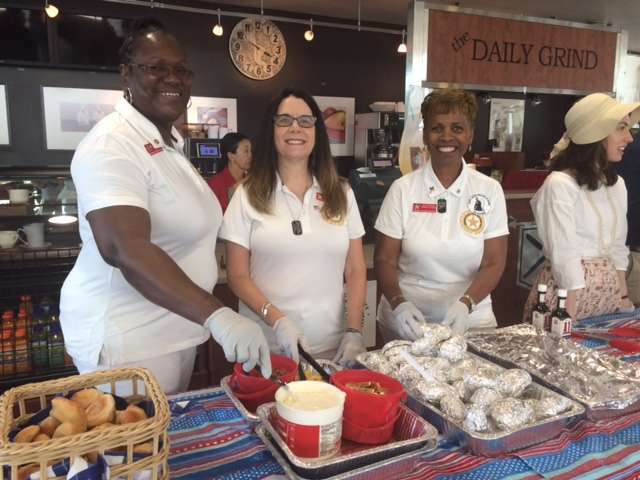 It was an honor to serve some of our heroes, their families and staff. It was also a blessing to see the smiles on the faces of the children as their participated in activities that was organized for them. The fellowship was wonderful, the food was delicious and the music was great. It was truly a memorable event. 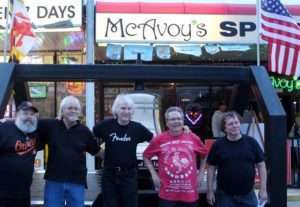 We are looking forward to serving again at one of their events. 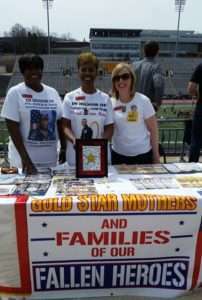 Special thanks to Peter and his team for their continued support of Gold Star Mothers and our families. 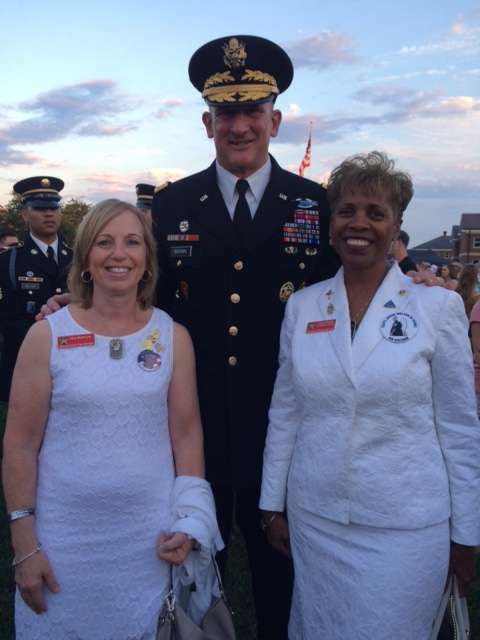 On Wednesday June 21st, Gold Star Mothers Janice Chance and Gina Barnhurst attended the United States Army Twilight Tattoo parade at Fort Meyer parade field in Arlington Virginia. The June 21st parade honored Vietnam Veterans. Before the parade the Vietnam Veterans were asked to stand and be recognized by the audience. Gold Star families were also asked to stand to be recognized. The Twilight Parade is a military pageant which gives the history of our military through music and dramatic performances. The parade features The 3rd U.S. Infantry Regiment (Old Guard) and the U.S. Army Band “Pershing’s Own”, as well as performances by The U.S. Army Blues, The U.S. Army Band Down Range, The Old Guard Fife and Drum Corps and the U.S. Army Drill Team. 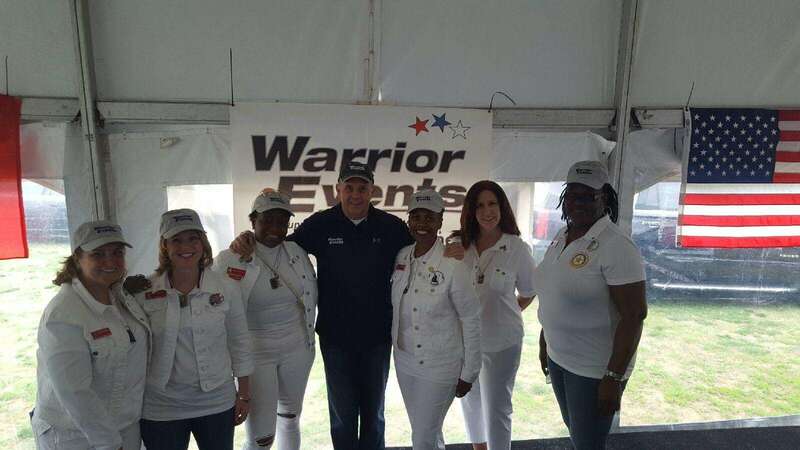 Janice and Gina had the pleasure of meeting General Brown after the performance and getting our picture taken with him and some of the military performers. It was a wonderful evening! 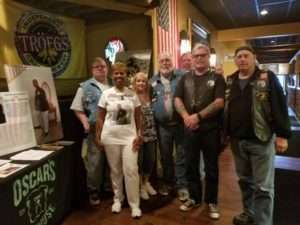 On June 3, 2017, Captain John Odber WarFighters’ Motorcycle Club held their Polka Run Fundraiser and Fallen Hero Honor Ride. 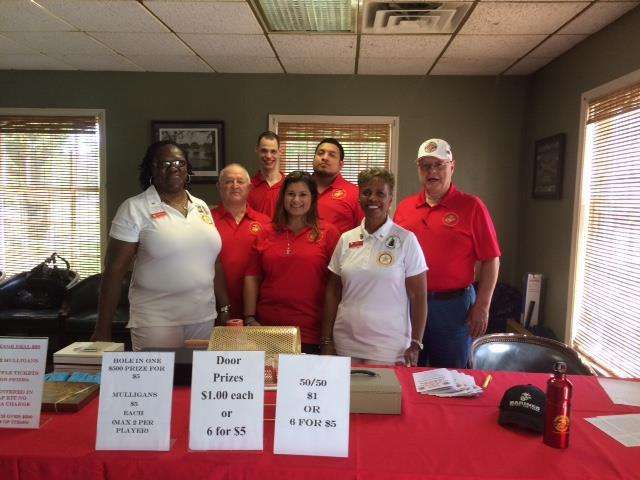 Most of the members of the club are Iraq and/or Afghanistan Veterans, but a few of them are also active duty military. 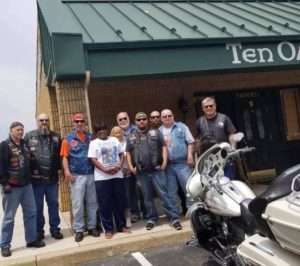 Their Mission was to raise money to support the Patriot House homeless shelter and honor five Maryland fallen heroes. 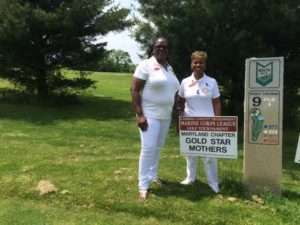 The Maryland Gold Star Mothers Chapter was asked to provide the names of mothers who lived close to their scheduled ride stops. 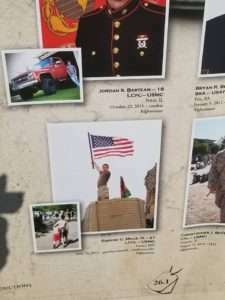 At each stop, the riders recognized the fallen hero at their assigned designated slot. 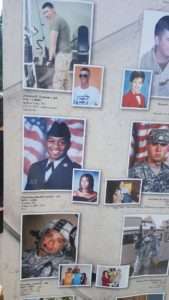 There was a write up about each fallen hero along with their picture. 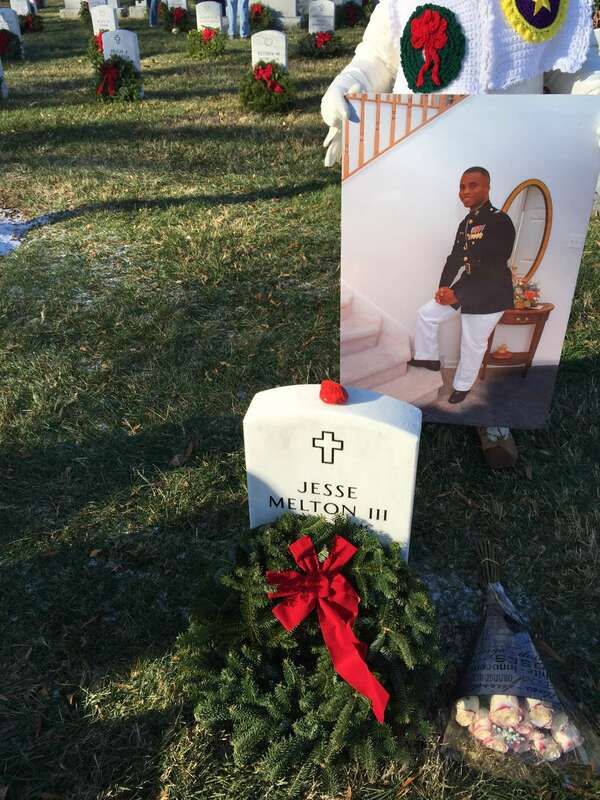 The State of Maryland has loss 144 Military members to the war on Global Terrorism. 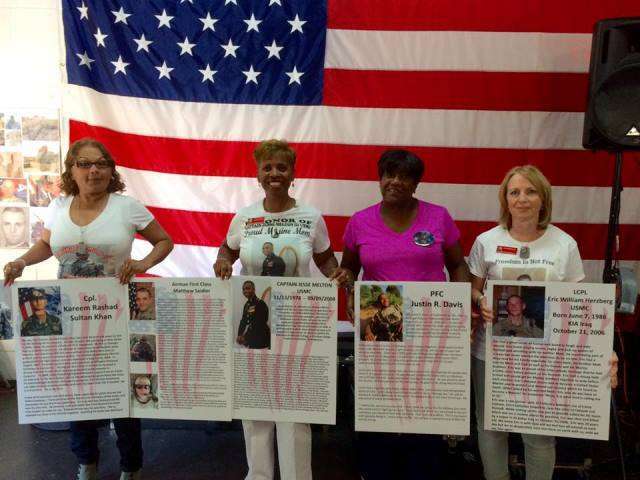 The goal of the Warfighters MC is to honor each fallen hero each year until all 144 Heroes are honored. 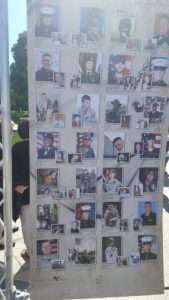 The pictures of the fallen they have honored are hung in their clubhouse. Gold Star Mothers Maryland Chapter recently supported the Cystic Fibrosis Foundation by donating $500 to the Jennifer’s Journey Team at the annual Annapolis Great Strides Walk for Cystic Fibrosis. Janice Chance joined the team along with Bob Saunders (Warrior Events) and Bob’s daughter Jennifer, who suffers from this debilitating disease. This was a fun, family-oriented event with a healthy 5K walk, children’s activities, food and festivities. 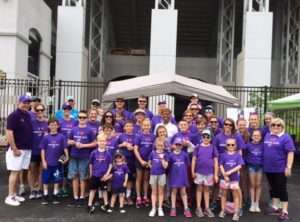 Each year, more than 125,000 people participate in hundreds of walks across the country to support the Foundation’s mission to cure cystic fibrosis and raise awareness for this rare, genetic, life-shortening disease that makes it difficult to breathe. As of this posting date, they have raised $318,168 with Jennifer’s Journey being the top team who raised $74,100. Good job Jennifer’s Journey and Janice for participating! On Monday May 29th, Gold Star mothers and families were invited by Mr. Keith Roberts Chairman and the Lamky, Luther, Whitehead Veterans Memorial committee to attend the annual Memorial Day Remembrance Ceremony held at the Holly Hills Memorial Gardens. 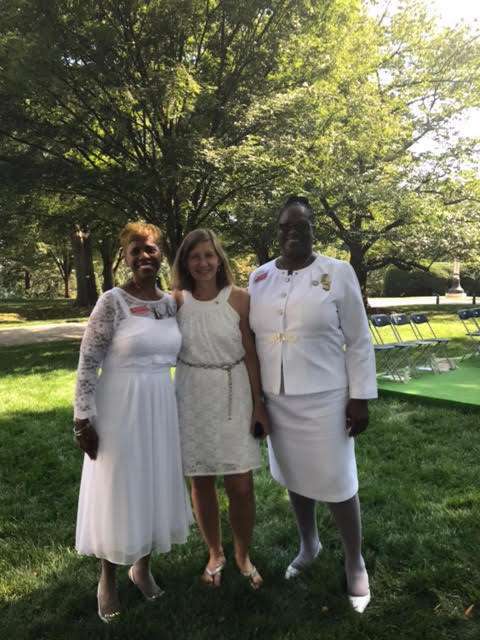 Janice Chance and Rosemarie Ceo represented the Maryland Chapter Gold Star mothers, there were also several other Gold Star family members that attended the ceremony. 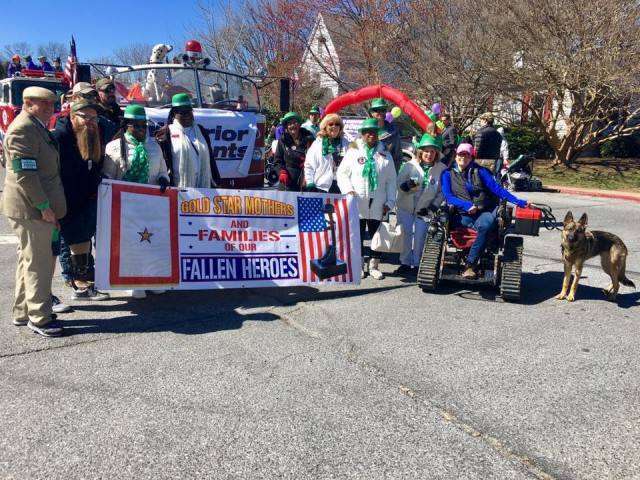 Prior to the ceremony, there was a short parade that started from the Holly Hills Memorial Gardens office down to the memorial where the ceremony was held. Several veteran service organizations, scouts from the Chesapeake District of the Boy Scouts, members of the Civil Air Patrol, local elected officials and many citizens from the community were in attendance. 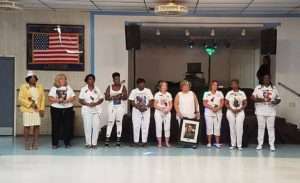 The women’s Auxiliary from the Veterans of Foreign War Post 6506 placed carnations as they read the names of each fallen hero who were listed on the memorials. 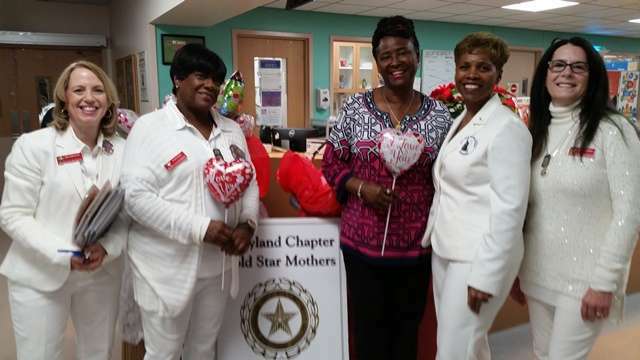 The Gold Star mothers were presented with a yellow rose and other gifts from one of the Boy Scout troops. 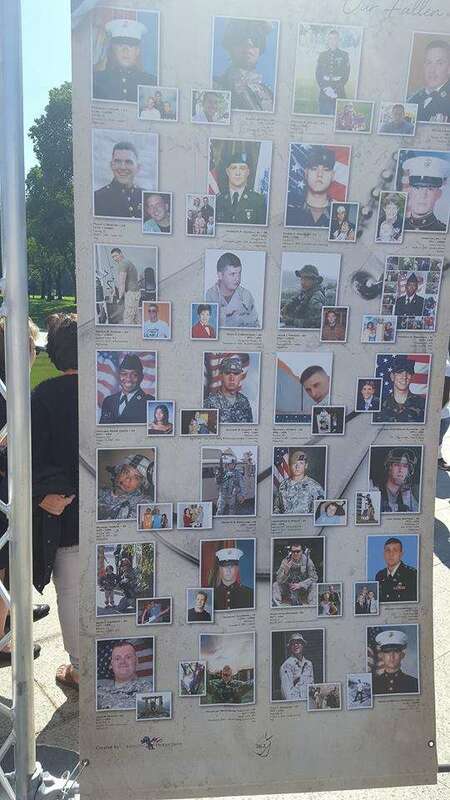 Three new names of fallen heroes were added to the memorials. 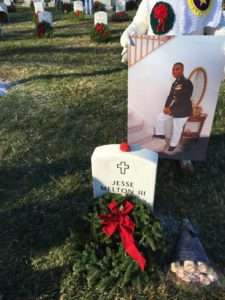 Captain Jesse Melton III, USMC, Killed in Action on 9/9/2008, the son of Maryland Chapter Gold Star Mother Janice Chance, was one of the names that was added to the Afghanistan Memorial along with SSgt Mark De Alencar who was killed in action on 4/8/2017. 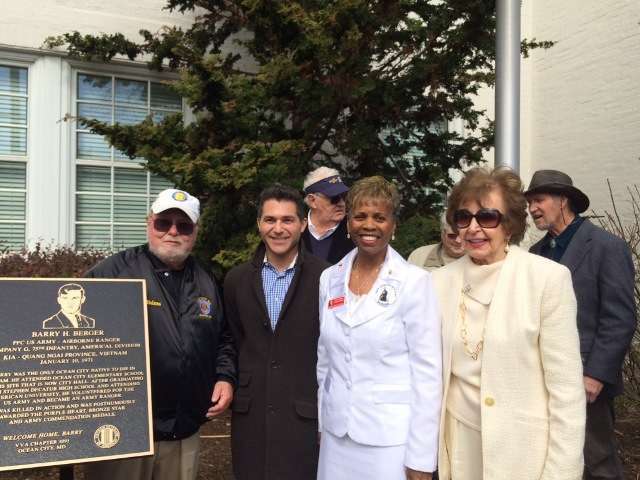 The name of Patrick Differ was added to the Korean War Memorial. Rosemarie and Janice were blessed to meet and thank many Veterans, active duty service members, their families and other attendees. 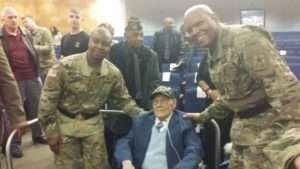 One of the special guests that they also had the pleasure to meet and talk with was Pastor James Lane, US Army, WWIII Veteran that served under General George S. Patton US Army. It was a wonderful ceremony. The 29th Division Association & Business Advocates for Veterans, Dr. Lorraine Fulton Ed.D, President and staff of Gerstell Academy, Representatives from many local Veteran Service organizations, Janice Chance Gold Star Maryland Chapter member, Carroll County Veterans Service Council, Carroll County Hospital, library and other representatives and community business leaders worked together to organize several events leading up to the 2017 Memorial Day Remembrance Ceremony. 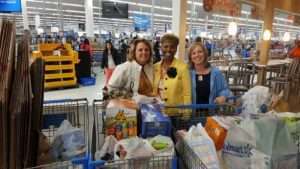 Many other individuals within the community made financial contributions and volunteered time to assist in making the events happen. On Friday, May 26th 9,000 flags that were placed on the front lawn of the Gerstell Academy located in Finksburg, Maryland. They represented and Honored Maryland Heroes that died during military service or that are missing in action. Janice chance, Alison Malachowski and a friend, Mon Lisa Johnson joined a large number of volunteers with the placement of the flags. On Saturday May 27th, the ceremony had to be moved indoors due to the rain. However, the ceremony was wonderful. 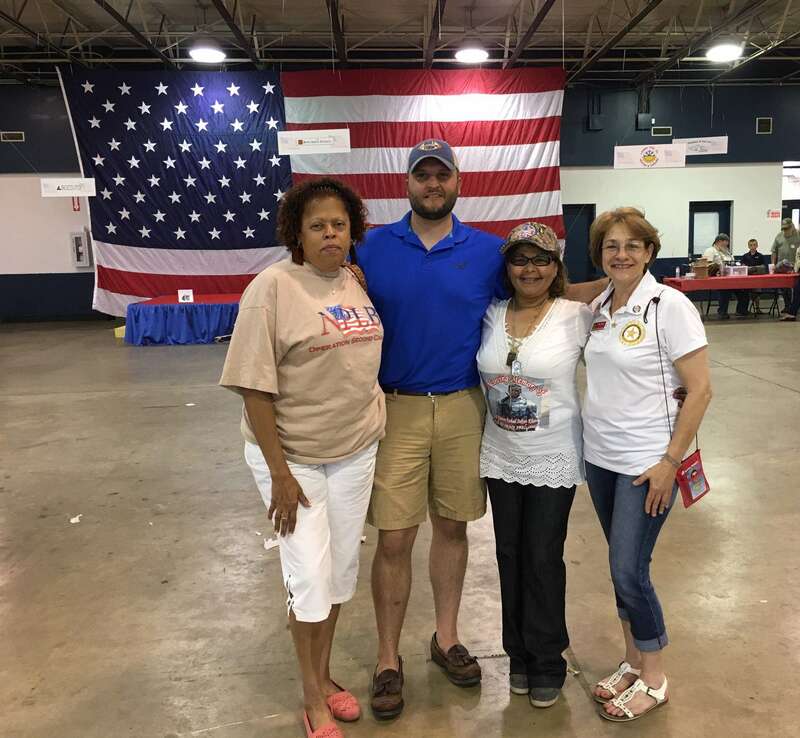 Maryland Chapter members Donna Robinson and Janice Chance, Sandy Seidel, Pennsylvania Gold Star Mother, other Gold Star family members, many other patriotic citizens, veterans, active duty service members, local Veteran organization members and Government officials attended. Former Governor Robert Ehrlich gave a heart-warming message. The events ended with a Memorial Day parade in Westminster on May 29th and the flags were on display through the end of Memorial Day. On May 20, 2017, Maryland Gold Star Mothers Kelly Swanson, Janice Chance and Donna Robinson joined with Virginia Gold Star Mothers Cynthia Ozbat and Ruth Eileen Os molski at the US Patent Trademark Office in Alexandria, VA. 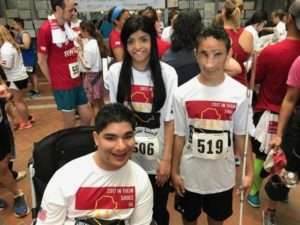 They, along with 388 supporters, participated in the Iraqi Children Foundation’s (ICF) 5th annual 5k run/walk to benefit Iraqi orphans, street children, and children displaced. 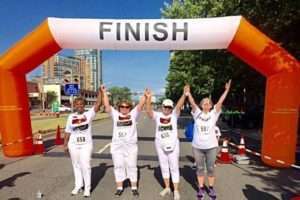 While Donna assisted with various activities inside, the rest of the team walked and proudly finished the 5k! This year, the event included three young Iraqi Ambassadors: 15 year old Teeba, who was in a bombing as a baby, 14 year old Humoody, who was shot in the face, and 22 year old Al a’ a, who was abandoned as a little boy because of his cerebral palsy. 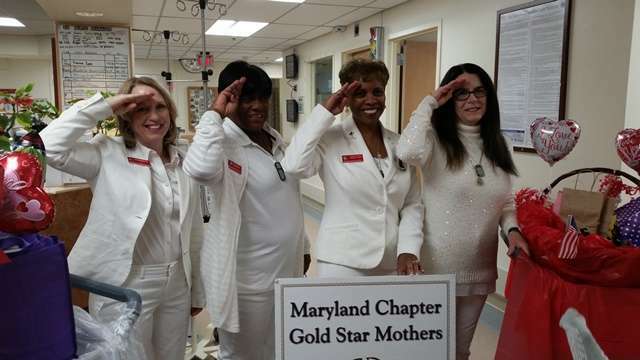 It is always a great honor for the Maryland Gold Star Mothers to support and attend this wonderful event. 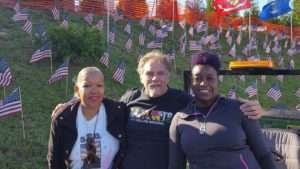 On May 20, 2017, Chuck and Hope Ritz founders of the Hope and Peace Foundation held their 2nd Annual Memorial Day ROCK Fest. 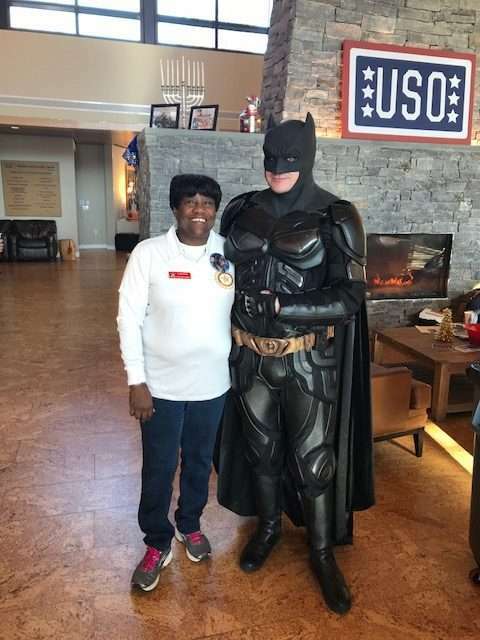 They have been and continue to be faithful supporters of Gold Star families, Veterans, active duty service members and citizens within the community. 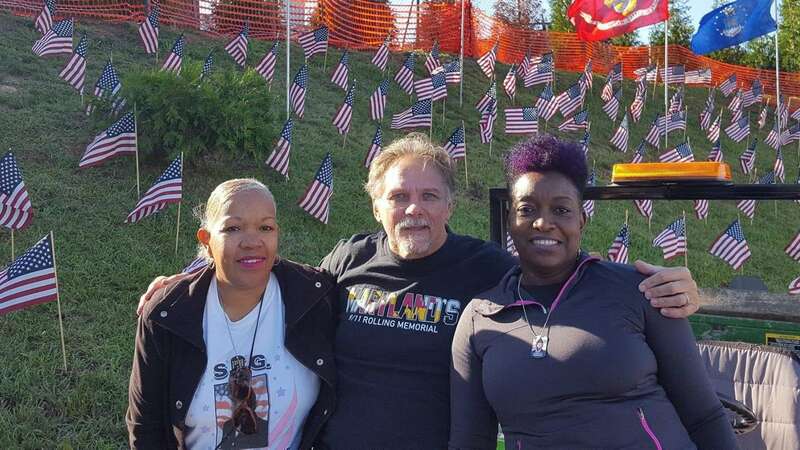 Chuck Created and dedicated Maryland’s 9/11 Rolling Memorial to REMEMBER & HONOR the lives lost on 9/11 and in the war on terror since that horrific day. 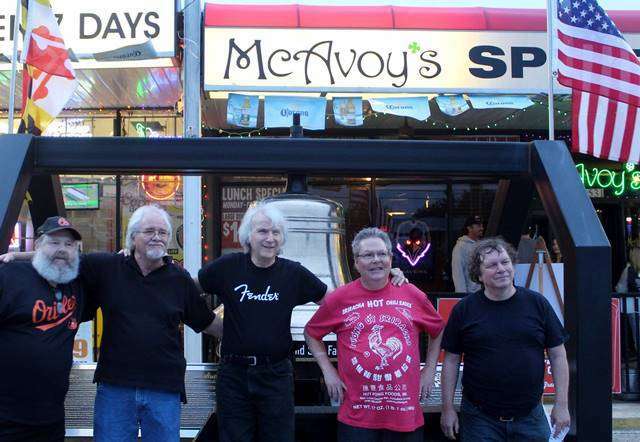 Chuck and Mr. Nic Shah, the owner of McAvoy’s restaurant, hosted the event again this year. Mr. Shah is also a Faithful Supporter with a Heart of Gold. He is always a Gracious and Generous Host. 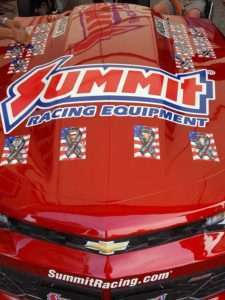 Gold Star Families were invited to attend and participate in this special fundraiser event. Janice Chance represented the Maryland Chapter Gold Star Mothers. She was given the opportunity to share about her fallen hero Captain Jesse Melton III USMC, the Maryland Gold Star Mothers organization and the Maryland Chapter’s 5th Annual Crab Feast & Bull Roast. 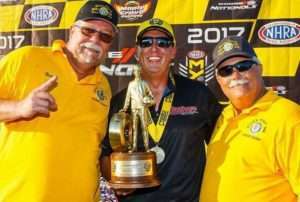 This event that is scheduled to be held on September 17, 2017 at the American Legion Post 60, located in Laurel, Maryland. 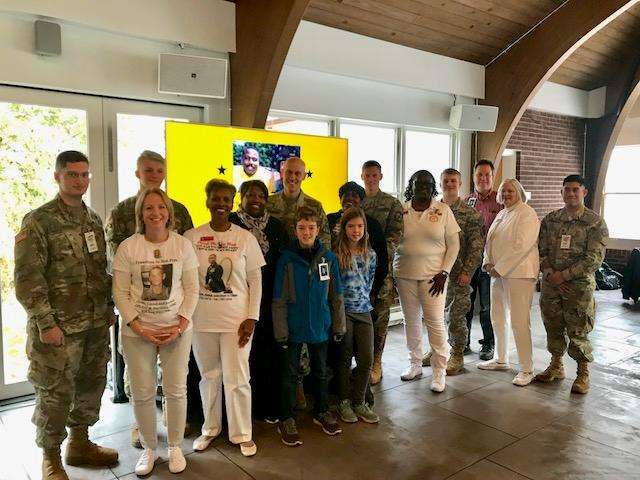 Mrs. Peggy Marchanti, Gold Star wife shared about her fallen Hero husband Major Robert Marchanti U.S. Maryland National Guard and about the Towson University memorial scholarship fundraiser event for her husband that is scheduled for July 2017. 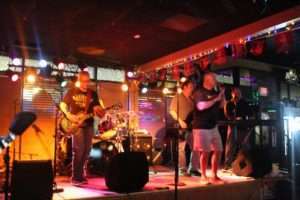 There were several bands that performed: Bristol Blue, Stolen Identity, That Which Remains, NO Nelsons. They truly rocked the place. 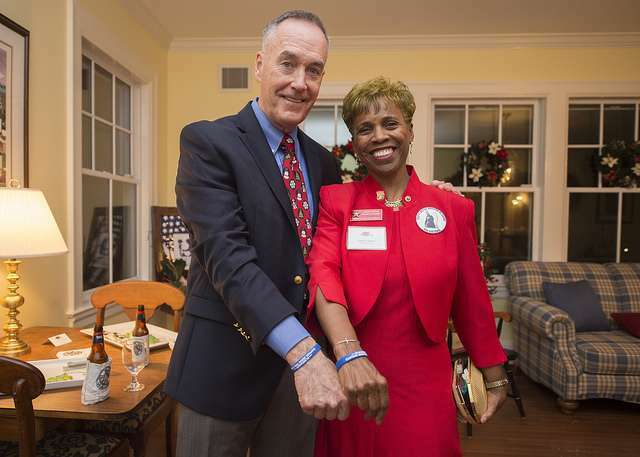 Chuck Ritz made a surprise announcement that the funds raised were going to be donated to the following Gold Star organizations and foundations: Maryland Gold Star Mothers, Major Robert Marchanti Memorial Scholarship Fund, Catch A Lift and the Anderson-Snyder Fund. Heartfelt Thanks to Chuck and Hope, Mr. Shah and all of the participants and supporters. 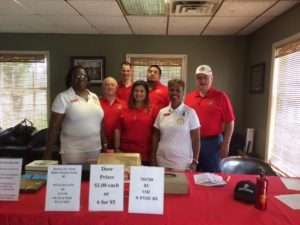 Mr. Daniel Turner, Commandant of the Carroll County Marine Corps League Detachment 896, invited Gold Star Mothers to volunteer at their annual golf tournament fundraiser. 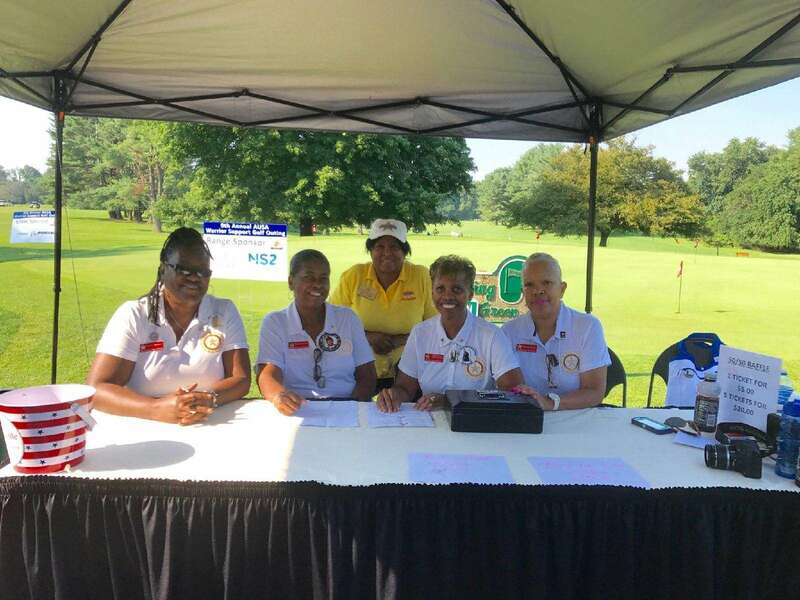 Donna Robinson and Janice Chance served as volunteers during the event and The Maryland Chapter members were honored to be able to sponsor two Veteran teams. Organizations that donated sponsorships included personalized signs at designated holes throughout the golf course. 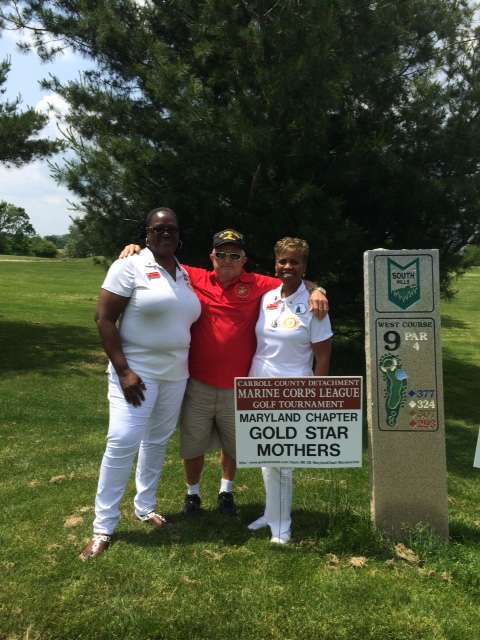 The Gold Star Mothers Maryland Chapter sign was posted at the 9th hole, which was a par 4. 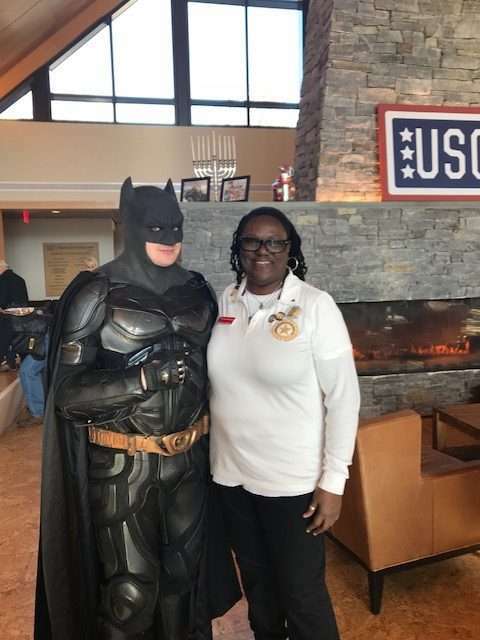 It was great to serve alongside of some of our Nation’s Heroes and to explore opportunities to partner and serve during upcoming events. The Carroll County Marine Corp League’s mission is to support Veterans and to incubate a transgenerational culture by mentoring the Carroll County Young Marines and by encouraging the relevance of Elder Marine participation. 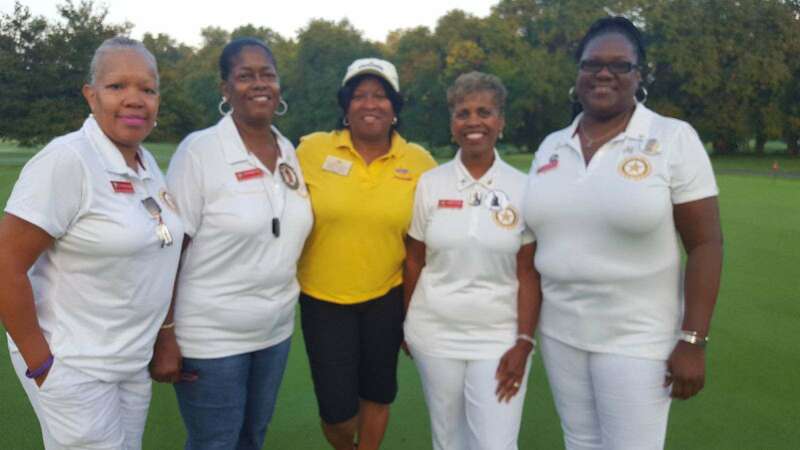 It was a successful event and the Maryland Chapter is looking forward to participating again next year. 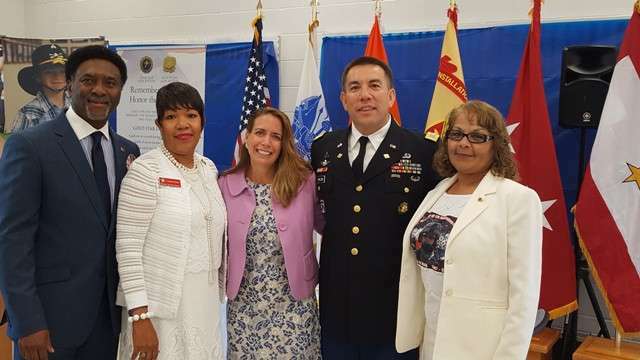 The Harford County Chamber of Commerce and local businesses sponsored their 40th Annual Military Appreciation luncheon on May 18, 2017. 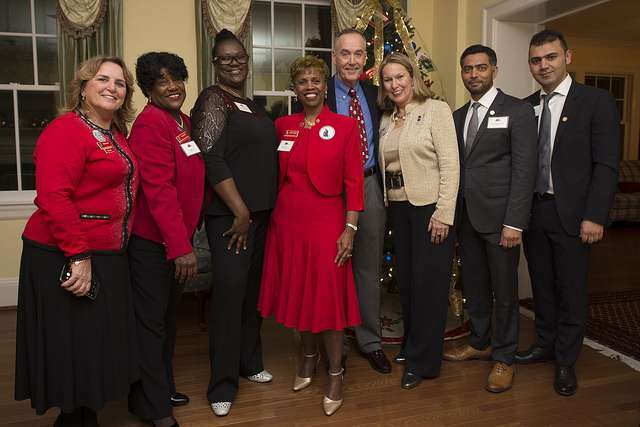 The event was organized by the Chamber of Commerce Military Affairs Committee. 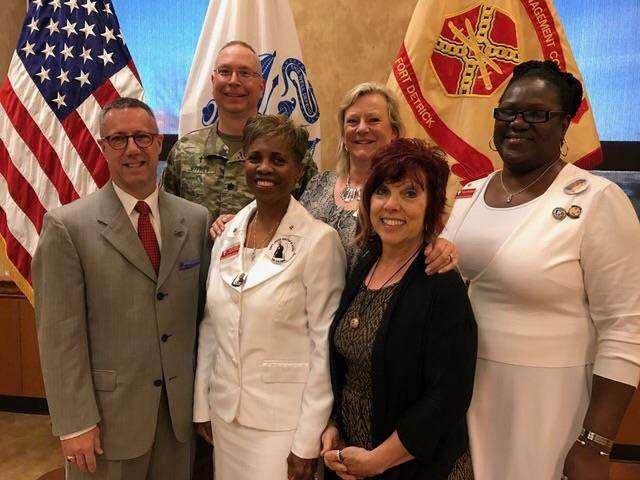 The luncheon is held annually to honor members of the United States Armed Forces and civilian workforce of Aberdeen Proving Grounds (APG) for their service, sacrifice and contributions to the Nation, abroad and within the community. 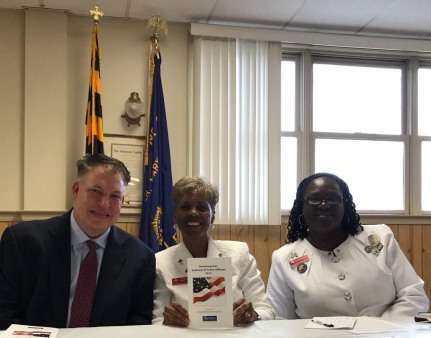 Mr. Michael Farlow, Survivor Outreach Services Coordinator and Maryland Gold Star Mothers Donna Robinson, Yvonne Green, Rosemarie Ceo and Janice Chance were invited to this special event. 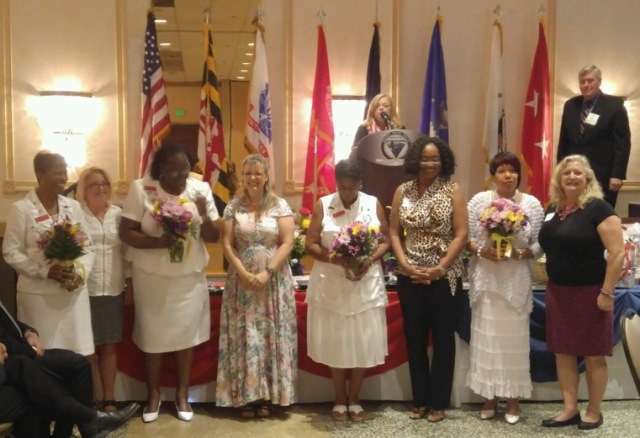 The mothers were recognized and presented with a bouquet of flowers by officers and members of the Women in Defense Mid-Atlantic Chapter organization. Mr. David Craig, Executive Director of the Maryland World War I Commission was the Key Note Speaker. He gave a great history lesson about Aberdeen Proving Ground and shared stories about several American Heroes that served during WWI. 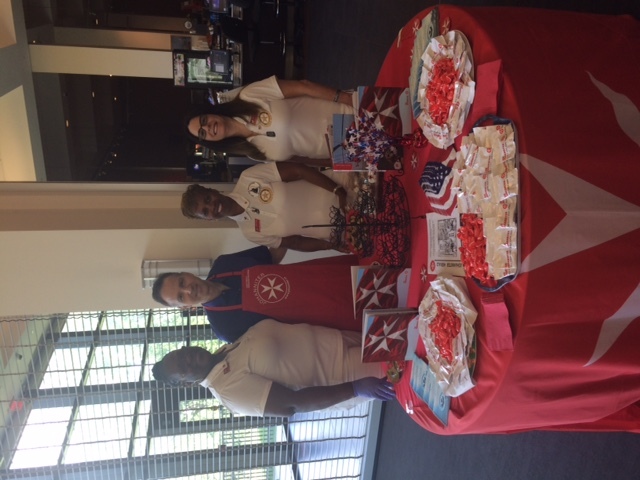 The mothers were blessed to be able to meet and thank many of our service members and their families. 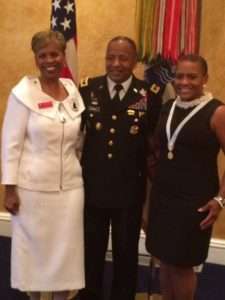 Awards were given to the Soldier of The Year, Non Commissioned Officer of the Year and the Military Family of the Year. Two of the recipients this year were woman. Yeah! It was a great turn out again this year. 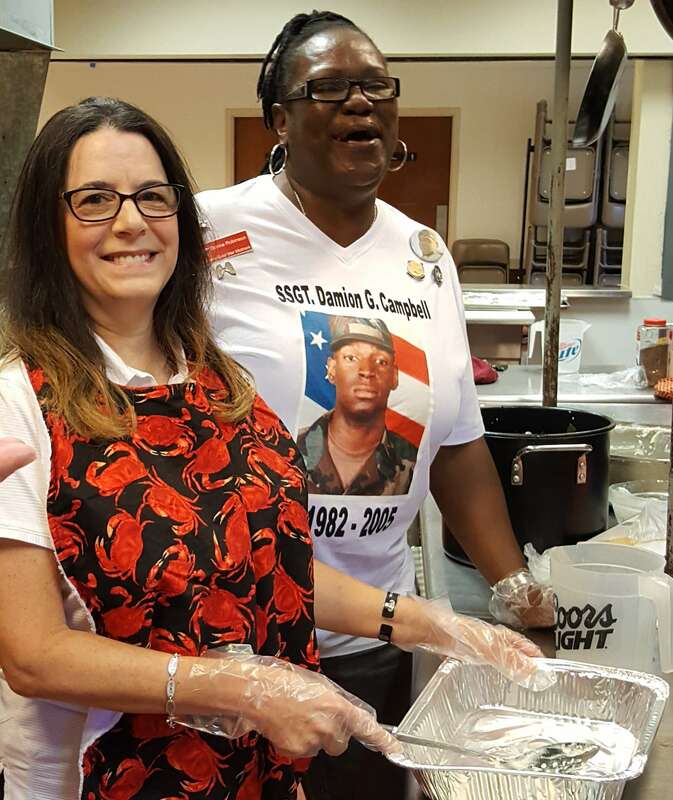 Approximately 350 people attended the luncheon and the majority were active duty service members, their families and Veterans. There were also several elected officials, APG leadership staff, representatives of local businesses and other supporters. It was truly a memorable event. On Saturday May 13, 2017 a groundbreaking ceremony for the “HELP Veterans Village” was held at the Perry Point VA Medical Center. 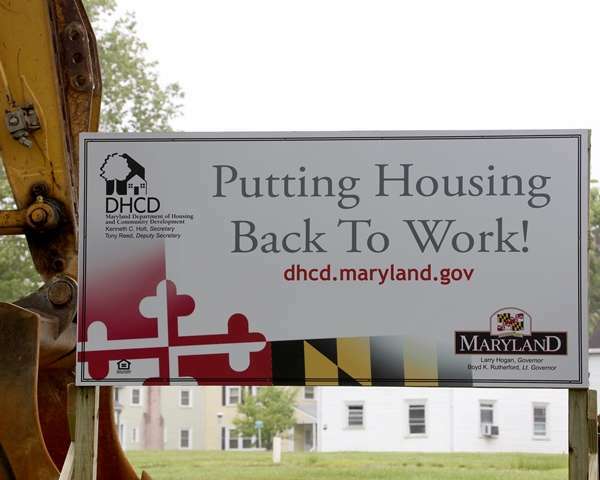 75 homes will be constructed for at risk and formerly homeless veterans. Donna Robinson and Janice Chance, Maryland Chapter members, joined a large group of members from a variety of Veteran Service organizations and other community stakeholders for the historic occasion. Governor Hogan was the main guest speaker. 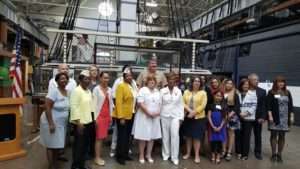 David Cleghorn, Senior Vice President of Real Estate Development at HELP USA, Dr. Adam Robinson, Director of VA Medical Healthcare System, several VA leaders, elected officials, staff members and volunteers were also in attendance. 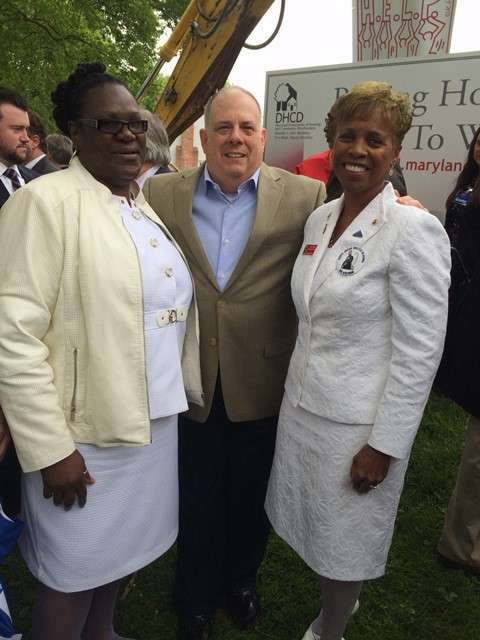 Governor Hogan expressed his appreciation to everyone who has been working to make the HELP project possible. He stressed the importance of our community and legislators continuing to honor and take care of our Veterans. Mr Cleghorn commented that “In a few short months, homeless veterans will start moving into brand new homes on this beautiful site”. Mr. Malcolm Bell, an Air Force Veteran and Perry Point Resident, also spoke. He shared a heart-warming message that is now posted on Facebook. There was much excitement and celebrating among the attendees. 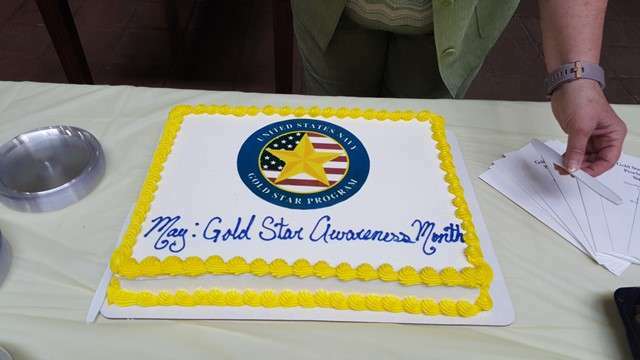 On May 11, 2017, Rear Admiral Charles Rock, Commandant Naval District and the Navy Gold Star Program staff hosted a Gold Star Awareness Month Proclamation Ceremony. It was held at the Navy Museum Washington Navy Yard in Washington, DC. 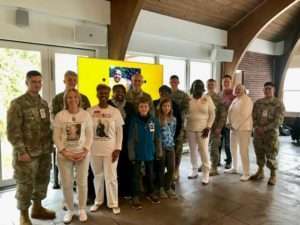 18 Gold Star family members attended, including Donna Robinson, Kelly Swanson and Janice Chance of the Maryland Chapter Gold Star Mothers organization. We enjoyed music that was provided by members of U.S Navy Band. They played several patriotic songs in addition to the National Anthem. RDML Rock gave a heart-warming welcome and message. He then read and signed the Gold Star Awareness Month Proclamation. RDML Rock read the proclamation with passion, especially the last few lines: “NOW, THEREFORE, I, Charles Rock, Regional Commandant Naval District do HEREBY proclaim the Month of May 2017 as: GOLD STAR AWARENESS MONTH. 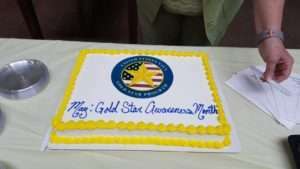 I HEREBY call upon All members of our Navy Family to recognize May as Gold Star Awareness month, Honor the Memory of the Fallen and Pledge to Support Gold Star Families. IN WITNESS WHEREOF, I have hereunto set my hand on this 11th day of May 2017”. After the ceremony, there was a cake and punch reception followed by a white glove tour of the Museum that was conducted by Museum Curator Jim Bruns. It was a blessing to meet and spend time with other Gold Star family members. It was truly a memorable event. 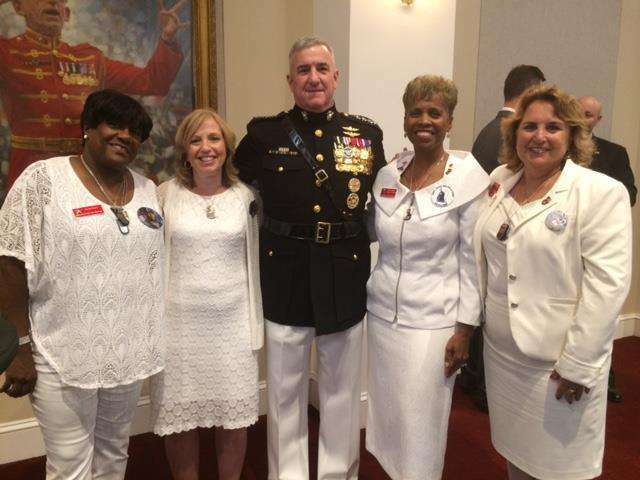 On Friday, May 5, 2017, Maryland Chapter Gold Star Mothers were invited to attend a VIP Reception and Evening Parade located at the Marine Barracks in Washington, DC by the Assistant Commandant of the United States Marine Corp General Glen and Mrs. Gail Walters. Gold Star Mothers Janice Chance, Regina Barnhurst, Paula Davis and Theresa Mills attended. They were recognized during the reception prior to the parade and were able to talk with and thank many of the Heroes for their Selfless Service and Sacrifice. 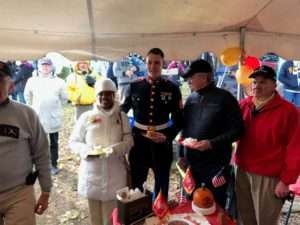 Although the parade ended early due to rain, we enjoyed our time with our hosts, dignitaries and many Marines. The guest speaker was a former Marine and decorated Vietnam War Veteran Colonel Paul Cook. Col. Cook represents California’s 8th Congressional District in the U.S. House of Representatives. After the parade, we were escorted to the NCO club by US Marine GySgt William Dixon (Ret) who served as the USMC band leader for Janice’s son during his burial ceremony at Arlington National Cemetery in 2008. We were able to meet, spend time with and take pictures with “Chesty”, the Marine Barrack’s faithful mascot. We were warmly greeted by Chesty and the Marines. Janice was surprised when she was presented with the NCO’s Marine’s special guest Certificate of Appreciation for her attendance and outstanding service. It was truly a memorable evening. Janice Chance, Gina Barnhurst, and Theresa Mills went shopping for two deployed units of Heroes on Wednesday. 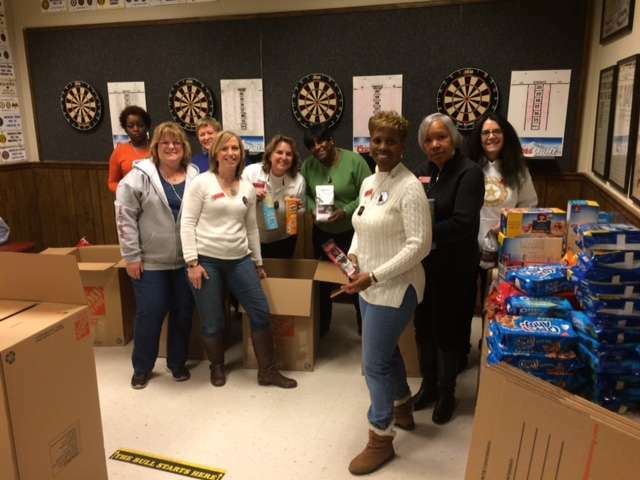 They collected toiletries, candies and other goodies for our service members. 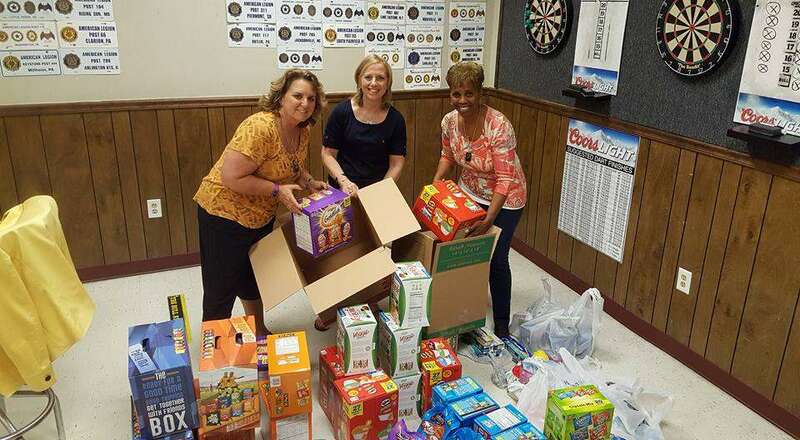 Many thanks to the American Legion Post 60 in Laurel for providing the space to package the goodies and special assistance in loading the boxes in our cars. Warrior Events invited Maryland Gold Star Mothers to help with their Annual Spring Tailgate for the Troops fundraiser at the Army Vs. Navy Lacrosse Game that was held at the Navy-Marine Corps Stadium. Mothers included Janice Chance, President; Michelle Murphy, 1st Vice President; Gina Barnhurst, Secretary; Theresa Mills, Treasurer; Donna Robinson and Deborah Higgins Tucker. Guests and donors were treated to a variety of food and drinks that were donated by local businesses, as well as being entertained with music from a live band. There were also large television screens in the covered tent that broadcasted the game. 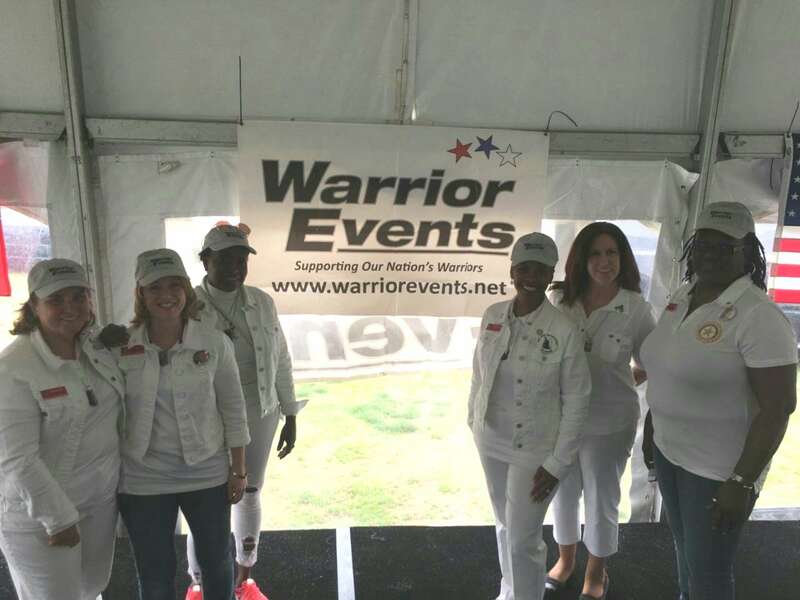 Warrior Events’ mission is to provide opportunities for interaction, enjoyment and camaraderie for wounded warriors and to raise awareness and appreciation among the public. Their sole purpose is to enrich the lives of those wounded. 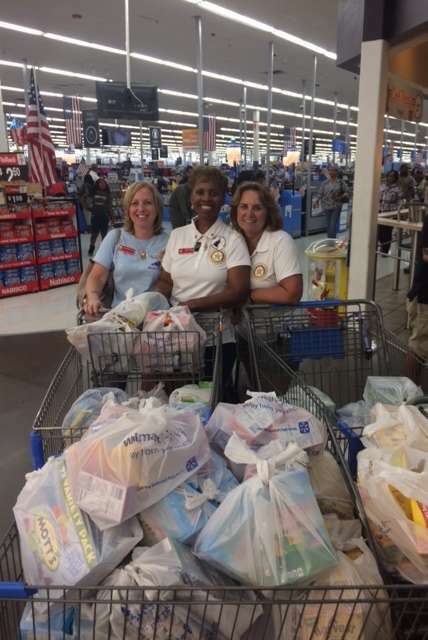 We are thankful to help and support this wonderful service organization! The final score of the game was Navy 10, Army 6. Congratulations Midshipmen! 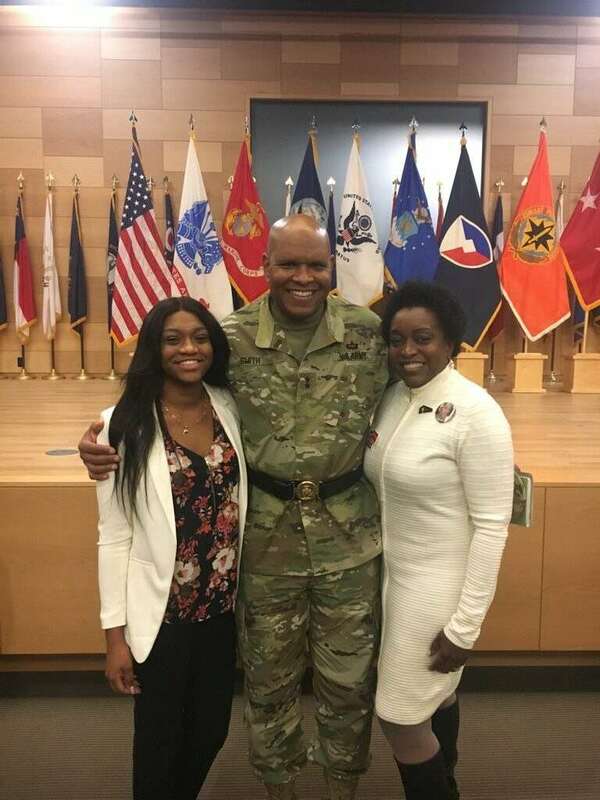 A Change of Command ceremony was held for Major General (MG) Bruce T. Crawford at the C4ISR Campus on the Aberdeen Proving Ground (APG) Army Installation. After 35 months of serving as the Commander of the U.S. Army Communications-Electronic Command (CECOM) Commanding General & Senior Commander, Major General Bruce T. Crawford’s position and services were concluded. The command of leadership was officially passed onto Major General Randy S. Taylor. 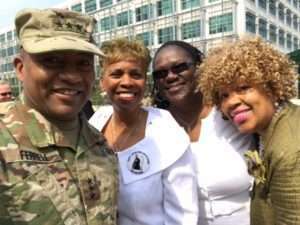 Donna Robinson, Yvonne Green and Janice Chance represented the Gold Star Mothers Maryland Chapter, Inc. MG Crawford has been reassigned to serve at the pentagon. General Gustave F. Perna, the 19th Commander of the U.S. Army Material Command, served as the officiate for the ceremony. 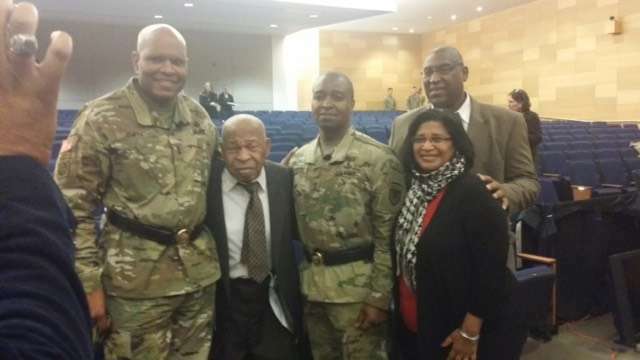 Several family members and friends of MG Crawford and MG Taylor were in attendance along with several Generals, service members, veterans, elected officials, community leaders, APG civilian senior leaders and APG civilian employees. MG and Mrs. Crawford will truly be missed because they developed a wonderful relationship with Gold Star Mothers and families. 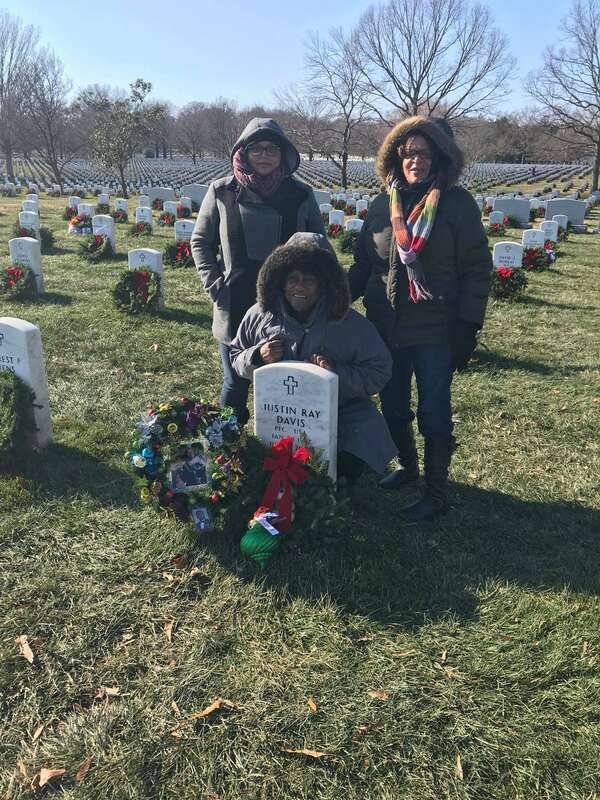 Mrs. Crawford, throughout her APG assignment, consistently reached out to and included Gold Star Mothers through special fellowships in her home. 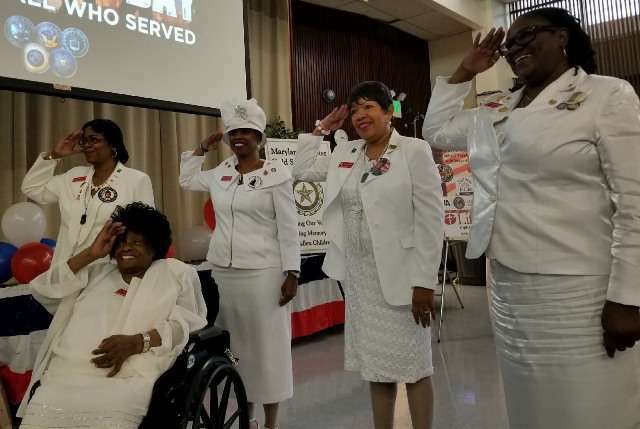 MG Crawford ensured that Gold Star Mothers and families were invited to special events and that our fallen heroes were honored and remembered at special designated events. Maryland Chapter Gold Star Mothers were invited to attend the Farewell Dinner for Major General (MG) Bruce & Mrs. Dianne Crawford. MG Crawford served as the 14th Commander of the U.S. Army Communications-Electronic Command (CECOM) Commanding General & Senior Commander -Aberdeen Proving Ground for approximately 35 months. He will be serving in a new position at the Pentagon. Janice Chance, President and Chaplain made a presentation on behalf of the Gold Star Mothers Maryland Chapter to both MG Bruce and Mrs. Crawford. 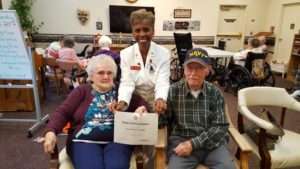 Janice gave a brief speech and presented MG Crawford with a Certificate of Appreciation for his unwavering support of Gold Star Mothers and families in addition to a special World Globe. Mrs. Crawford was also thanked for her support and service. She was presented with a Musical Prayer Globe. MG and Mrs. Crawford expressed their sincere thanks and reiterated their intent to continue to ensure that Gold Star Mothers and families are treated as APG family members and that our fallen heroes sacrifice will be honored and remembered at APG. 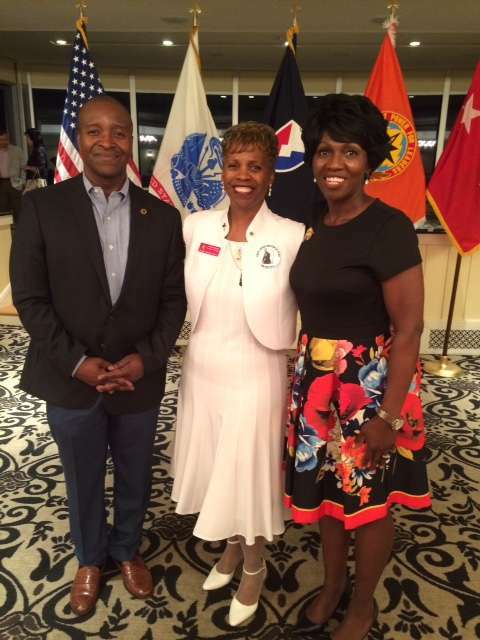 The dinner was well attended by military service members, veterans, local elected officials and community business representatives. MG and Mrs. Crawford received many Certificates of Appreciation, gifts and expressions of thanks for their exceptional leadership, service and support. It was truly a memorable evening. 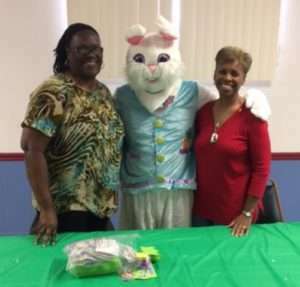 On April 8, 2017 Gold Star Mothers were invited to assist with the VFW Post 521 Annual Community Easter Party. 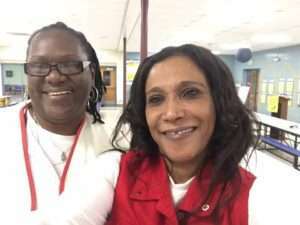 Donna Robinson and Janice Chance, who are also members of the VFW Auxiliary, served at one of the craft table stations assisting the children with making picture frames. It was a great turn out. There was much laughter and the children had to search for the Easter eggs that had been hidden outside on the front lawn area. After the Easter Egg hunt, the children were pleasantly surprised when the Easter Bunny showed up and gave out goodies and also took pictures with them. The children left with prizes, the crafts that they made and their baskets full of goodies. It was great to volunteer at an event provides opportunities for children to meet other children and to have fun. 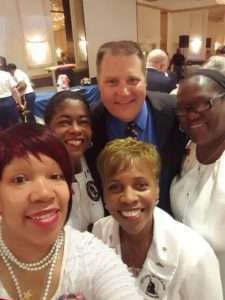 Gold Star Survivors were invited by Jeffrey Duncan, PhD, who is the Army Volunteer Corps Program Manager at the Army Community Service/Soldier and Family Assistance Center, to attend the Annual Gold Star Prayer Breakfast at Fort Detrick. 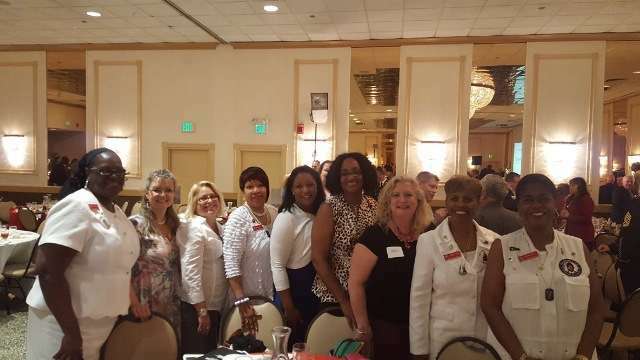 Maryland Chapter members Donna Robinson and Janice Chance attended the breakfast to support the Gold Star Spouses and to thank our active duty service members, and veterans for their selfless service and sacrifice. 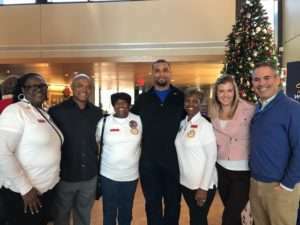 Several other Gold Star Survivors, COL and Mrs. Michele O’ Brien, many active duty service members and civilian employees also attended the breakfast. MG Barbara Holcomb, Commanding General for Operations, U.S Army Medical Command Chief, U.S Army Nurse Corp gave a short, heart-warming message and provided information about Gold Star Families. Chaplain Michael Jeffries did the invocation and shared a brief inspirational message. 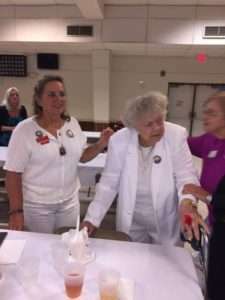 After breakfast, Mrs. Marian Frankenhauser, Gold Star Wife, and a Retired LTC U.S Army Nurse was the keynote speaker. She delivered a beautiful message and encouraged the married attendees to value their spouses, especially the men. 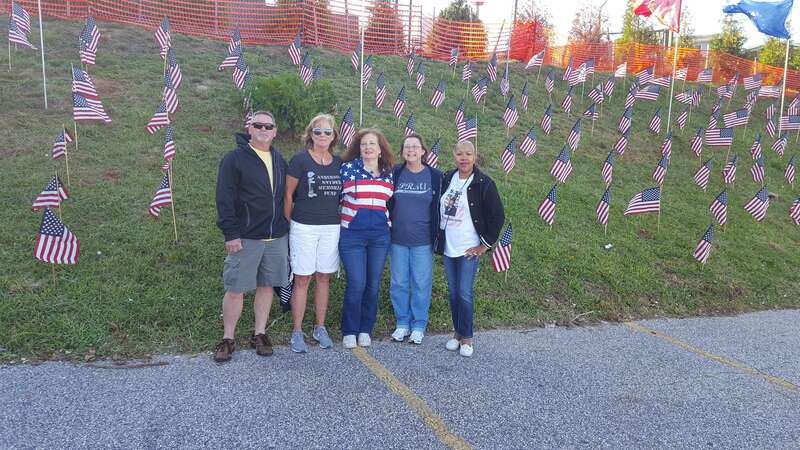 After the event, several attendees expressed their appreciation to Mrs. Frankenhauser’s for her message and also took time to talk with the Maryland Chapter Moms and other Gold Star Survivors. 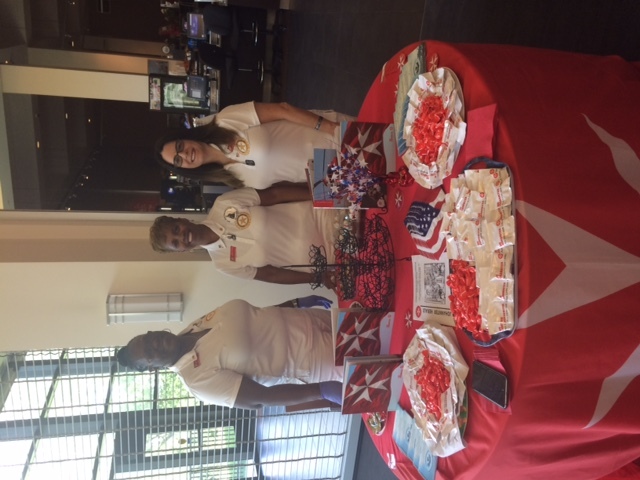 A few of the attendees also explored volunteer opportunities and inquired about ways that they can support Gold Star Survivors. 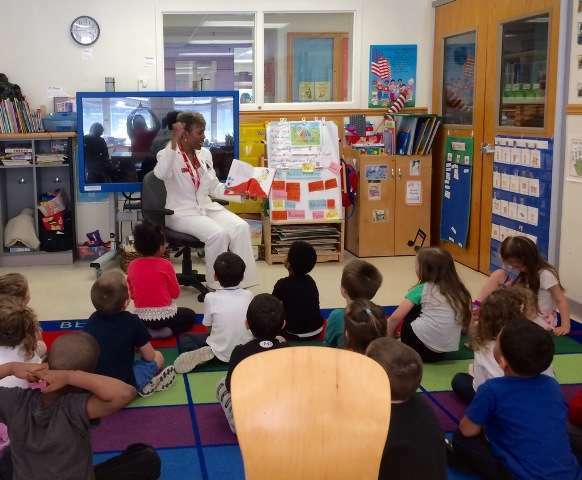 Gold Star Mothers Maryland Chapter Members were invited to read a book to the children at the Child Development Center located at the Edgewood Center located at the Main APG installation. 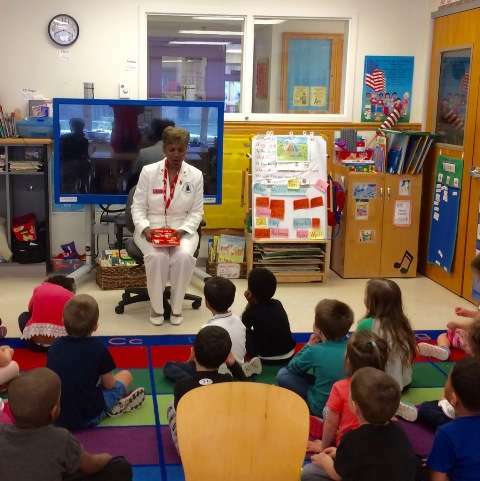 Maryland Chapter Mother, Janice Chance had the pleasure to read to children at the Edgewood Center. She read a book entitled “Green Eggs and Ham,” by Dr. Seuss. The children, especially the 4 -5 years of age, were familiar with the story so at times they joined Janice as she read some of the lines. The teachers and administrators expressed with their hands and invited Janice to come back to read to the children again. Most Gold Star members have to work during the week which prevents them from participating in the read to the children events. 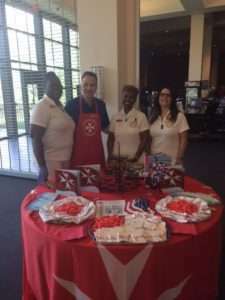 The Military Child Education Coalition Volunteer Elizabeth Groover, Survivor Outreach Services Director Michael Farlow, and Stacie Umbarger, School Liaison Officer coordinated a making connections through literature kick-off event for the Month of the Military Child activities. 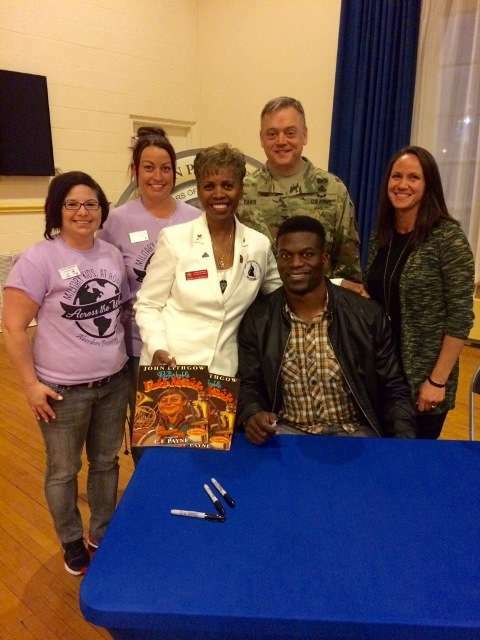 Baltimore Ravens tight-end football player, Benjamin Watson participated in the “Tell Me A Story” event. He read a book entitled “The Remarkable Farkle McBride” written by John Lithgow. Gold Star Survivors were invited to attend this event. 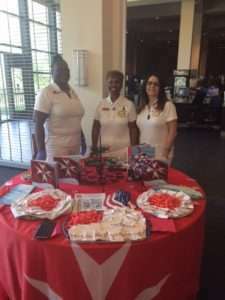 Janice Chance represented the Gold Star Mothers Maryland Chapter and she set up a display table that provided information to parents and other participants about the GSM organization. 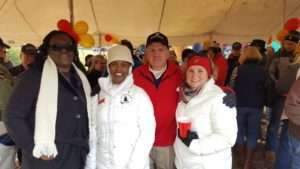 MG and Mrs Vollmecke, COL Davis and other APG leaders participated in the event. 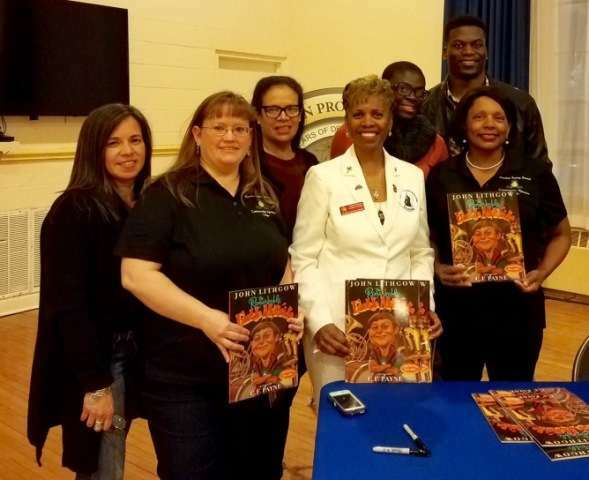 After Mr. Benjamin Watson finished reading the story to an excited group of children, Janice spoke to the children and parents on the topic “PERSEVERANCE”. There were also many organizations that came out to participate in this special event. 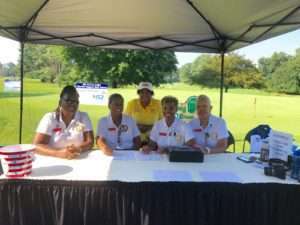 William Huff, Towson State University’s (TU) Deputy Athletic Director, two members of TU women’s basketball team, APG Spouses Club, Maryland Conservatory of Music, Edgewood Chemical Biological Center, just to name a few. 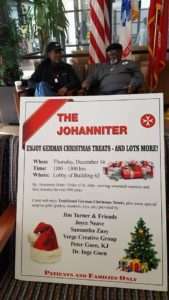 These organizations also set up displays and gave gifts to the children. The children were also excited to be able to interact with a robot that would roll around the area. Mr. Watson autographed a copy of the book that he read for all of the children. On March 31, 2017, Janice Chance was given the honor to represent the Gold Star Mothers Maryland Chapter, Inc. at the retirement ceremony for Lieutenant General Robert S. Ferrell, Army Chief Information Officer G-6 at Fort Meyer. Prior to his promotion General Ferrell served as Commanding General, Communications-Electronics Command (CECOM). LTG Robert and Mrs. Monique are huge supporters of Gold Star Mothers and families. 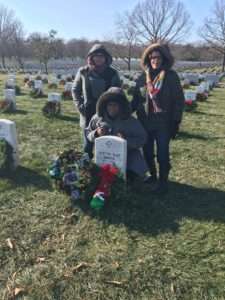 He did all that he was able to ensure that that Gold Star families were included in special events and were treated like members of the APG family. 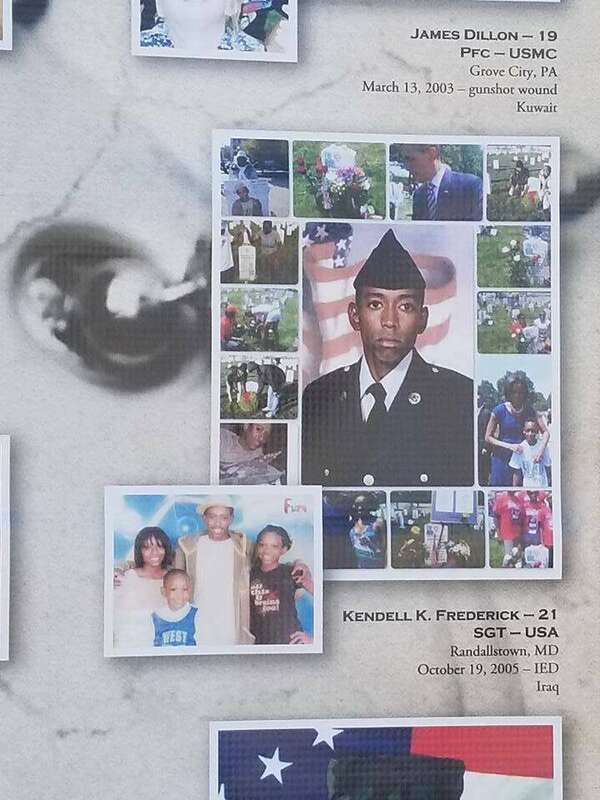 LTG Ferrell retired after 37 years of military service. 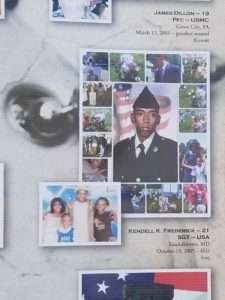 He earned many service medals and awards throughout his career. 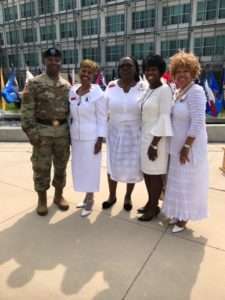 Janice expressed Congratulations and gave thanks to LTG Ferrell and Mrs. Ferrell for their Selfless Service, Sacrifice and for their unwavering support of Gold Star Mothers and families. 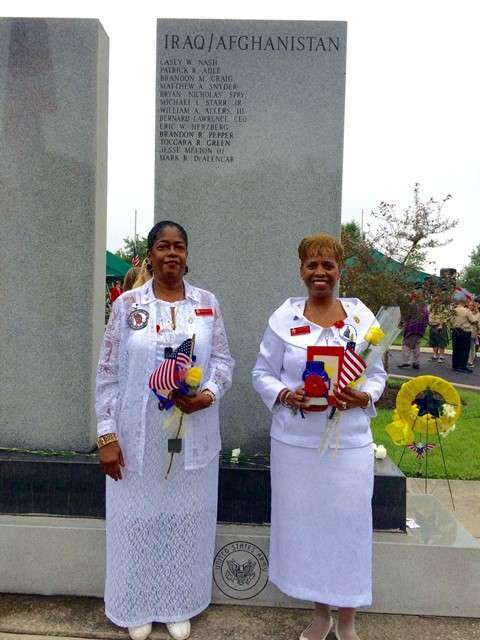 Vietnam Veterans of America Ocean City Maryland Chapter President Nelson Kelly invited Maryland Chapter Gold Star Mothers to attend and participate in the Memorial Dedication Ceremony for Private First Class Barry Howard Berger and the Welcome Home Vietnam Veterans Luncheon. PFC Berger was the only Ocean City Native born armed service member to be killed in action during combat operations in Vietnam. PFC Berger was KIA on January 10, 1971, but left a great legacy of service. The ceremony was held in the courtyard in front of City Hall that used to be the school building where PFC Berger attended. 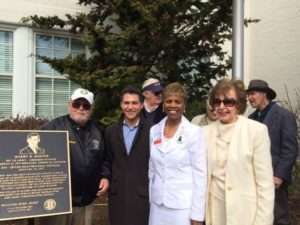 A beautiful black granite Memorial bench and a bronze Memorial plaque were dedicated in his honor. 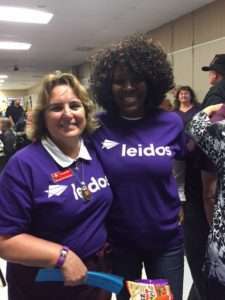 Janice Chance and Antoinette Coffland represented the Maryland Chapter. Janice was one of the guest speakers and after her message, she presented the nephew of PFC Berger with one of the Vietnam Veterans 50th Anniversary Commemorative challenge coins that the Maryland Chapter had specially made to give to Vietnam Veterans as a token of our appreciation for their selfless service and sacrifice. PFC Berger’s family members and many Ocean City residents attended the ceremony along with Veterans, elected officials, business owners and other visitors. It was a wonderful ceremony. Janice and Antoinette provided the memorial coins to other Vietnam Veterans at the luncheon. 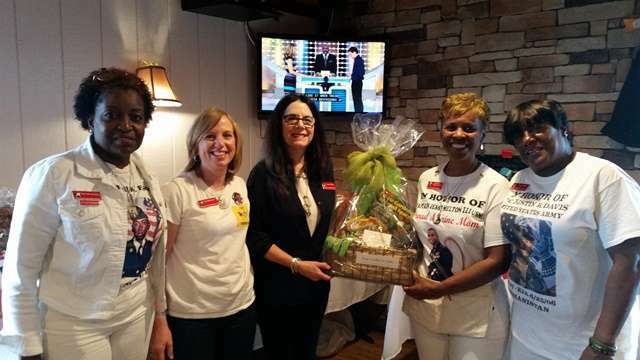 On March 25th Maryland Chapter Gold Star Mothers Janice Chance, Lauren Seidler, Paula Davis, Michelle Murphy and Gina Barnhurst supported the Maryland Patriot Guard by attending their fundraiser at Vanessa’s Corner Pub in Westminster, Maryland. 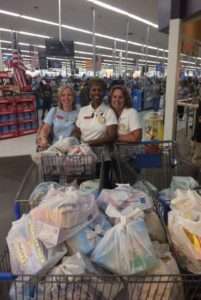 Our Chapter donated four gift baskets worth $500.00 to help the Patriot Guard raise funds. 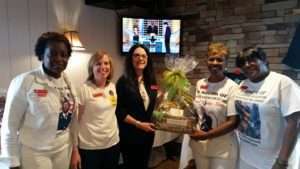 Our Maryland Chapter Gold Star Mother Lauren Seidler put together the baskets and Janice, our President sold over $800 worth of raffle tickets for the basket portion of the fundraiser. 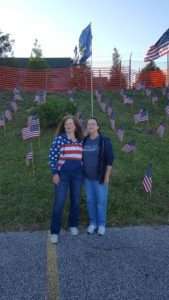 Janice was also blessed to win a homemade banner which has the quote “Land of the Free because of the Brave” on an American Flag background. Paula Davis, another Gold Star Mom, won a coffee/chocolate lovers basket. 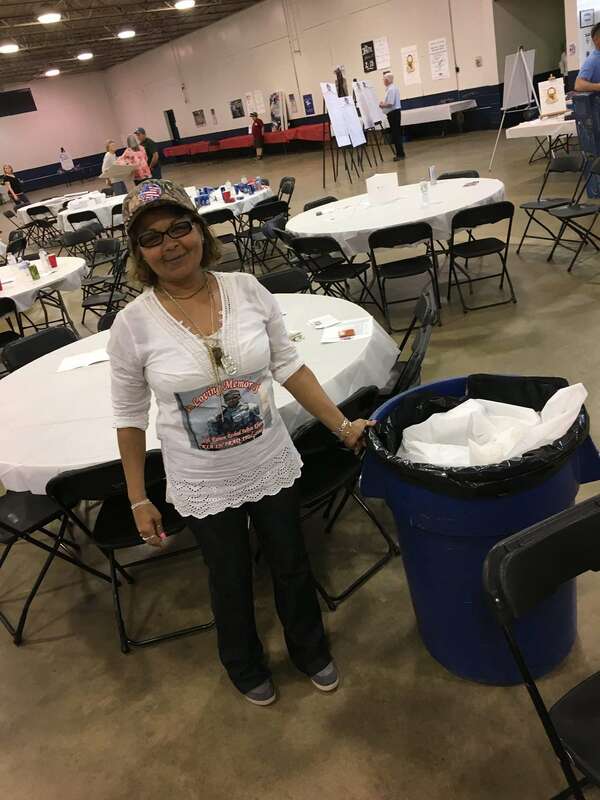 We all enjoyed a fun evening supporting our Patriot Guard friends. 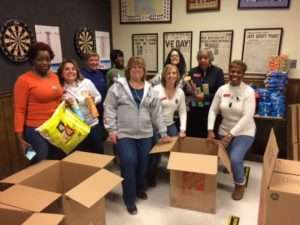 Maryland Chapter American Gold Star Mothers Janice Chance, Donna Robinson, Gina Barnhurst and Mary Wiley put together care packages for a deployed Army unit. The packages were packed with love in honor of all our member’s sons and daughters who died while serving our country. We sent a note with each package expressing our gratitude for the unit’s courage and sacrifice in serving our country. 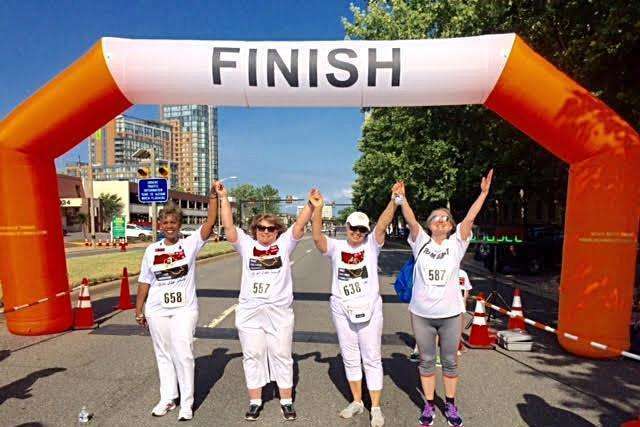 The Gold Star Mothers Maryland Chapter, Inc. is an official partner of the Towson University (TU) Athletics program. On March 25, 2017, members were invited by the TU Athletics’ Leadership Team to attend the Men’s Lacrosse game. 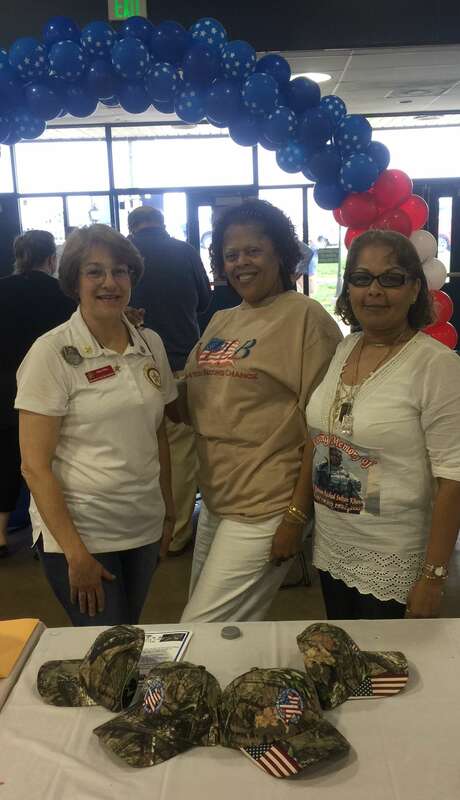 In addition, our Chapter was invited to set up a table in the stadium along with other military organizations to give out information about our organization. 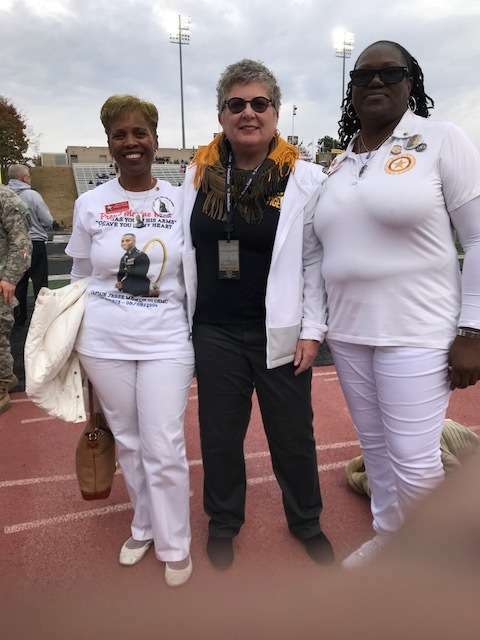 During halftime, the following Gold Star mothers were led onto the field by William Huff, Towson’s Athletic director, to be recognized and have our Fallen Heroes recognized: Janice Chance- President, Paula Davis and Gina Barnhurst – Secretary. Despite a valiant come back after the first half the Towson Tigers lost to Denver 12 to 11; however, we all enjoyed a beautiful day watching the Tigers play and talking to people about our Gold Star Mothers organization and our Fallen Heroes. 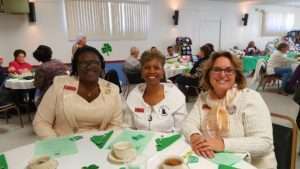 The VFW Post 521 Ladies Auxiliary in Owings Mills, Maryland held their Fashion Show and Tea on March 11, 2017. 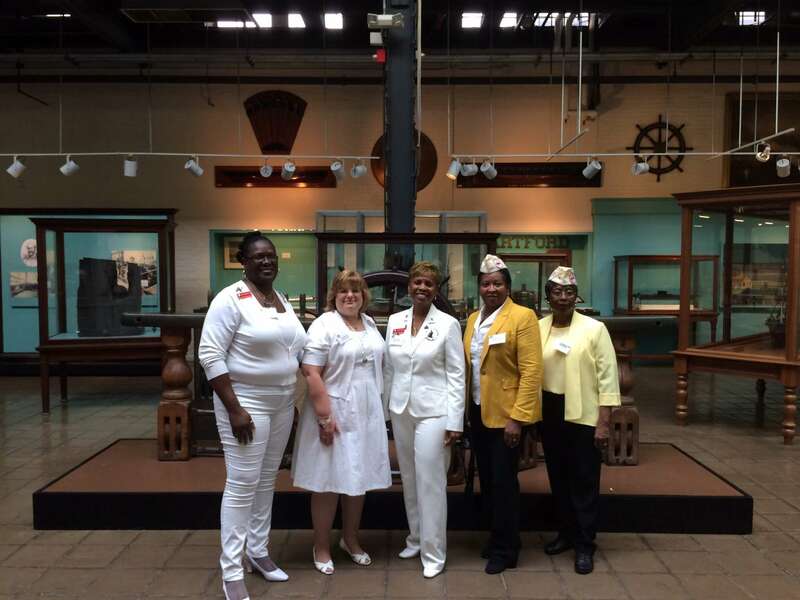 President Mrs. Evelyn Gaines and the Auxiliary members invited Maryland Chapter Moms to attend the event. Janice Chance, Theresa Mills and Donna Robinson attended in support of this fundraiser to raise money for the Maryland Center for Veterans Education and Training (MCVET). Speaker and Honorary Tea Pourer, Betty Strahm, who is also the President of the VFW Auxiliary Department of Maryland, opened the event with a strong message that our Veterans, who have given so much for our Country, should never be homeless. She commended MCVETs for their continued support to housing as well as providing valuable resources to our Veterans in order for them to lead productive lives in our society. 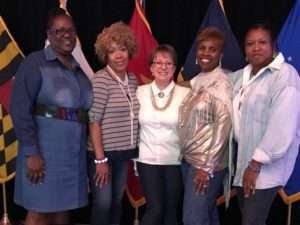 Some of the MCVET ladies participated as models as they proudly strutted down the runway to music that helped create an atmosphere of fun and excitement. The Luck of the Irish came out in full force at Annapolis’s St. Patrick’s Day parade on Sunday, March 5th. 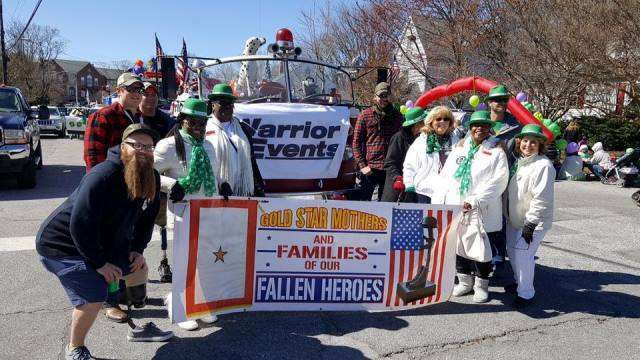 Warrior Events invited the Maryland Gold Star Mothers Chapter members to participate in the annual St. Patrick’s Day parade with wounded warriors and their families. This was our second time participating and every year, we are honored to be part of this event. 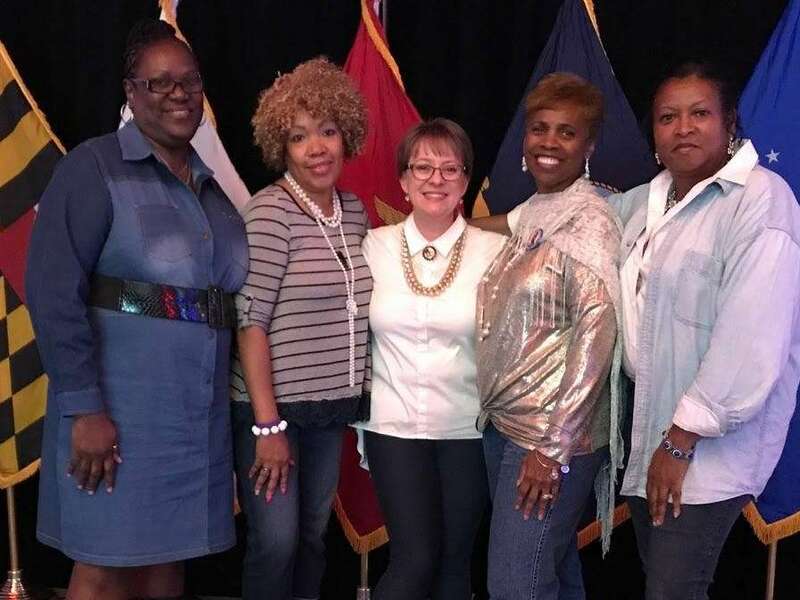 Gold Star Mothers Michelle Murphy, Theresa Mills, Donna Robinson and Rosemarie Ceo were also joined by Ken Murphy (Gold Star Father), Mary Gerity (Gold Star Sister of PFC Charles S. Walsh, USMC), and Rosemarie’s sister, Dorcina Moulden (Gold Star Aunt of Army Spc. Bernard Ceo). After the parade, Gold Star family members were invited to lunch at Armadillos and enjoyed listening to the band, Dublin 5. 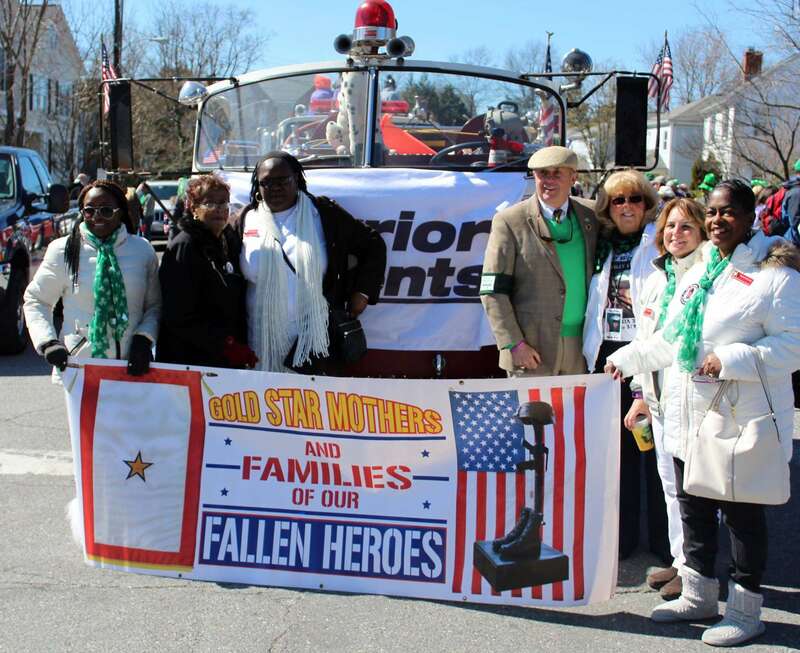 Maryland Gold Star Mothers would like to thank Bob Saunders, John O’Leary and Warrior Events for coordinating and planning this successful parade every year. 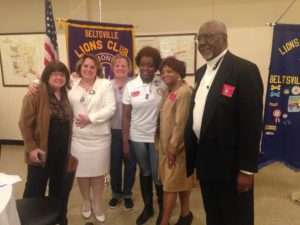 Maryland Gold Star Mothers Theresa Mills and Michelle Murphy were invited to speak at the Beltsville Lions Club’s monthly meeting located at the Old Line Spirits and Bistro in Beltsville, Maryland. Michelle and Theresa were treated to dinner and shared stories about their children as well as the history of the American Gold Star Mothers. Several Veterans, who are members, were also in attendance. 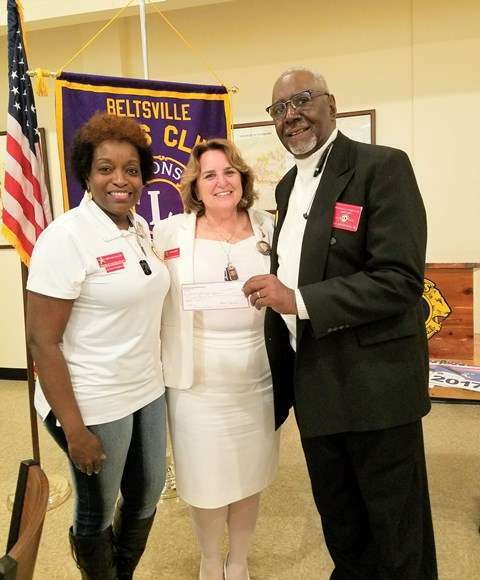 After Michelle and Theresa finished speaking, the Lions Club presented a check for $250 as a donation to help us continue our mission to Honor through Service for our active-duty service members, Veterans and their families. We are truly thankful for their support, friendship and fellowship to serve. 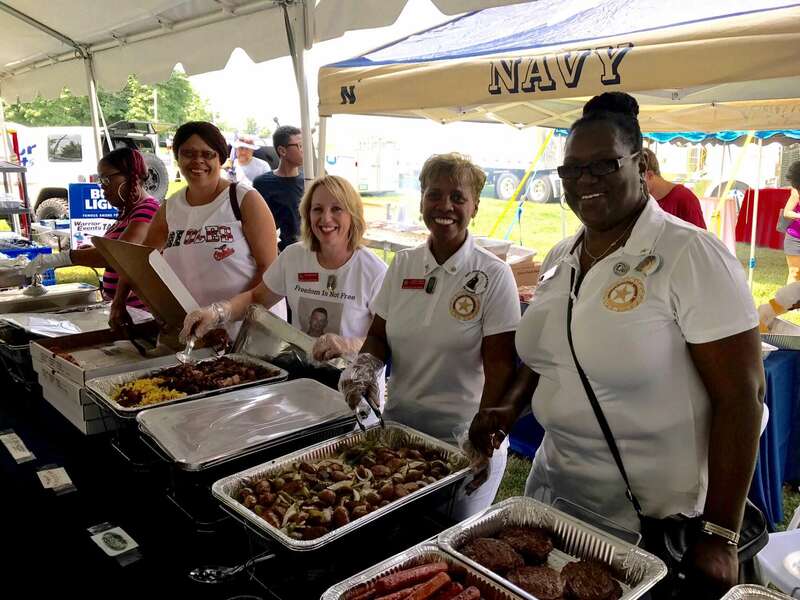 Maryland Gold Star Mothers, Janice Chance, Michelle Murphy, Theresa Mills, Lauren Seidler, and Donna Robinson as well as Gold Star family members Ken Murphy and Peatoria Purdue volunteered in shifts to help raise money for the Fisher House Foundation. 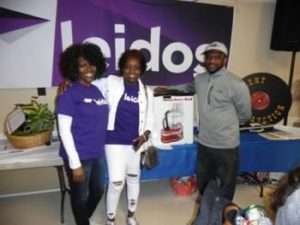 We were invited to partner with the Team Leidos employees that was led by Amy Kriner, we assisted with various duties including silent auction, 50/50 raffle, baked goods and the money wheel. The Maryland Marathon Jam invites local bands to participate in 12 hours of non-stop bluegrass music. One of the most memorable events for this fundraiser was The Knights of Columbus color guard and was followed by the Vietnam Veterans lapel pin presentation. This pin, which was authorized on behalf of Congress, was given to each Vietnam War Era Veteran who were in attendance. Even though this pin may be small, it came as a big THANK YOU from a grateful Nation. 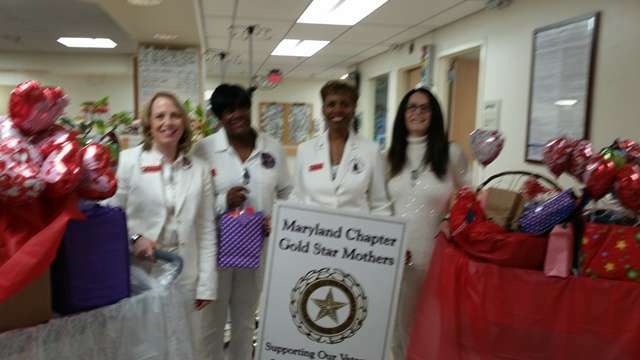 Gold Star Mothers Maryland Chapter members Gina Barnhurst, Paula Davis, Janice Chance and Lauren Seidler prepare to give out Valentines balloons, knit hats, puzzle books and toiletries to our Veterans at the Baltimore VA Medical Center as part of The National Salute to Veterans week February 12th to February 19th. 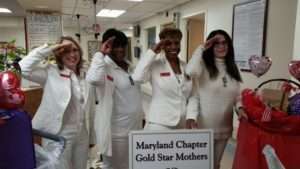 Gina Barnhurst, Paula Davis, Janice Chance and Lauren Seidler give a Gold Star Mothers Hand salute to the Veterans at the Baltimore VA Medical Center, Greene Street as part of National Salute to Veterans week. 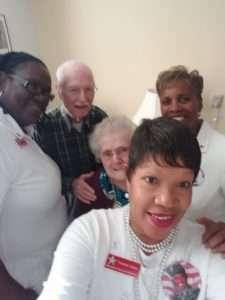 Gina Barnhurst, Paula Davis, Janice Chance and Lauren Seidler get a picture with Dolline the relative of one of the Veterans at the Baltimore VA Medical Center located on Greene Street who received a Valentine balloon, puzzle books and other gifts from our Chapter. Each year, the week of February 14th is your opportunity to say thank you to a special group of men and women. More than 98,000 Veterans of the U.S. armed services are cared for everyday in Department of Veterans Affairs (VA) medical centers, outpatient clinics, and nursing homes. During the National Salute, the VA invites individuals, Veterans groups, military personnel, civic organizations, businesses, schools, local media, celebrities and sports stars are invited to participate in a variety of activities at the VA medical centers. The activities and events include special ward visits and Valentines distributions; photo opportunities; school essay contests; special recreation activities and Veteran recognition programs. 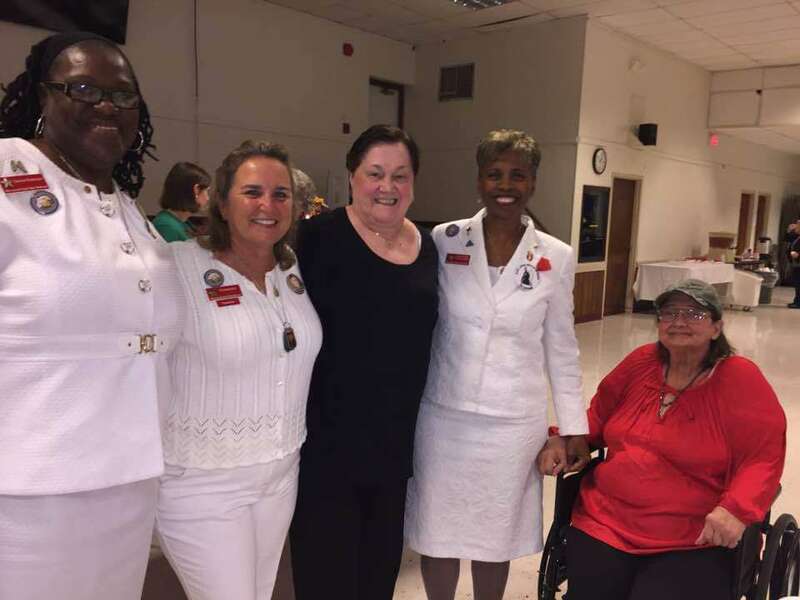 This year, four members of the Maryland Chapter, Paula Davis, Gina Barnhurst, Janice Chance and Lauren Seidler had the distinct honor to spend several hours with our Heroes and their family members to express our thanks for their selfless service and sacrifice to our country. 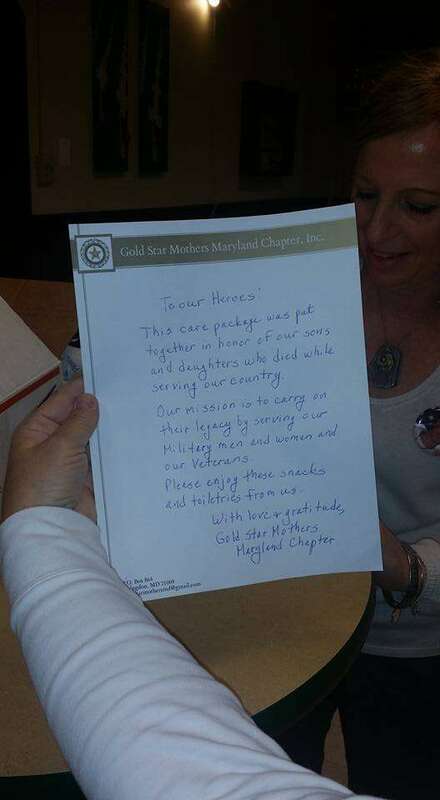 We also rendered what we lovingly refer to as our “Gold Star Mothers Hand Salute” to each Hero. 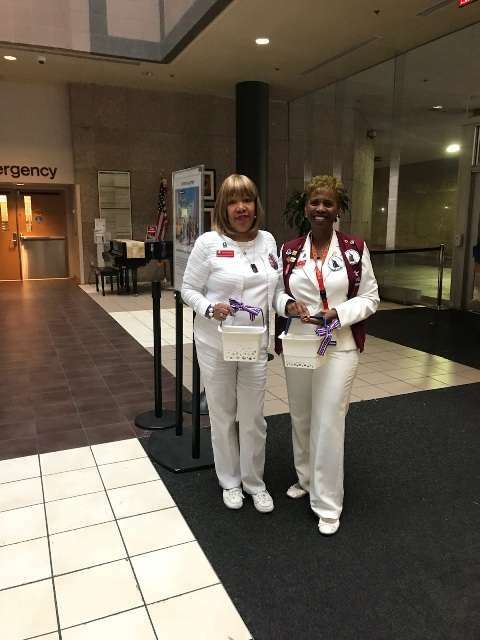 We distributed handmade Valentines cards from school children, balloons, puzzle books, knit hats and toiletries to the patients at the VA Medical Center located on Greene Street in Baltimore MD. It was great to talk and spend time with our hospitalized Heroes and their family members. Maryland Gold Star Mothers met for their first bi-monthly meeting for the new year and afterwards, Janice Chance, Michelle Murphy, Yvonne Green, Theresa Mills, Gina Barnhurst, Paula Davis, Lauren Seidler, Mary Jane Walton and Kelly Swanson filled four large boxes of cookies, candy, chips, dip, licorice, and many toiletries for three deployed troops. 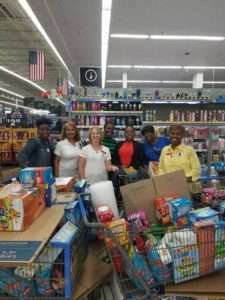 All goodies, supplies and postage were purchased from monetary donations that we receive throughout the year from gracious donors. Before closing the boxes, we added a special hand-written note to let them know that we are proud and thankful for their service and sacrifice. It is always a pleasure to send our deployed troops treats from home. 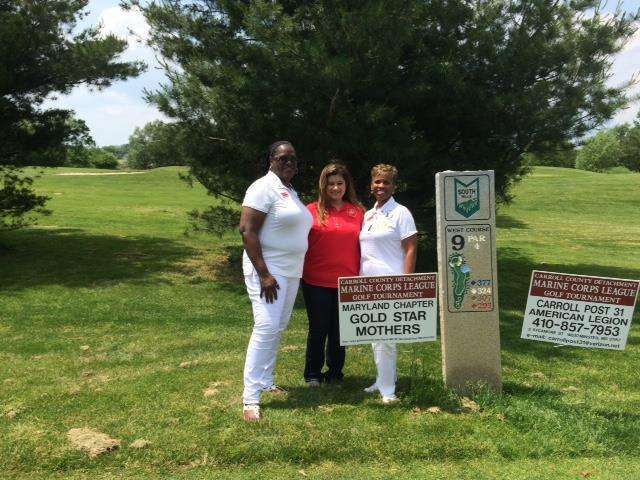 The Gold Star Mothers Maryland Chapter, Inc. is an official partner of the Towson University (TU) Athletics program. 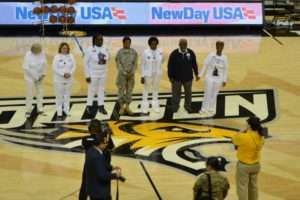 On January 14, 2017, members were invited by the TU Athletics’ Leadership Team to attend a special luncheon in honor of Major Robert Marchanti and Towson’s Military Appreciation Day that featured the Towson Tigers basketball game against the Northeastern University Huskies. Major Robert Marchanti, US Army National Guard, who was a TU alumnus, made the ultimate sacrifice on February 25, 2012 while serving in Afghanistan. A special endowed scholarship was established in his honor. 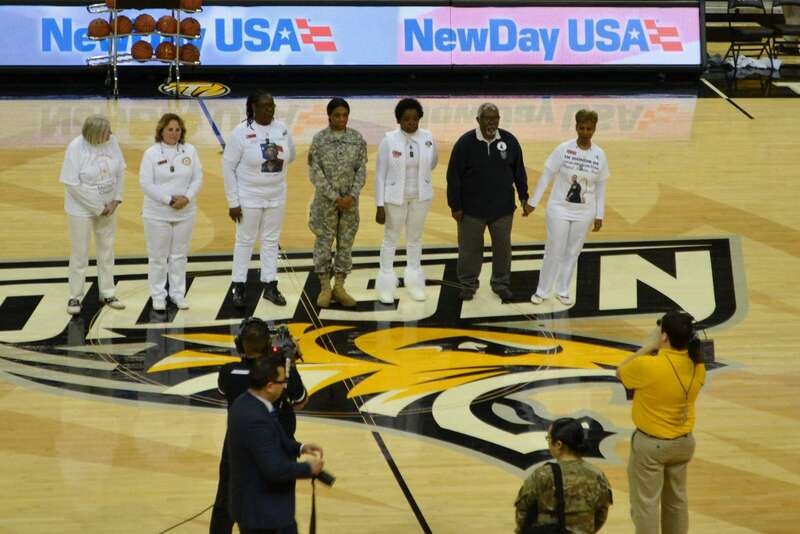 During halftime, the following Gold Star mothers were recognized along with other family members at center court: Janice Chance (husband Charlton) Michelle Murphy (daughter Kendra – US Army Cadet), Donna Robinson, Tracy Miller and Theresa Mills. 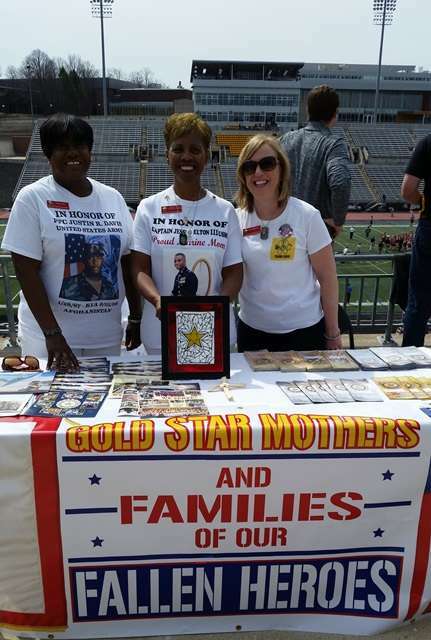 Maryland Gold Star Mothers were also honored at the TU football game held on November 5, 2016, and have also been invited to participate at their March 25th Military Appreciation lacrosse game. Moms may bring up to three people to attend the games, and a fair-like atmosphere prevails at these events. 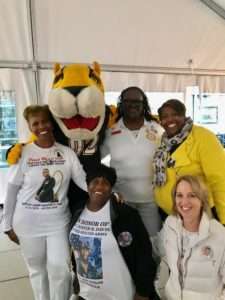 It was truly a memorable day and we were all thrilled because Towson University’s Tigers won the game. Yeah!! 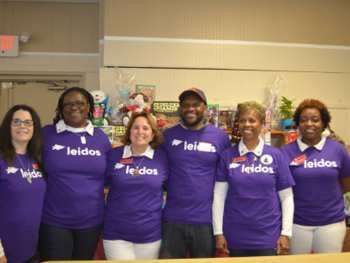 In 1994, Congress designated MLK Day as the first and only Federal holiday observed as a national day of service. 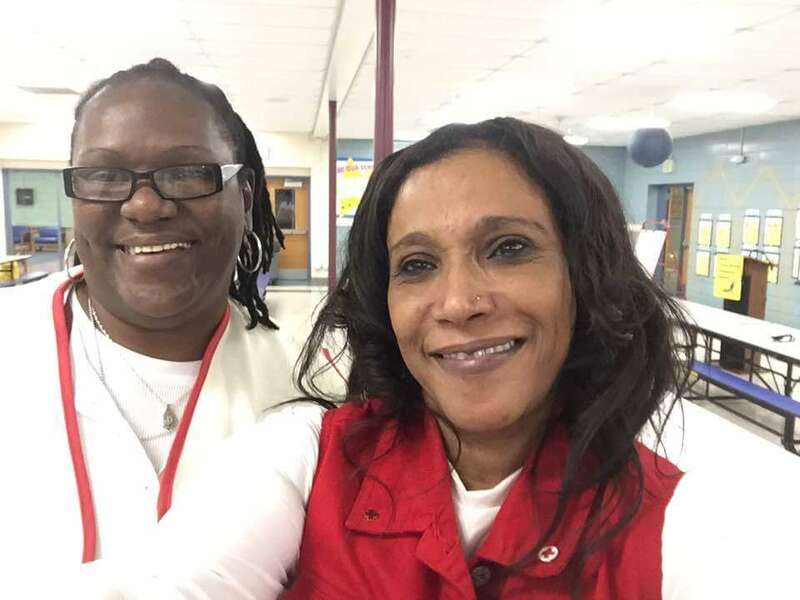 On January 16, 2017, Donna Robinson and Janice Chance represented the Gold Star Mothers Maryland Chapter at the American Red Cross (ARC) Greater Chesapeake Region and the Aberdeen Fire Department’s Martin Luther King Day Home Fire Prevention Campaign Day of Service. 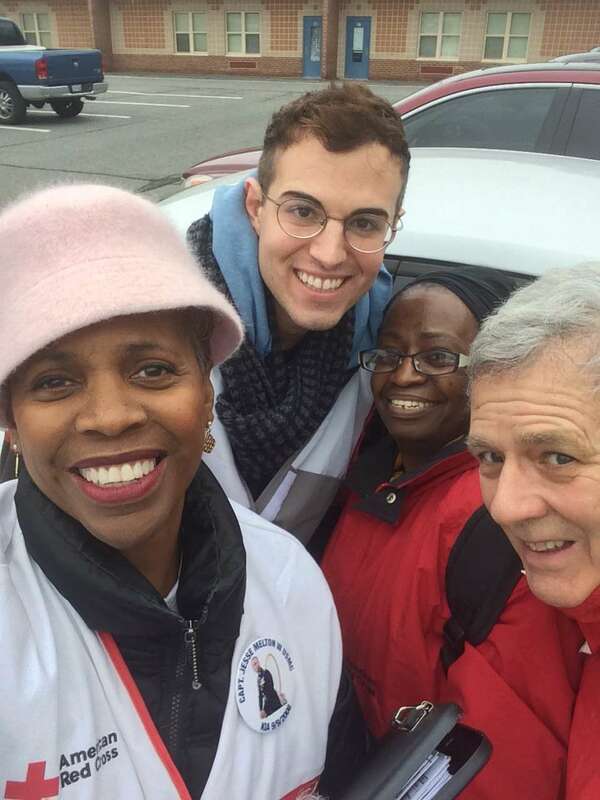 They joined many volunteers who went out in teams to canvass at-risk neighborhoods in the Aberdeen Proving Ground community. The teams worked together to ensure that smoke detectors were installed in as many homes as possible and also provided fire safety education and materials. 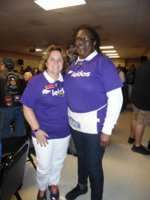 Janice served as one of the educators on team number seven. The two gentlemen on her team successfully installed and/ or tested existing smoke detectors to ensure that they were operating. A few of the smoked detectors that did work were so old that new ones were installed. 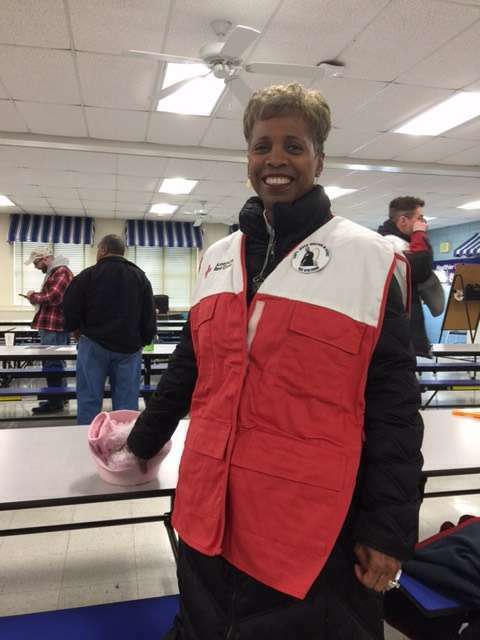 Donna stayed at the Aberdeen Hall Cross Roads Elementary school that was the ARC campaign base. 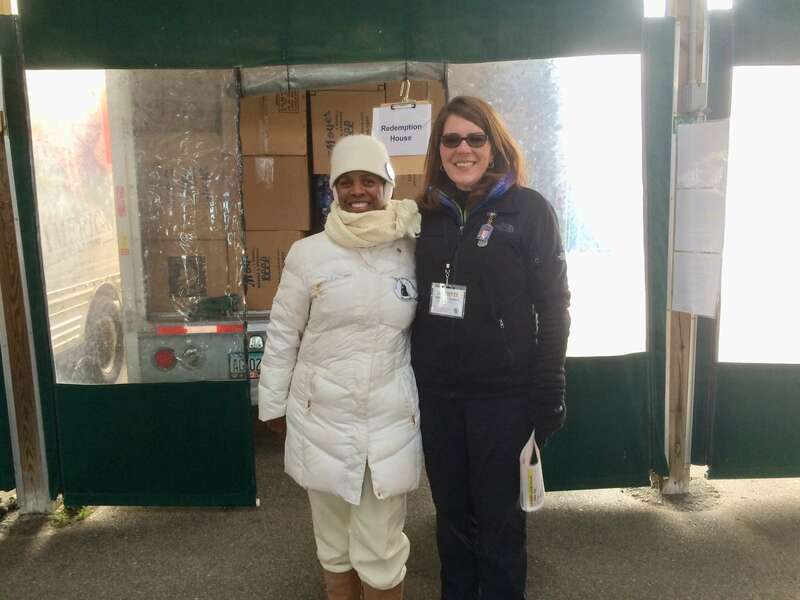 Donna assisted with registration and other duties. It was great to serve alongside so many friendly willing volunteers and to know that our service made a positive difference to the people in community. 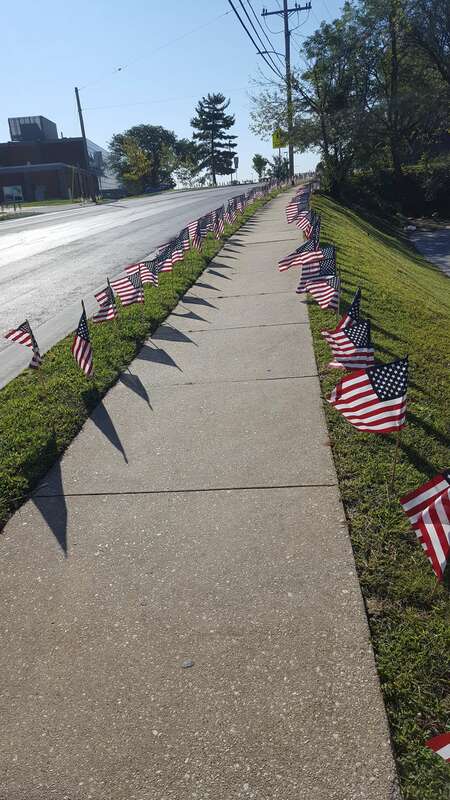 The residents expressed their appreciation and gave us their well wishes. Having working smoke detectors will hopefully prevent injuries and death due to house fires. The National ARC goal is a 25% reduction in home fire deaths over the next five years. The ARC will be organizing another Home Fire Campaign within the next two months in the Aberdeen area. 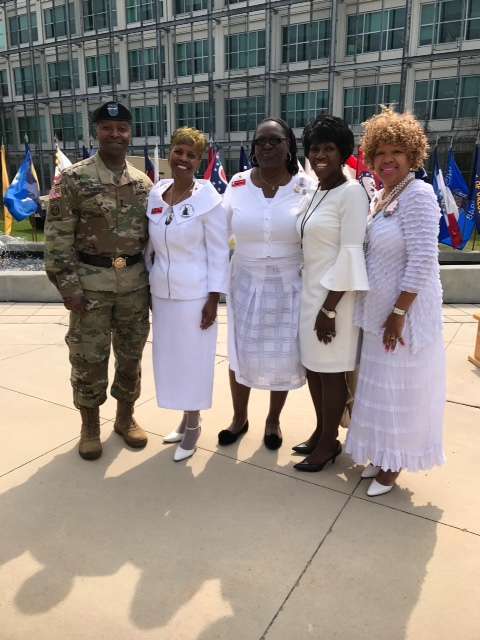 Major General (MG) Bruce T. Crawford Commanding General CECOM invited Gold Star family members to their annual “Why We Serve” Ceremony. 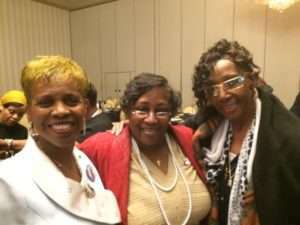 Michelle Murphy, Donna Robinson and Janice Chance represented the Maryland Chapter. 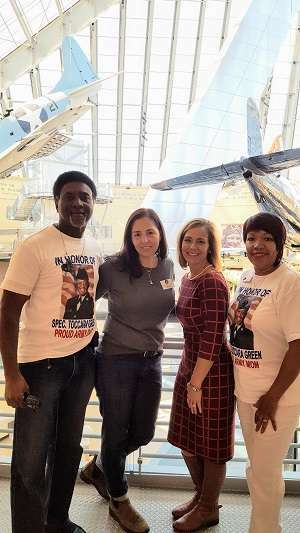 Michelle’s daughter Kendra Murphy, Cadet US Army, Gold Star wife Mrs. Tonya Armstead and one of the biggest Gold Star family supporters, Mr. Michael Farlow – APG’s Survivor Outreach Service coordinator, were also in attendance. Prior to his message, MG Crawford recognized and thanked the veterans and honored two WWII Veterans, in addition to recognizing Gold Star families. It was a pleasure and honor to attend and witness the Officers, Enlisted Service members, and Army Civilian Employees raise their right hand and take an oath signifying their allegiance and dedication to duty, etc. 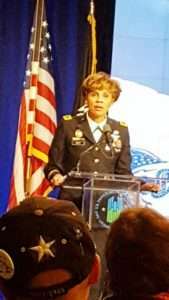 MG Leslie C Smith, Deputy Inspector General and Office of the Secretary of the Army was the keynote speaker. 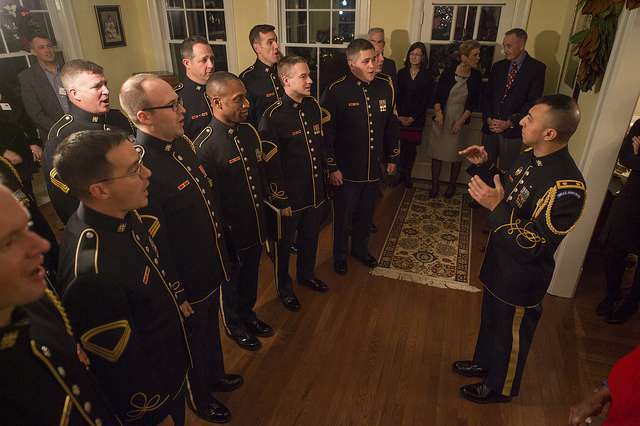 He surprised four active duty Heroes by asking them to stand and share what a specific Army value means to them. MG Smith also called on four service members to demonstrate the value of trust. One of the service members acted out the role of an injured team member that needed to be carried to safety. The other three members had to work as a team to lift and carry him to safety. MG Crawford and MG Smith both gave a powerful message reminding our active duty Heroes and civilian employees why they serve and thanked them for their invaluable service and commitment. MG Crawford also had the honor of swearing in a group of new recruits. Ms. Robinson and the special choir sang several patriotic songs that helped to set the mood for the ceremony. After the ceremony, the Gold Star family members were able to meet, thank and mingle with our Heroes, civilian employees, community leaders and citizens. It was truly a memorable event.